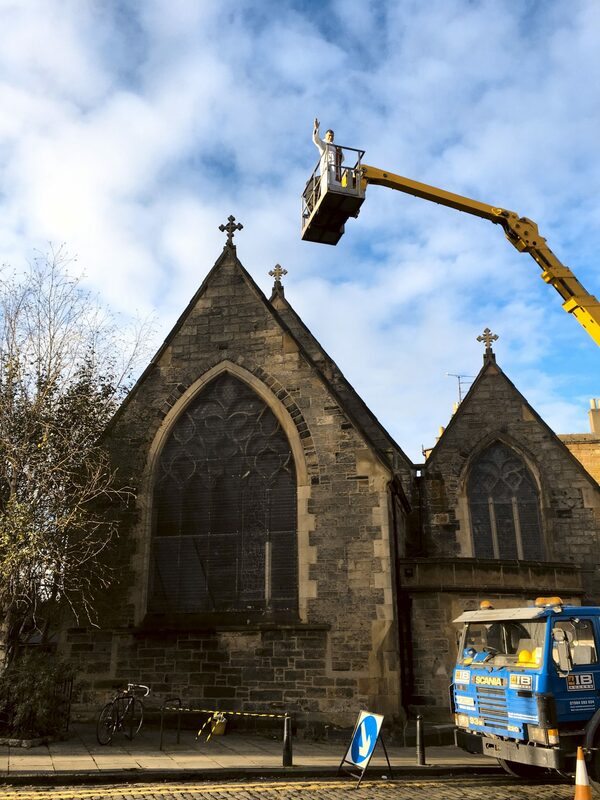 Photographs – St Vincent's Chapel, Edinburgh, the village church in the heart of the city. 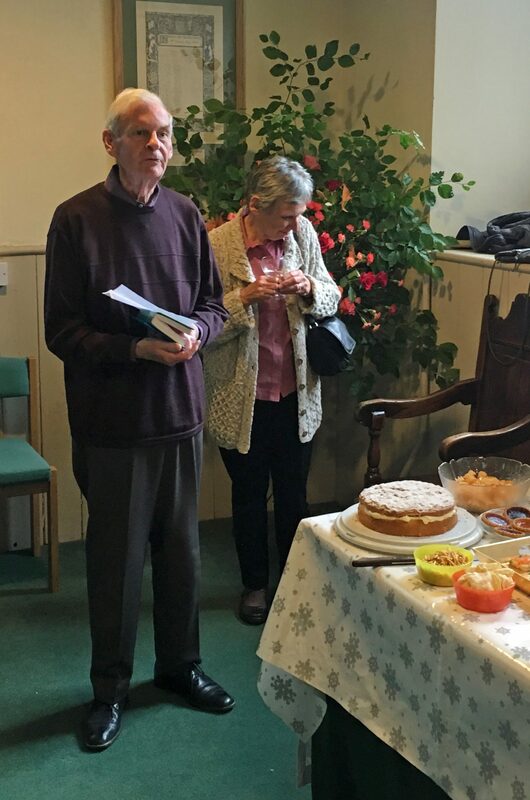 The Rector, Canon Allan Maclean, invites Peter Slater, a longstanding member of the congregation, to cut his 90th birthday cake following the morning service on Sunday 10th March 2019. 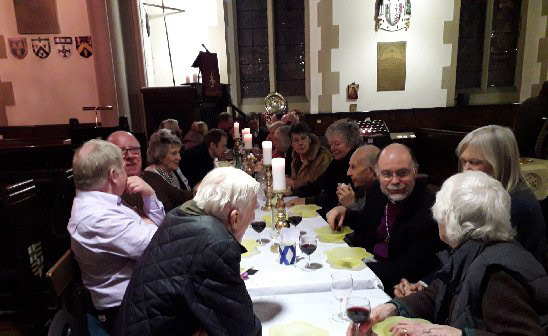 Members of the congregation enjoyed a celebratory meal in church following Evensong on St Vincent’s Day, 22 January 2019, with guests the Bishop of Edinburgh and Mrs Armes. 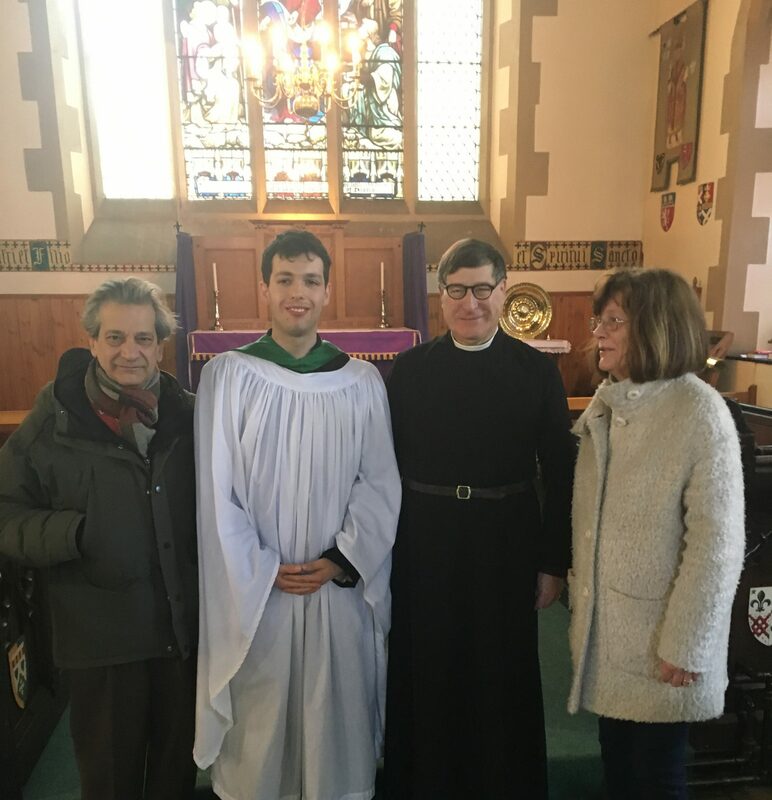 Our Sacristan, Christopher Hartley, is awarded the Diocese of Edinburgh St Cuthbert Award by the Bishop of Edinburgh, with the Rector watching, on 10th January 2019. 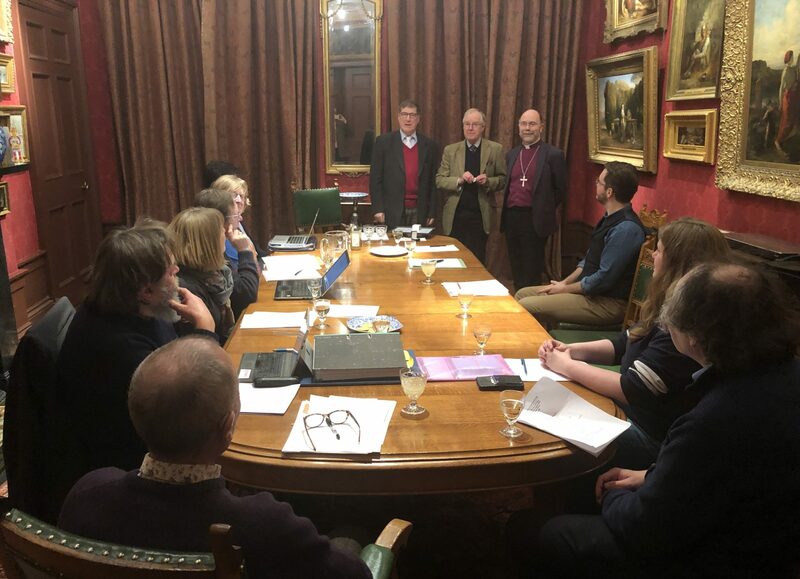 Members of the Vestry of St Vincent’s watch as the Bishop of Edinburgh awards our sacristan, Christopher Harley, the Diocese of Edinburgh St Cuthbert Award at its meeting in India Street on 10th January 2019. 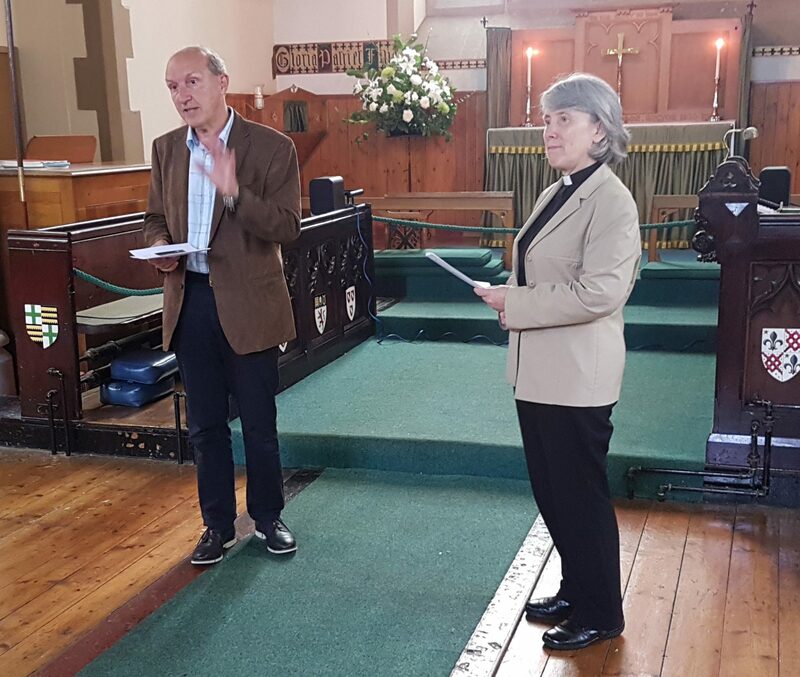 The Consul-General of the Republic of Poland is seen speaking at the Office Launch of the first Edinburgh Festival of the Sacred Arts in the Fringe held at St Vincent’s between 12th and 18th August 2018. Watching seated, from left, is Sir Timothy O’Shea, chair of the Edinburgh Fringe Society, Deirdre Brock MP, the Bishop of Edinburgh, the Hon Barnaby Miln, the Reverend Professor Gordon Graham (Director of the Sacred Arts Festival), the Rector of St Vincent’s, Canon Allan Maclean and the Reverend John Cowie, Minister of Stockbridge Parish Church. Following the opening of the Icon Exhibition by the Consul-General of Poland Mr Ireneusz Truszkowski, icon artists Basia Mindewicz (in the centre) and Anna Makać (front right) talk to their guests at St Vincent’s on Monday 13th August 2018. 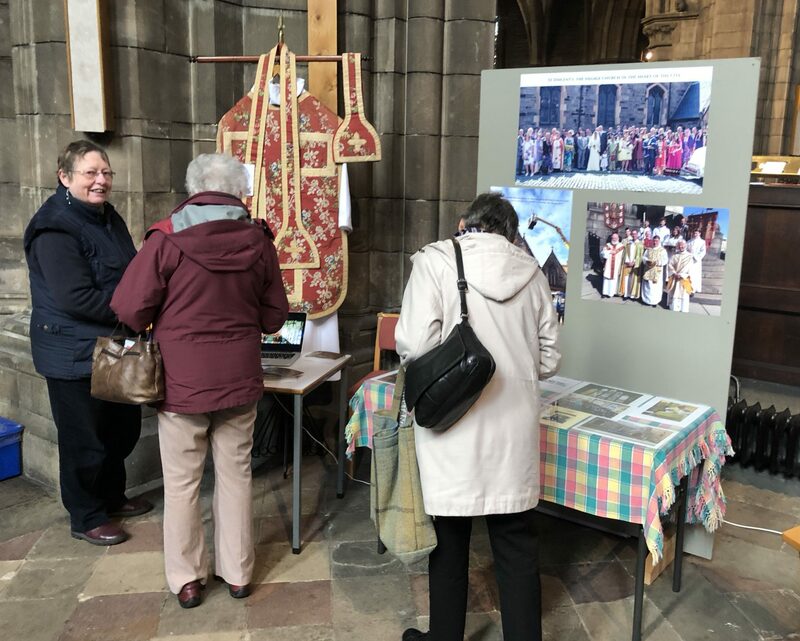 The icons are shown prior to the opening of exhibition, held in the north transept of St Vincent’s between 12th and 19th August 2018 as part of the Edinburgh Festival of the Sacred Arts in the Fringe. The Art of the Icon and European Christian Painting was the subject of an illustrated lecture given by the Reverend Professor Gordon Graham at St Vincent’s on Monday 13th August 2018 as part of the Edinburgh Festival of the Sacred Arts in the Fringe. Gordon Graham is Director of the Sacred Arts Festival. His latest book Philosophy Art and Religion is published by Cambridge University Press. 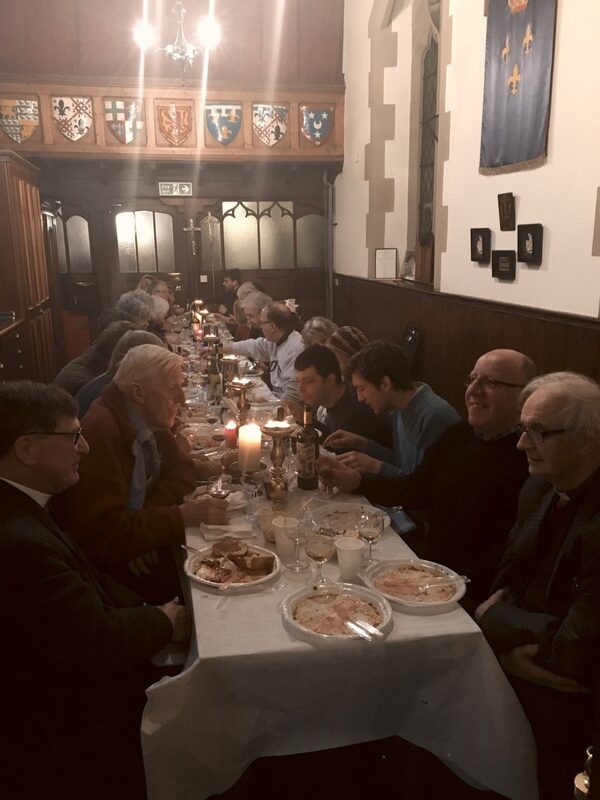 Guests in the Refectory of St Vincent’s on Monday 13th August 2018 following the Official Opening of the Edinburgh Festival of the Sacred Arts in the Fringe. 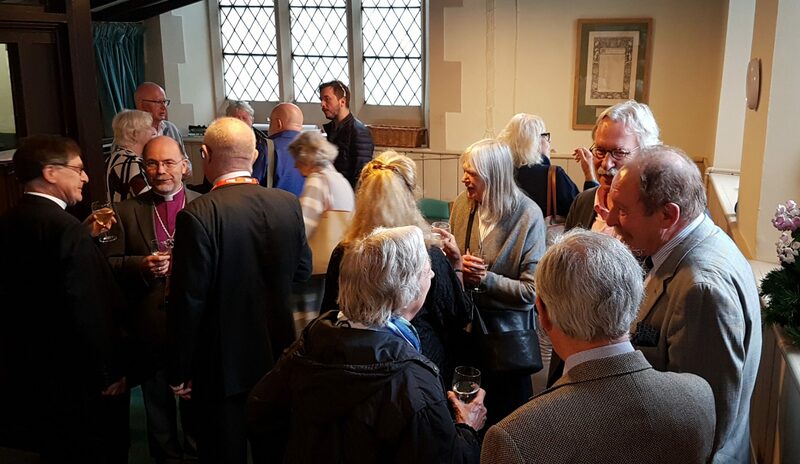 To the left, the Bishop of Edinburgh is seen talking to the Rector of St Vincent’s Canon Allan Maclean and the Hon Barnaby Miln, a member of the General Synod of the Scottish Episcopal Church. 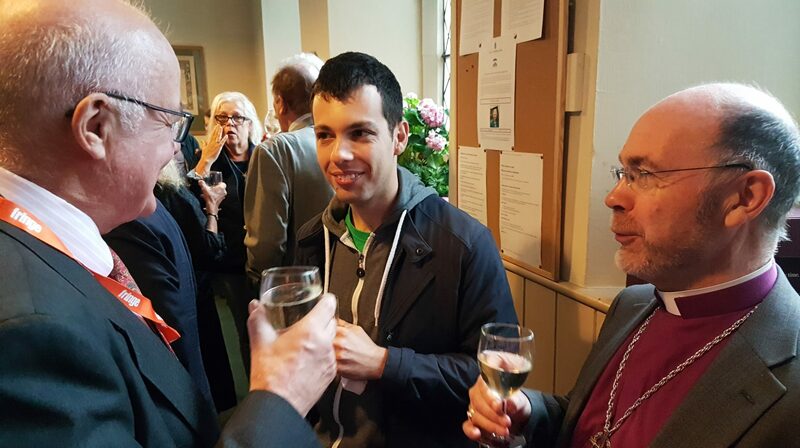 The Hon Barnaby Miln (Property Convener), Niccolò Aliano (Assistant Sacristan) and the Bishop of Edinburgh in the Refectory of St Vincent’s on Monday 13th August 2018 following the Official Opening of the Edinburgh Festival of the Sacred Arts in the Fringe. 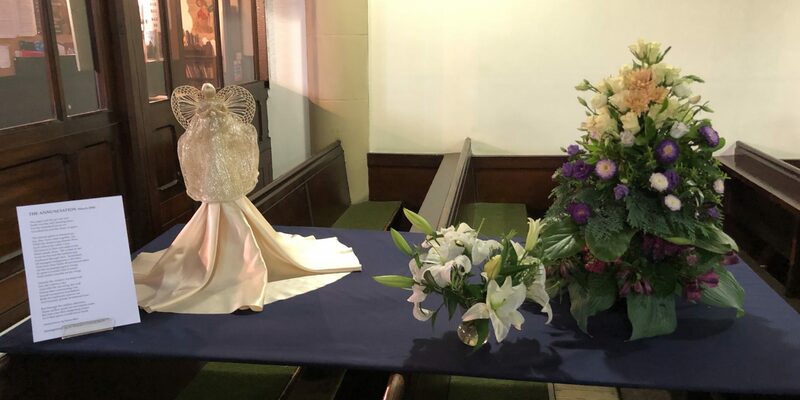 The Dean of the Diocese of Edinburgh, the Very Reverend Frances Burberry, opened the Floral Art for the Feast Day of Saint Mary on Wednesday 15th August 2018 with prayers, as part of the Edinburgh Festival of the Sacred Arts in the Fringe. 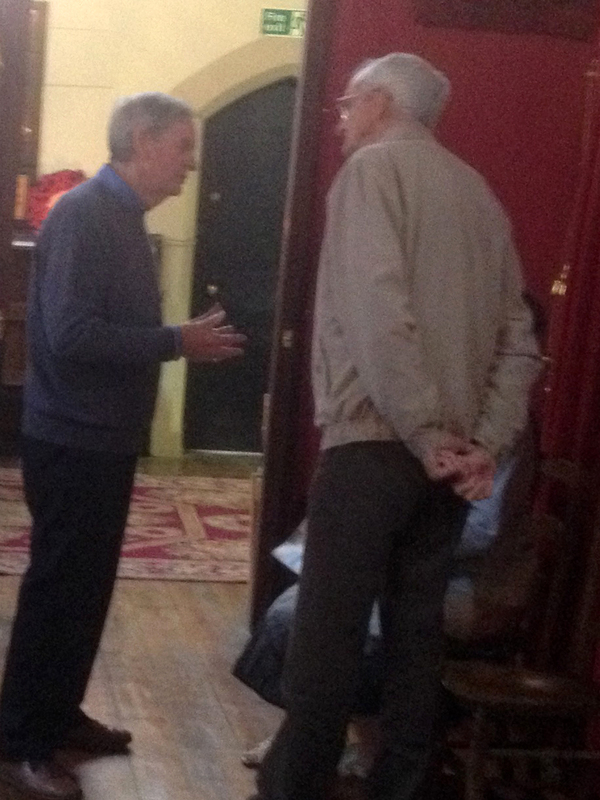 She is seen here the the Director of the Festival, the Reverend Professor Gordon Graham. 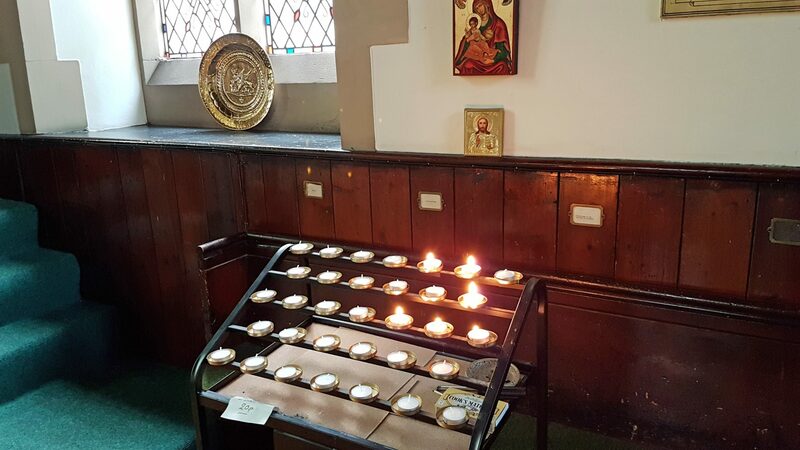 Good Friday – from Old St Paul’s Church. One of the displays for the Feast Day of Saint Mary on Wednesday 15th August 2018 as part of the Edinburgh Festival of the Sacred Arts in the Fringe at St Vincent’s. 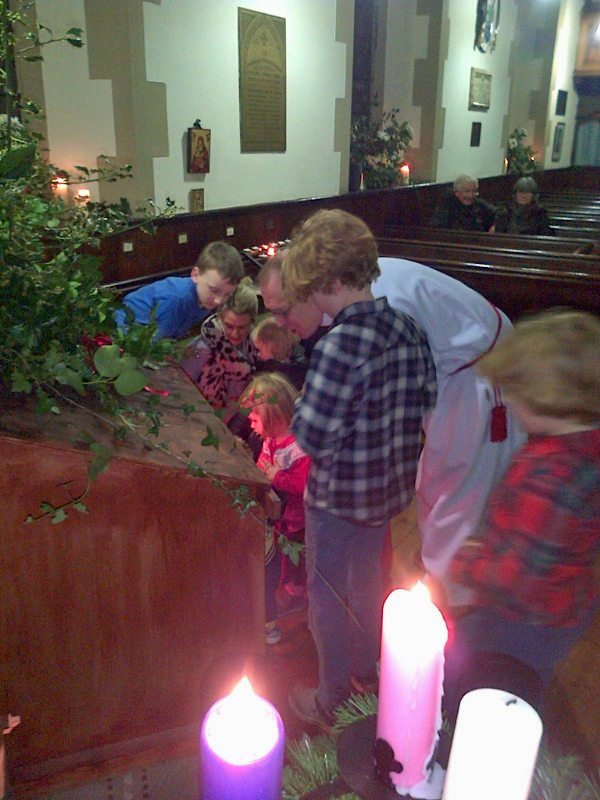 The Purification – from the Church of the Good Shepherd, Murrayfield. One of the displays for the Feast Day of Saint Mary on Wednesday 15th August 2018 as part of the Edinburgh Festival of the Sacred Arts in the Fringe at St Vincent’s. The Annunciation – from St Ninian’s Church Comely Bank. 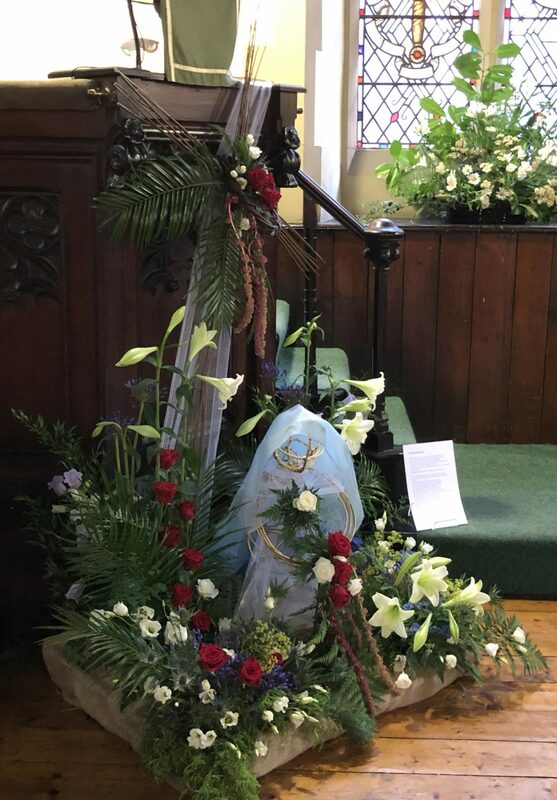 One of the displays for the Feast Day of Saint Mary on Wednesday 15th August 2018 as part of the Edinburgh Festival of the Sacred Arts in the Fringe at St Vincent’s. 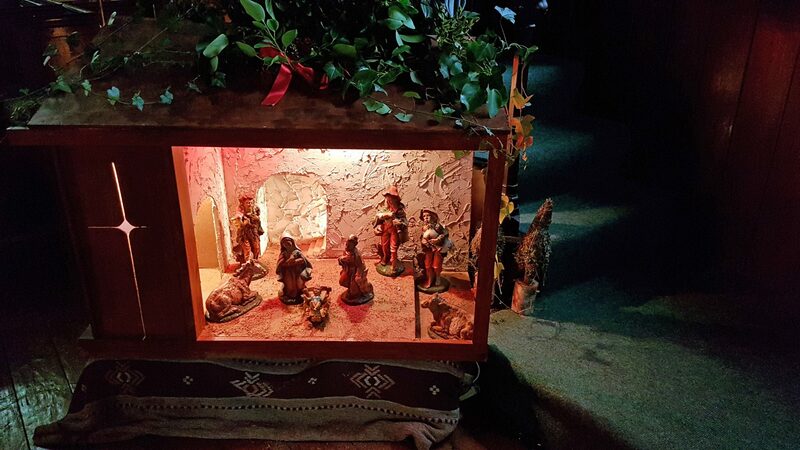 The Nativity – from St John the Evangelist Church. Princes Street. One of the displays for the Feast Day of Saint Mary on Wednesday 15th August 2018 as part of the Edinburgh Festival of the Sacred Arts in the Fringe at St Vincent’s. The Visitation – from St Vincent’s. One of the displays for the Feast Day of Saint Mary on Wednesday 15th August 2018 as part of the Edinburgh Festival of the Sacred Arts in the Fringe at St Vincent’s. The Wedding at Cana – from St Mary’s Cathedral, Palmerston Place. 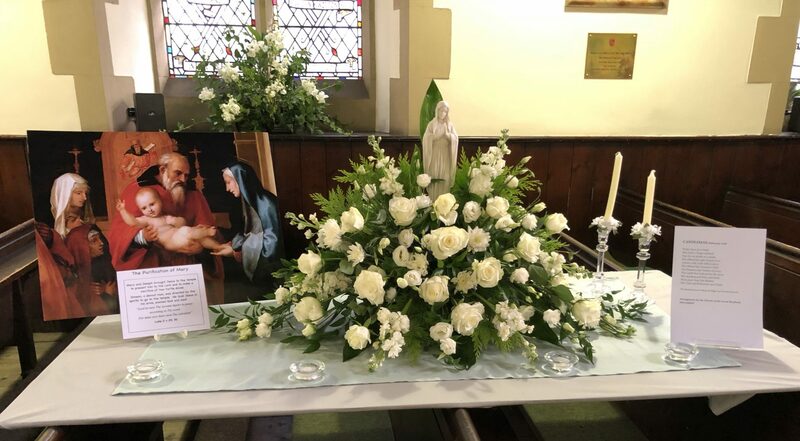 One of the displays for the Feast Day of Saint Mary on Wednesday 15th August 2018 as part of the Edinburgh Festival of the Sacred Arts in the Fringe at St Vincent’s. 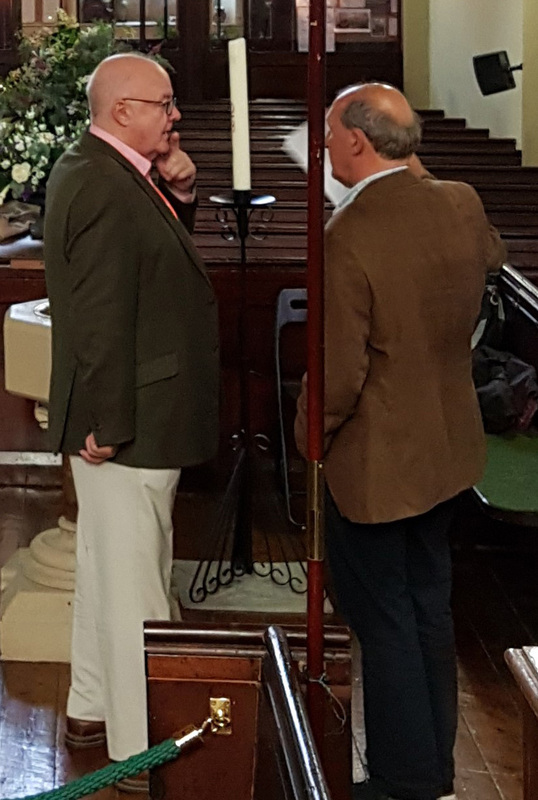 In this picture are the two organisers of the Sacred Arts Festival, the Hon Barnaby Miln (left, Property Convener of St Vincent’s) is seen discussing progress with the Reverend Professor Gordon Graham, director of the Festival. at St Vincent’s on Wednesday 15th August 2018. 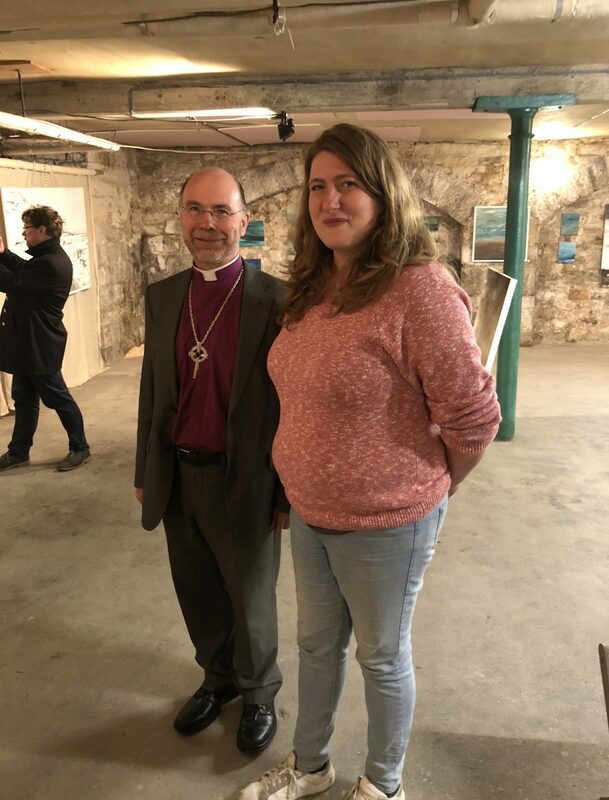 On Monday 13th August 2018 Augusta Maclean welcomed the Bishop of Edinburgh to her Fringe solo art exhibition in the crypt of St Vincent’s. 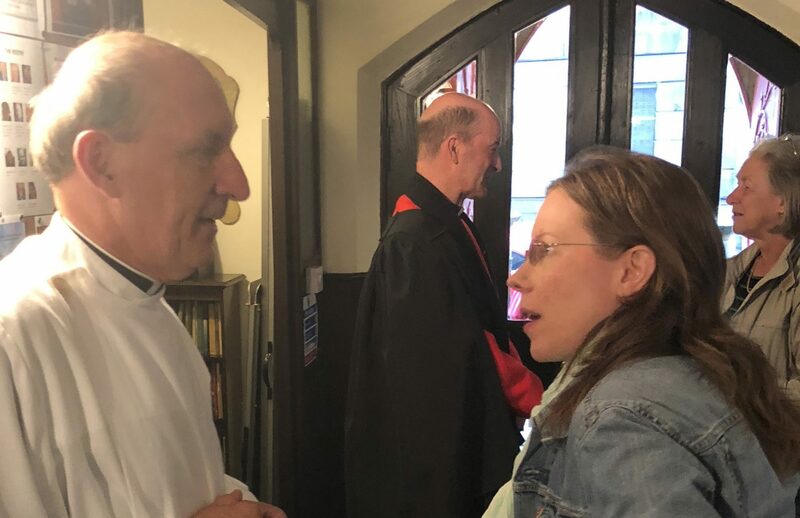 The Reverend Professor Gordon Graham is seen speaking to congregation member Jennifer Lawson following the special Sunday morning service on 12th August 2018 – at the start of the Sacred Arts Festival at St Vincent’s. In the background can be seen the guest preacher, the Reverend Professor David Fergusson OBE, Principal of New College, Edinburgh. 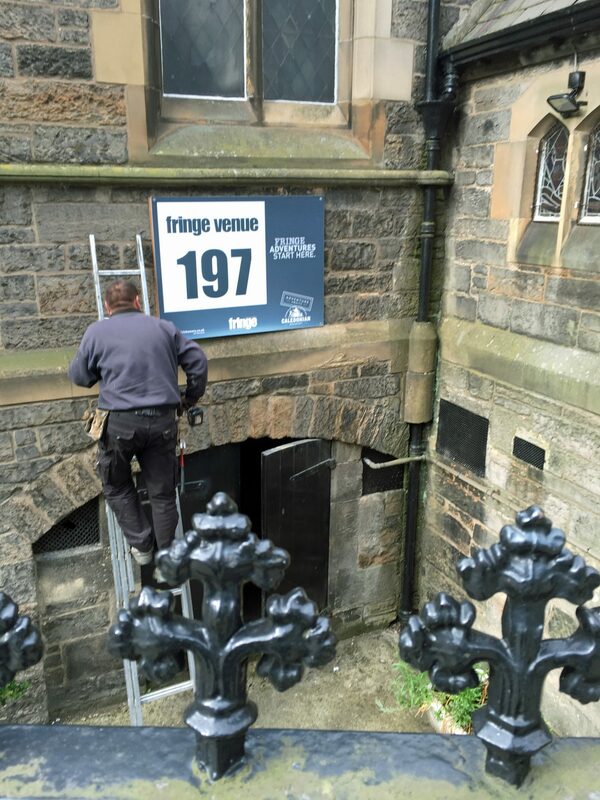 St Vincent’s as Fringe Venue 197, for the fourth year. 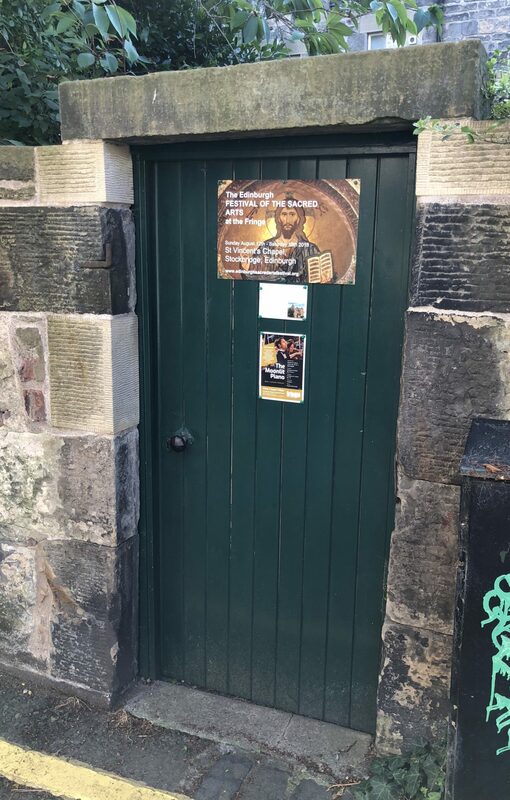 Posters advertising our Sacred Arts Festival and Marc Corbett-Weaver’s Piano Recital seen on a garden gate in Cumberland Street in the New Town of Edinburgh on 27th July 2018. The Reverend Dr Kent Walley has taken our Sunday and Thursday services during the first two weeks of July 2018. He is the Rector of St Luke’s Episcopal Church in Gladstone, New Jersey, USA. Since 2006 Professor Gordon Graham has taken these services, but knowing that he and his family were to be moving house at this time, asked his friend to take his place. This was the first time Dr Wally and his wife had been in Edinburgh. 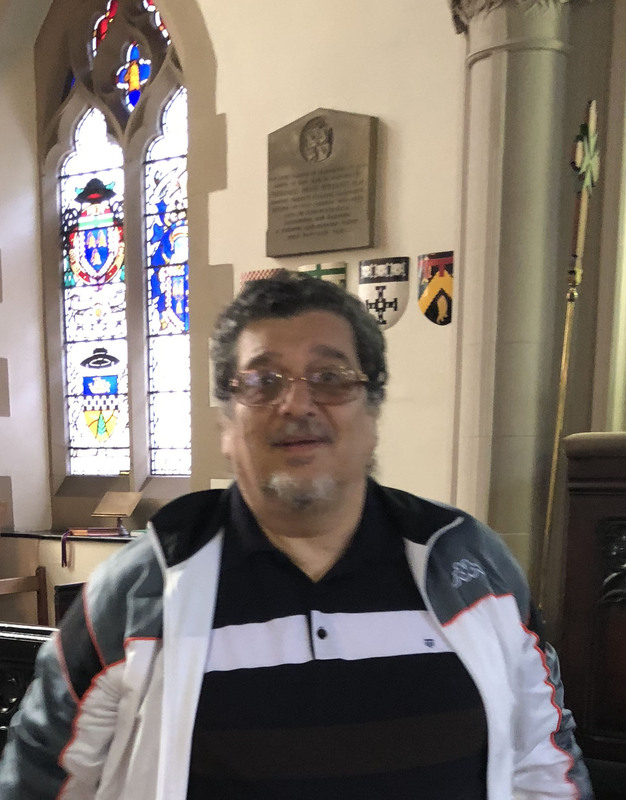 We hope to see them again soon..
We were pleased to welcome Professor Charles Savona Ventura and his wife on their first visit to St Vincent’s on 23rd June 2018. He is Grand Prior of Grand Priory of the Maltese Islands of the The Military and Hospitaller Order of Saint Lazarus of Jerusalem, and an expert on its history. 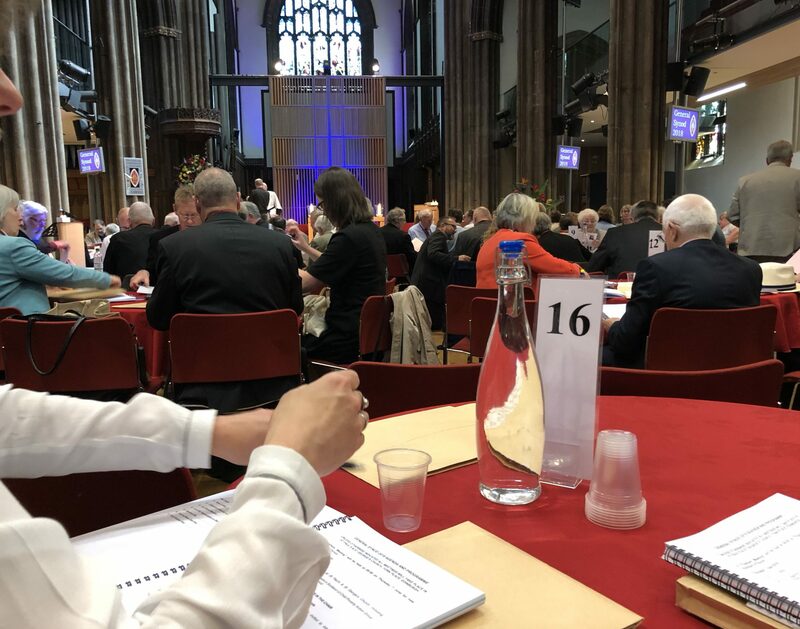 Barnaby Miln’s view from table 16 at the General Synod of the Scottish Episcopal Church, meeting in St Paul’s and St George’s Church in Edinburgh from 7th to 9th June 2018. 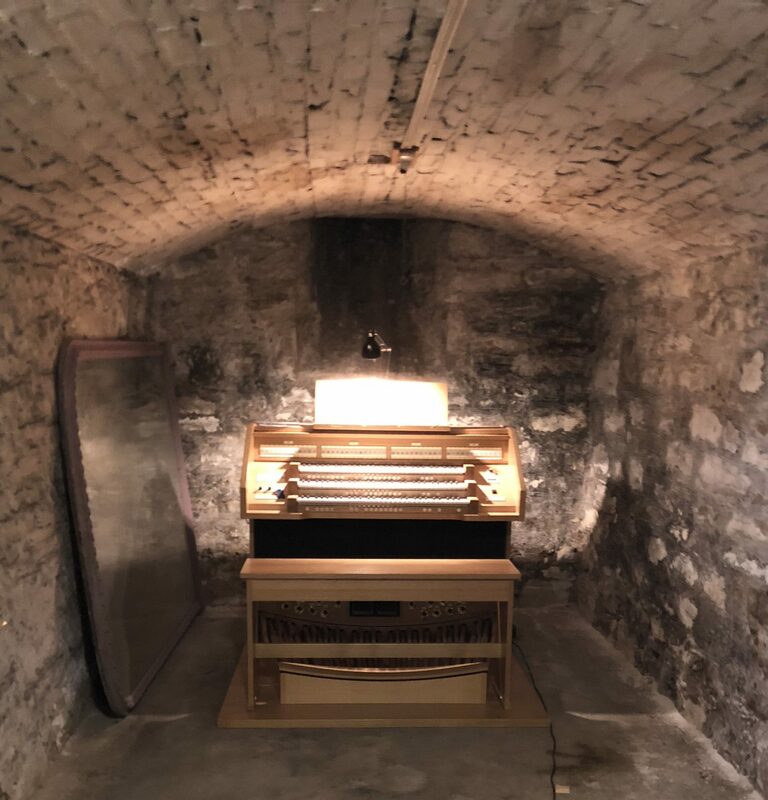 As part of his bequest to St Vincent’s, George Hay’s Westmorland 45 Sapphire Organ arrived in the undercroft on 3rd May 2018, awaiting a decision on its final position. 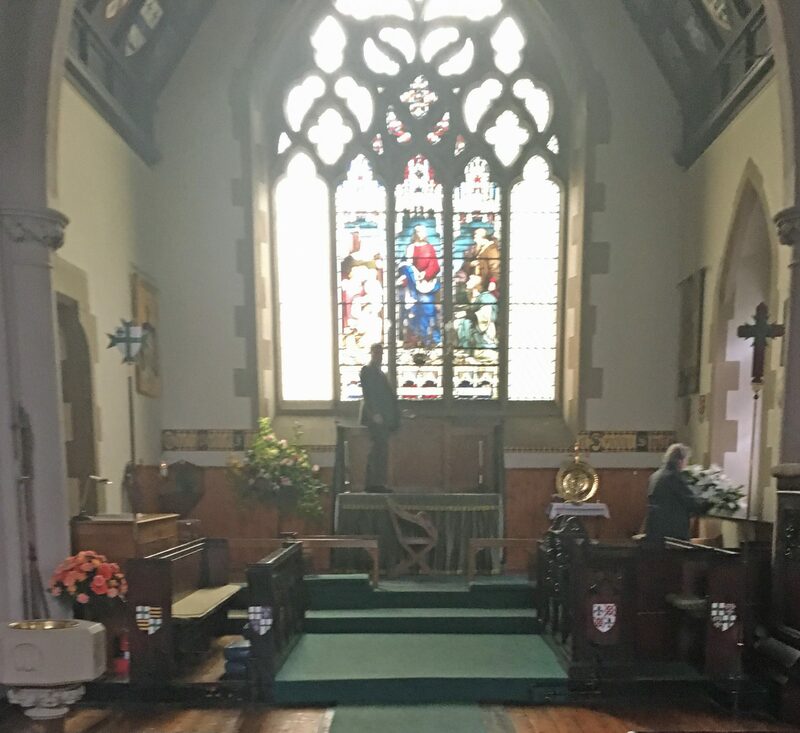 After removal from George Hay’s house in Colinton, the organ was given a service by its maker, Makin Church Organ Builders, under the direction of their Managing Director, Dr Keith Harrington, together with four colleagues. George Hay’s collection of organ and other music was bequeathed to the Royal College of Organists, of which he was a Fellow. The collection is to be housed at St Vincent’s. 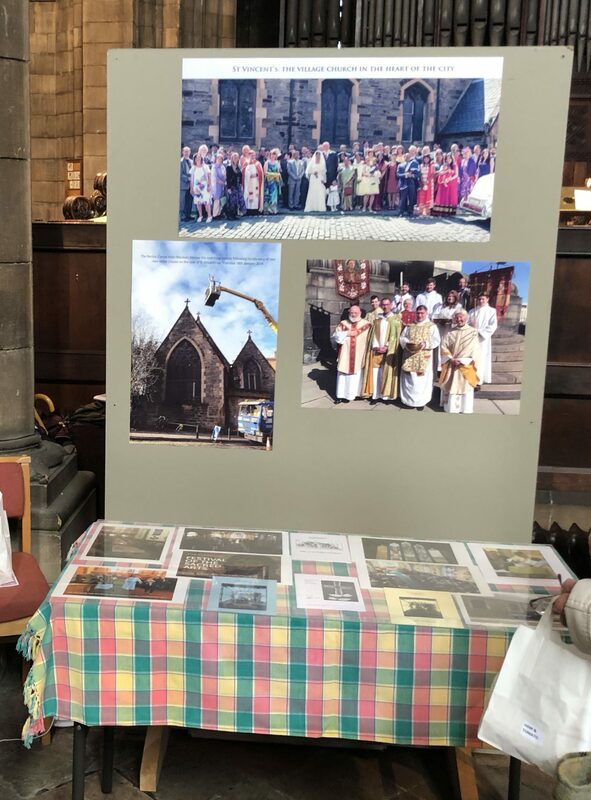 Vestry member Ruth Stark is talking about St Vincent’s by our display at The Big Day in St Mary’s Cathedral on Saturday 28th April 2018. 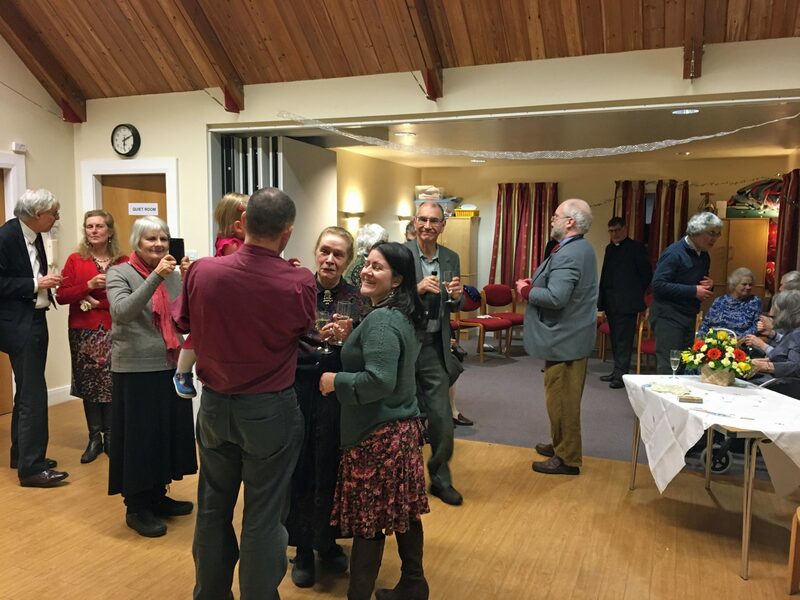 The event was part of the next step of the Diocese of Edinburgh’s Growing Together journey, with the participation of many of the churches in the Diocese. 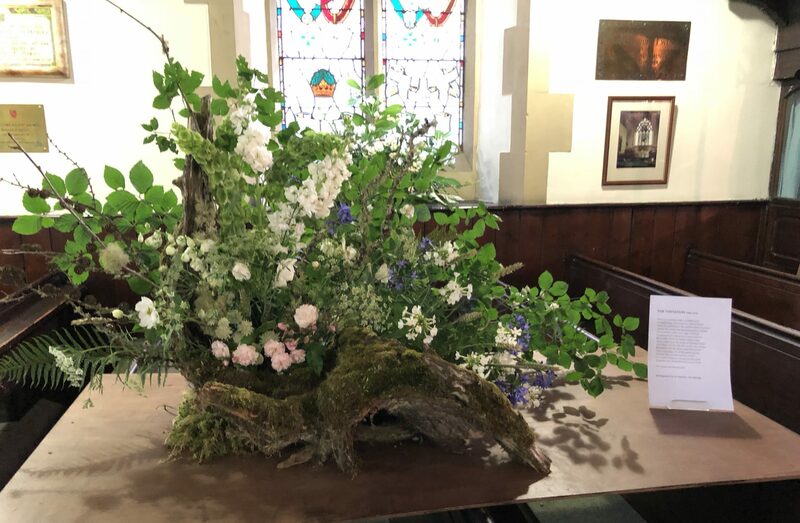 Part of our much admired display at The Big Day in St Mary’s Cathedral on Saturday 28th April 2018. 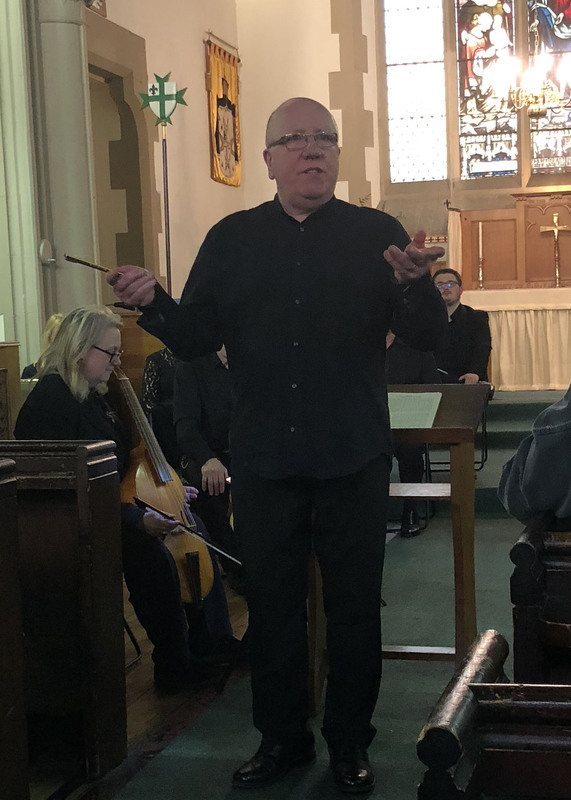 Les Shankland, Director of Music, introduces the audience to Heinrich Schütz’s Resurrection History performed at St Vincent’s on Sunday 8th April 2018 by Coro Vincenzo and The Squair Mile Consort of Viols. 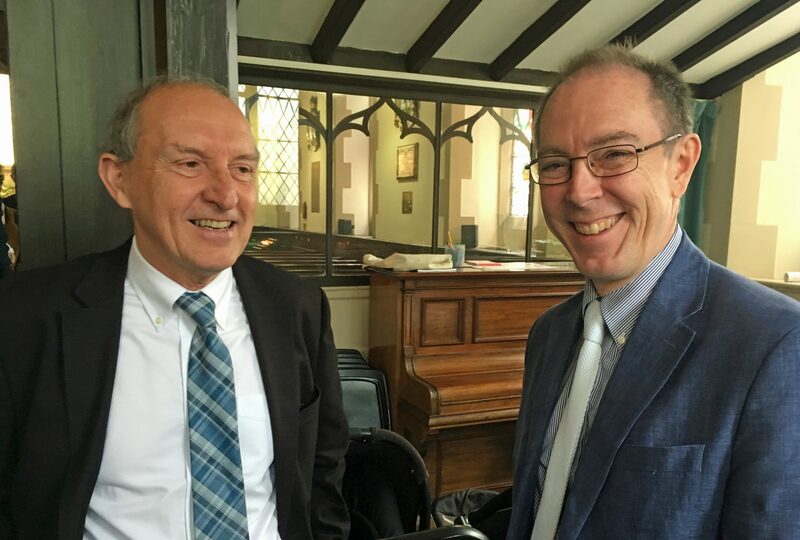 Les Shankland, Director of Music, conducted a devotional performance of Schütz’s Account of the Resurrection of Jesus Christ, composed in 1623, and rarely heard in the United Kingdom. 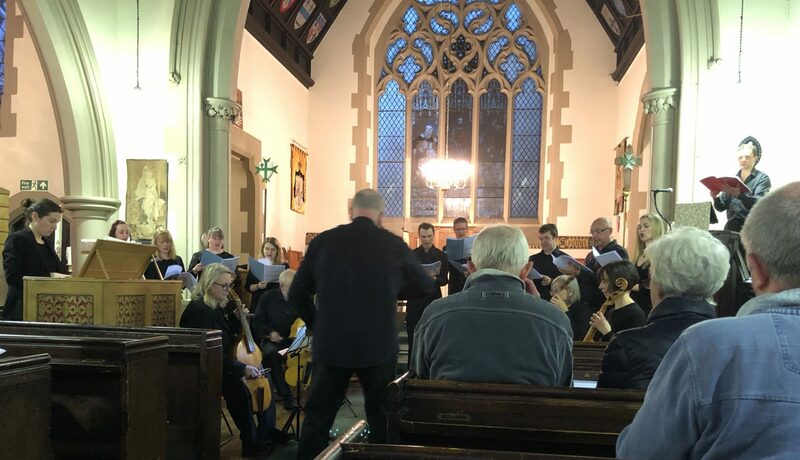 Coro Vincenzo was joined by The Squair Mile Consort of Viols on Sunday 8th April 2018 at St Vincent’s. 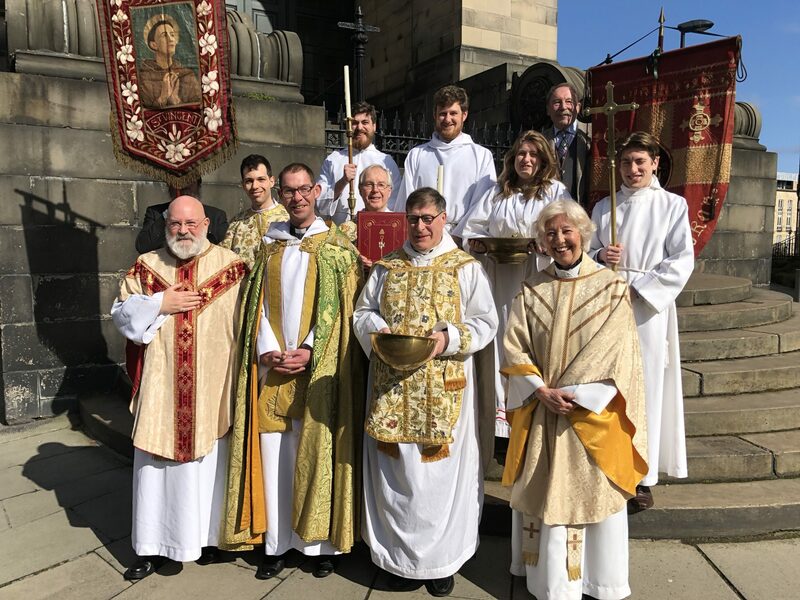 The altar party on Easter Day 2018 on the steps of St Stephen’s opposite St Vincent’s. 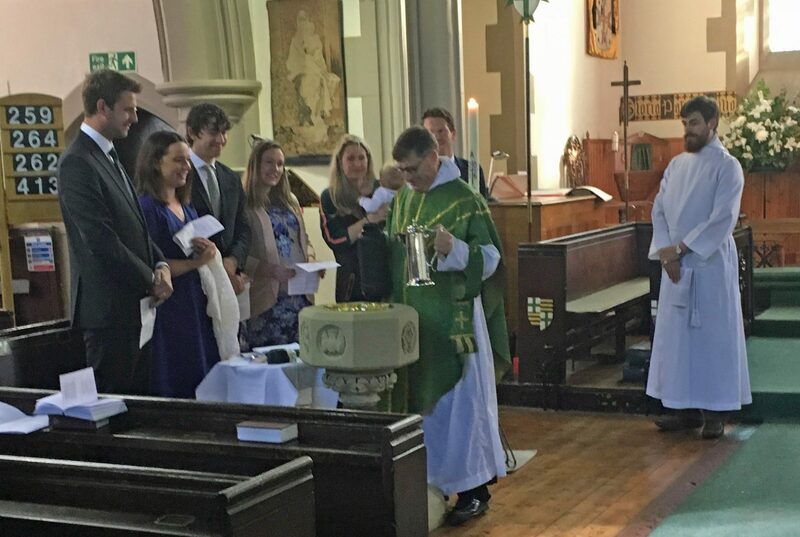 The altar party processes into St Vincent’s on Easter Day 2018. 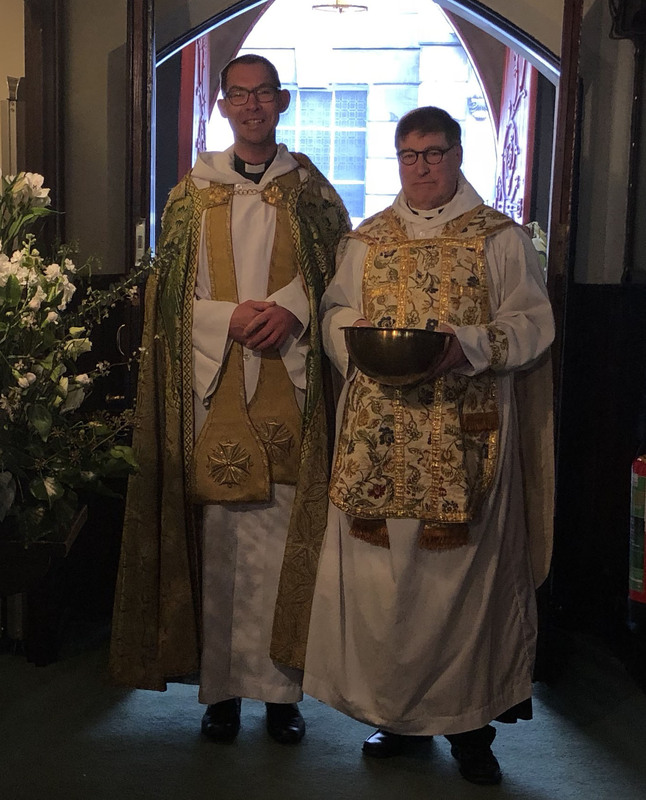 The preacher on Easter Day 2018 was Fr David Charles, Vicar of Christ Church Eastbourne, seen here with the Rector, Canon Allan Maclean. 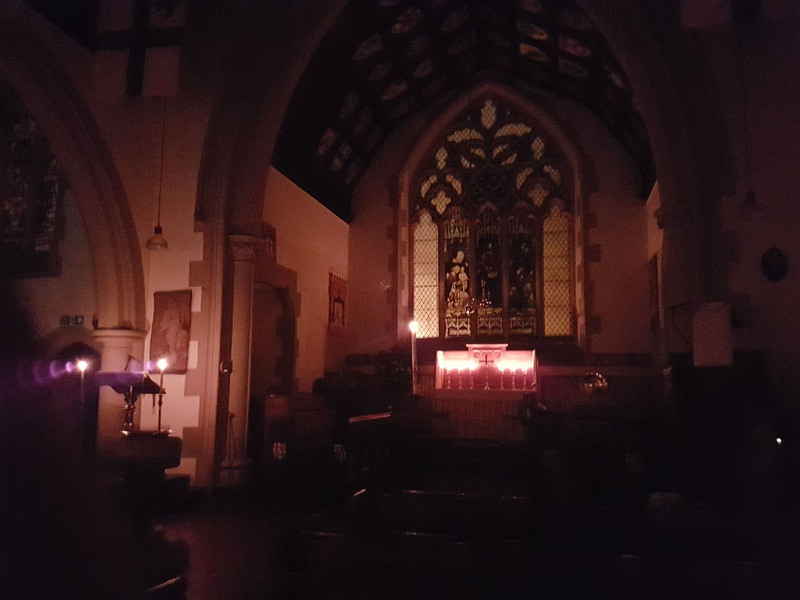 The darkness of St Vincent’s in the silence of the conclusion of the Easter Eve Lighting the Fire service on Saturday 31st March 2018. 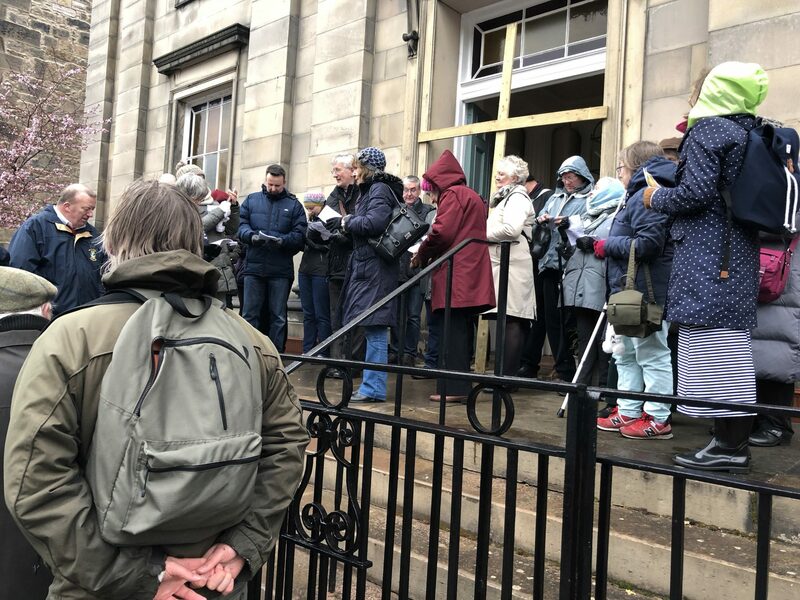 Members of five church communities in and around Stockbridge came together for a Good Friday Walk Witnessing with the Cross on 30th March 2018. 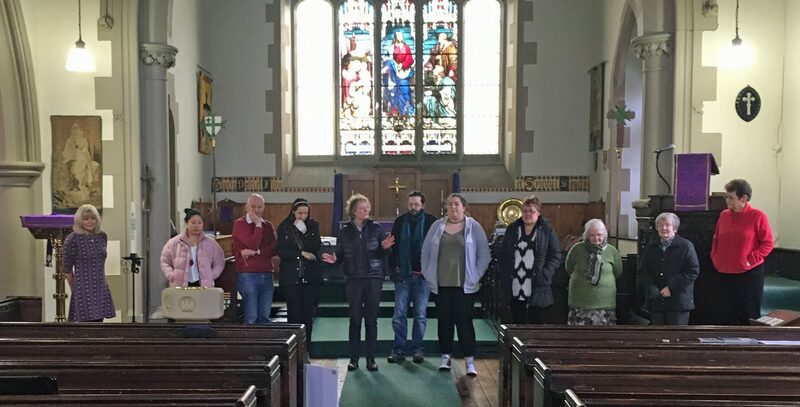 The first Bible reading and prayer was said at Bristo Baptist Church, then at St Ninian’s, St Stephen’s Comely Bank, Portgower Place, St Bernard’s Row, Old Stockbridge Market, St Vincent’s Chapel and finally at Stockbridge Parish Church – where this photograph was taken. 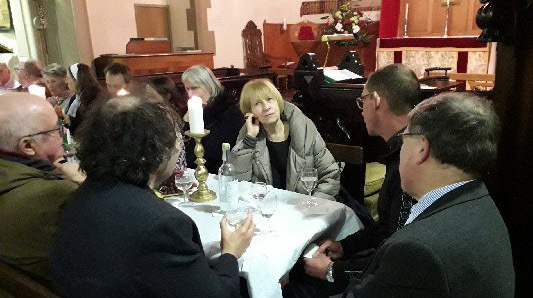 Members of five church communities in and around Stockbridge came together for a Good Friday Walk Witnessing with the Cross on 30th March 2018. 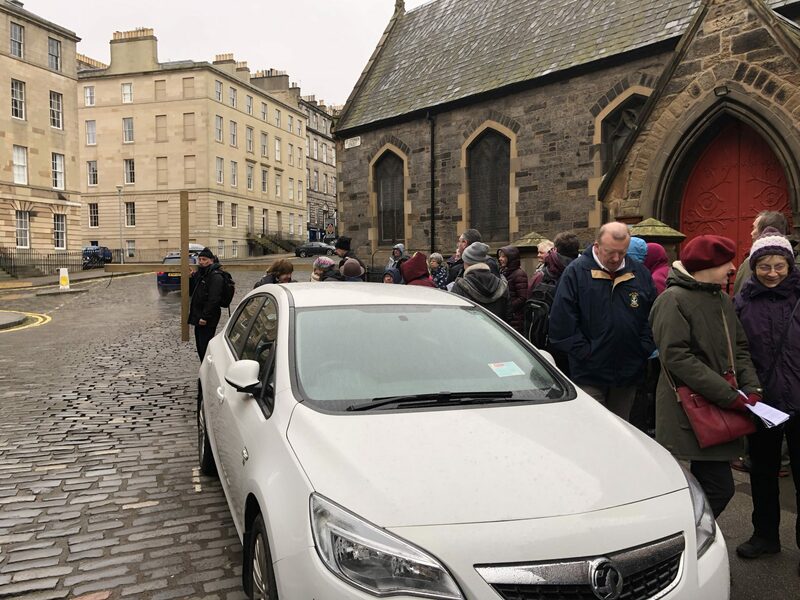 After a Bible reading and prayer outside St Vincent’s the wooden cross in seen leading the way to the final destination and a lunch for thirty five of us at Stockbridge Parish Church. 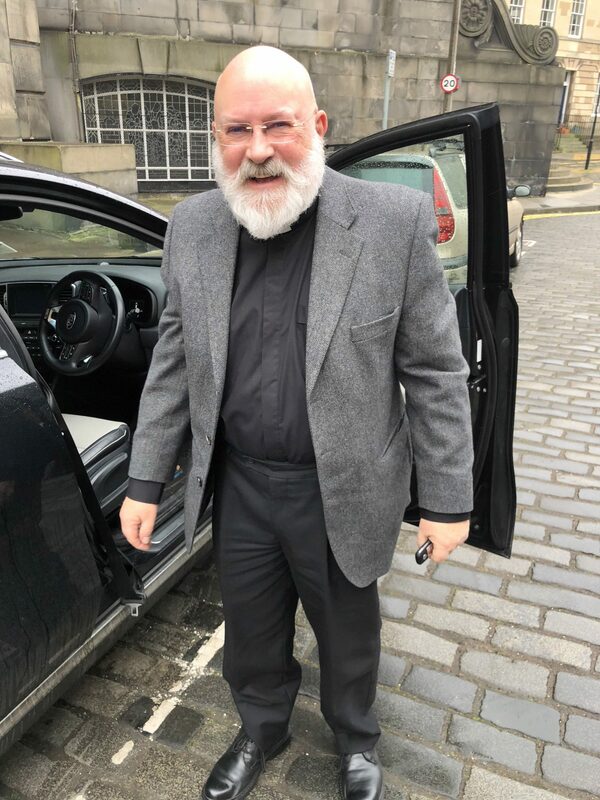 Father William Mounsey arrives at St Vincent’s on Good Friday, 30th March 2018. 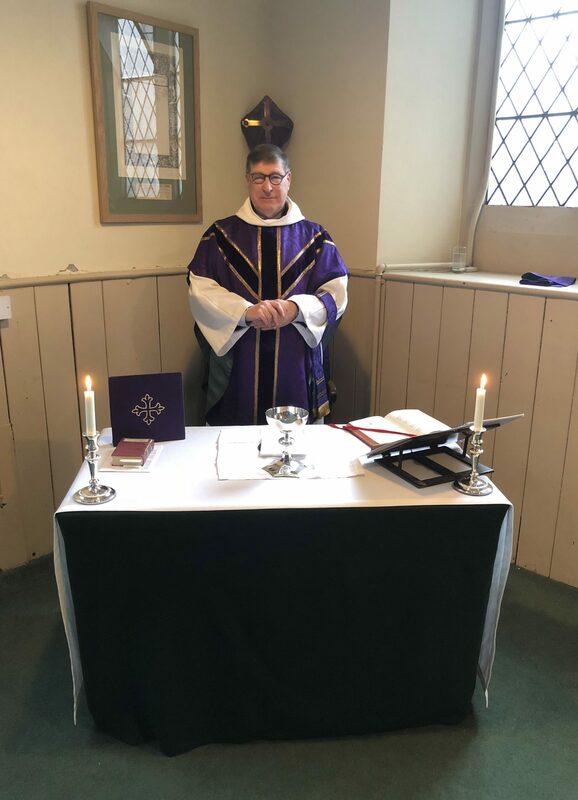 The Rector, Canon Allan Maclean, at the altar in the Refectory following the Thursday morning Eucharist on 22nd March 2018. 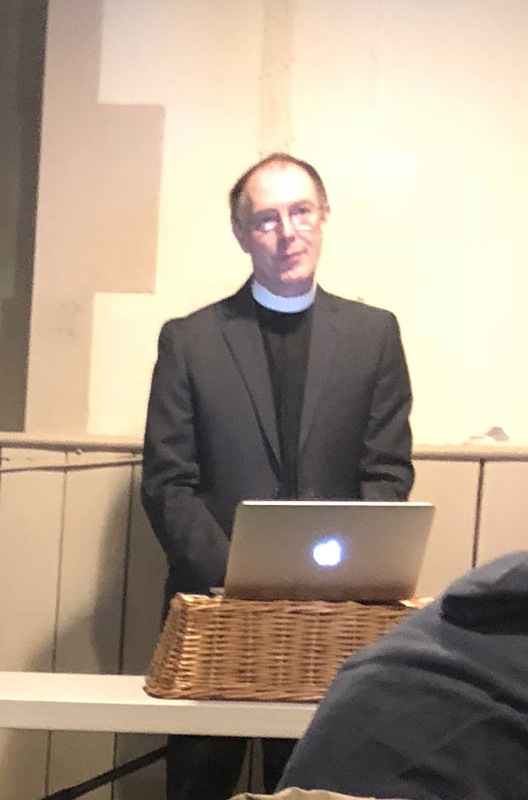 The Reverend Dr Michael Hull delivering one of his Lent Lectures on the topic of Grace, held in the Refectory on the four Thursdays in March 2018. Stockbridge and Inverleith Community Council held their monthly meeting in the Refectory on Wednesday 21st March 2018. 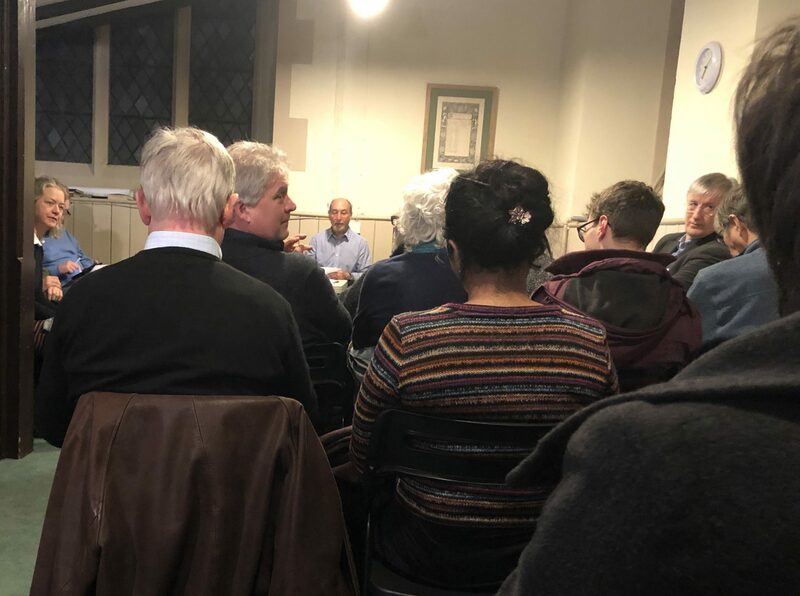 Some thirty City councillors, Community councillors and members of the public attended the meeting which lasted an hour and a half. 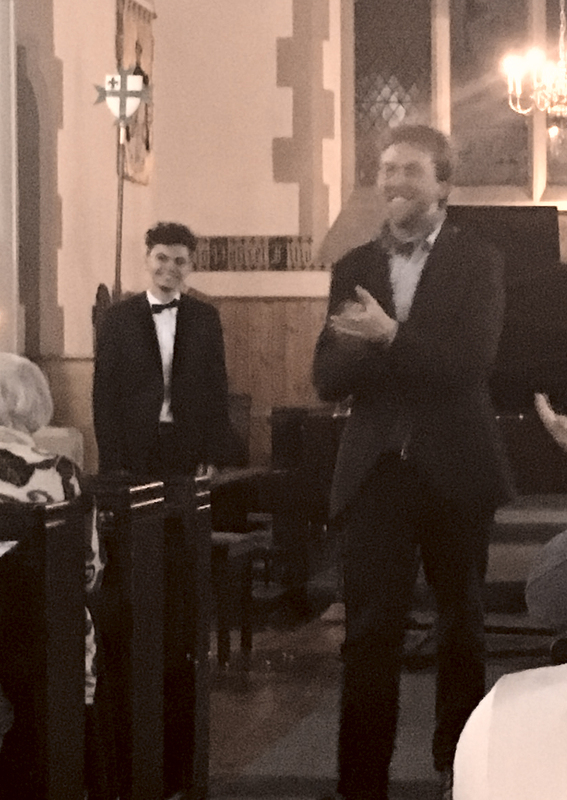 Our Composer in Residence, Dr Harry Whalley, takes the applause following the first performance of his Leighton Contrasts by brilliant young pianist Svetoslav Todorov at St Vincent’s on Wednesday 21st February 2018. 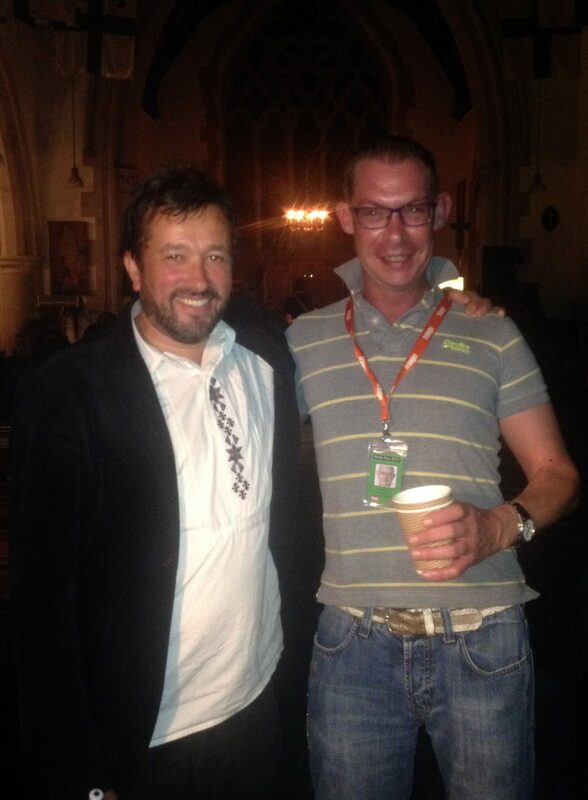 This was our third highly praised Composer in Residence concert. 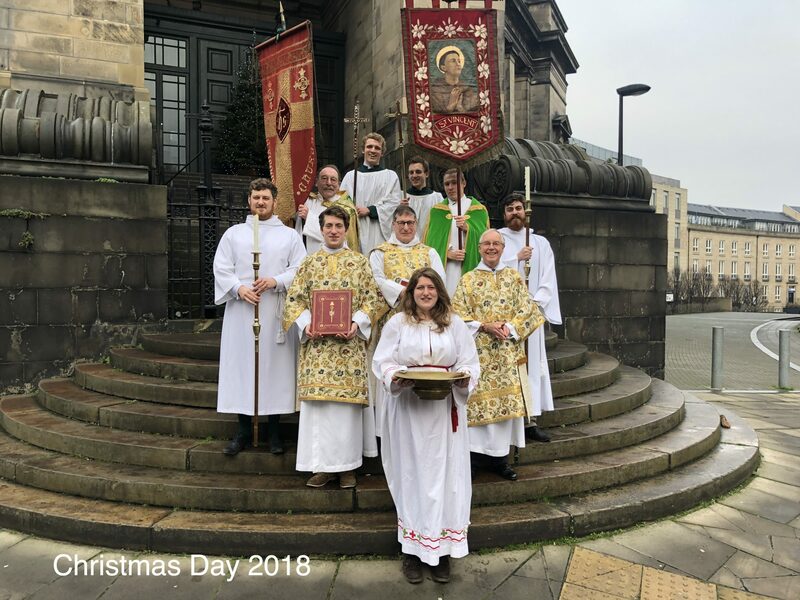 The altar party at Evensong on St Vincent’s Day, Monday 22nd January 2018. The preacher was the Right Reverend Brian Smith, sometime Bishop of Edinburgh. 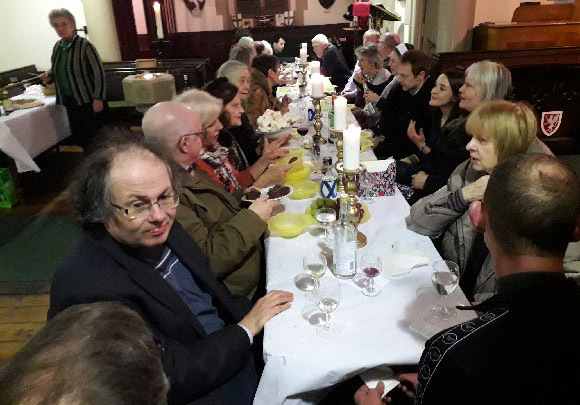 The St Vincent’s Day Feast, following Evensong on Monday 22nd January 2018, held in the Chapter House /North Aisle of St Vincent’s. 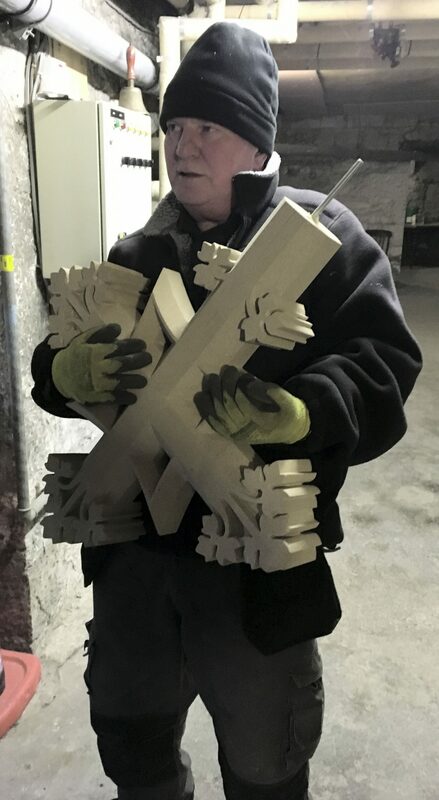 Raymond Ewing of R & S Maintenance lifts one of the crosses ready for placing on the roof on Thursday 18th January 2018. The Rector, Canon Allan Maclean, blesses one of the new stone crosses on 18th January 2018. 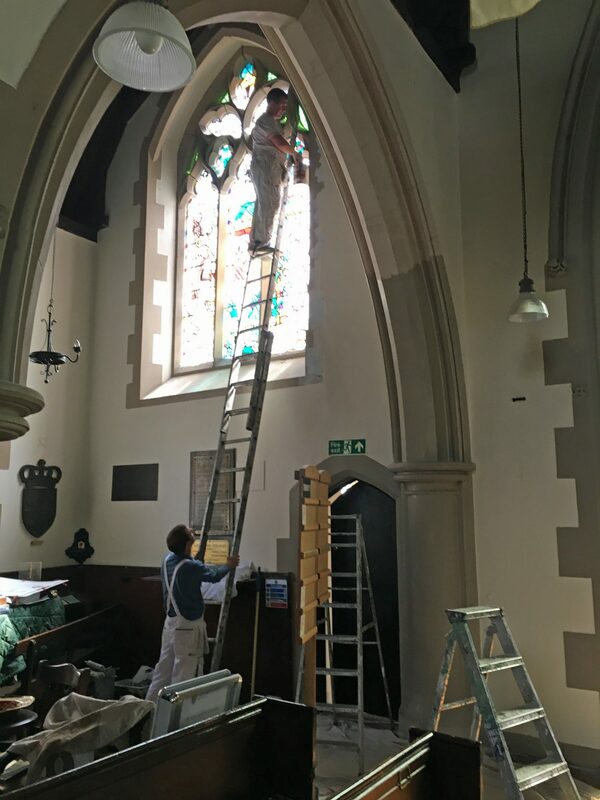 The previous cross shattered when it fell on to the vestry roof on Christmas Day 2016. 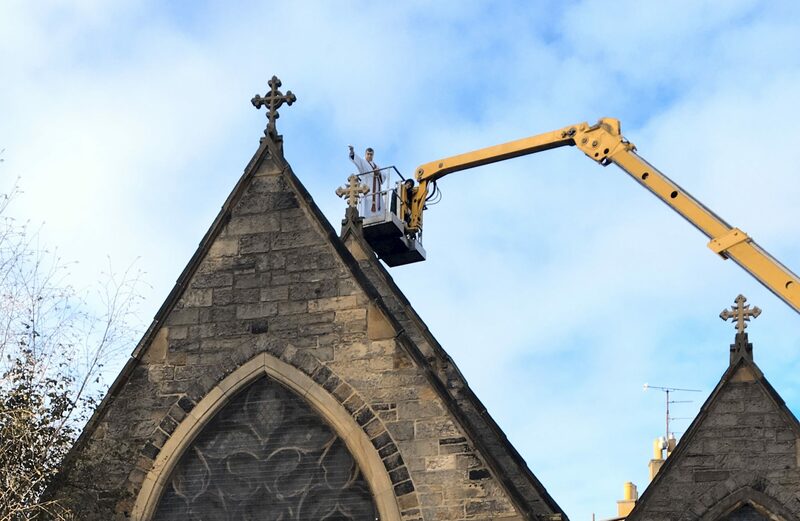 The Rector, Canon Allan Maclean, blesses one of the new stone crosses from a cherry picker on Thursday 18th January 2018. 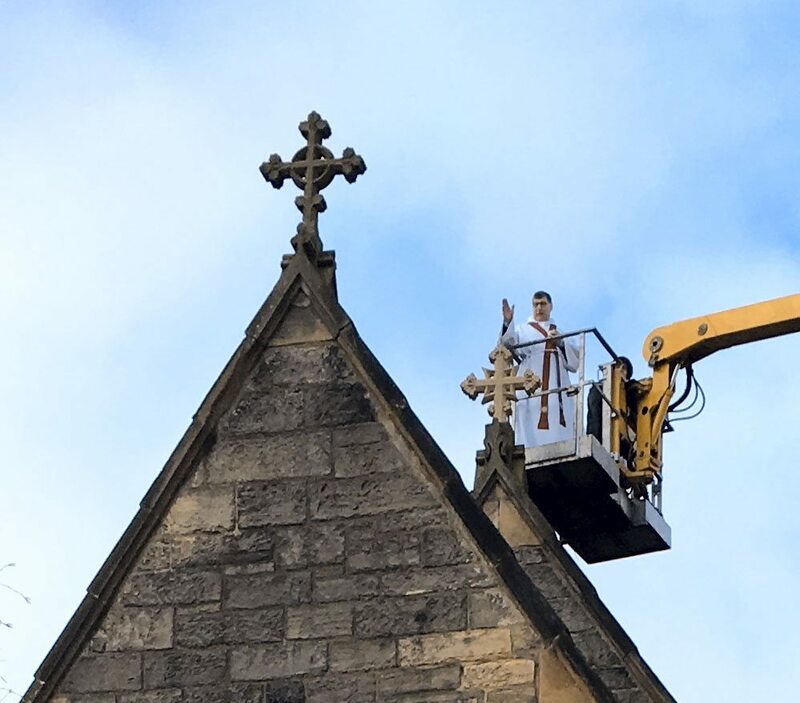 The Rector, Canon Allan Maclean, blesses one of the new stone crosses from a cherry picker on Thursday 18th January 2018. Both new crosses are seen in this photograph; both blessed with holy water. The Rector, Canon Allan Maclean, blesses the crowds on St Vincent Street who have been watching the erection of the new stone crosses on Thursday 18th January 2018. 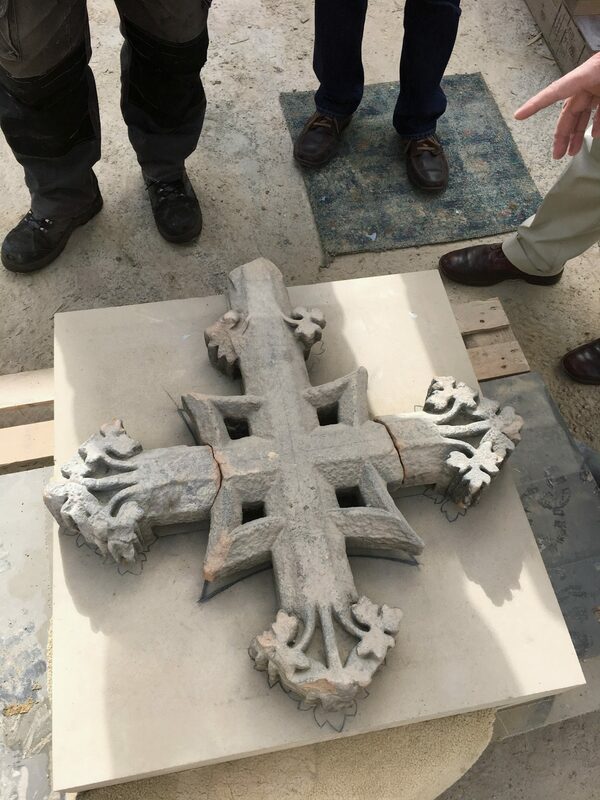 Two newly carved stone crosses were delivered to our undercroft from Forth Stone Limited. They have now been erected by R & S Maintenance to replace two damaged by storm and age. 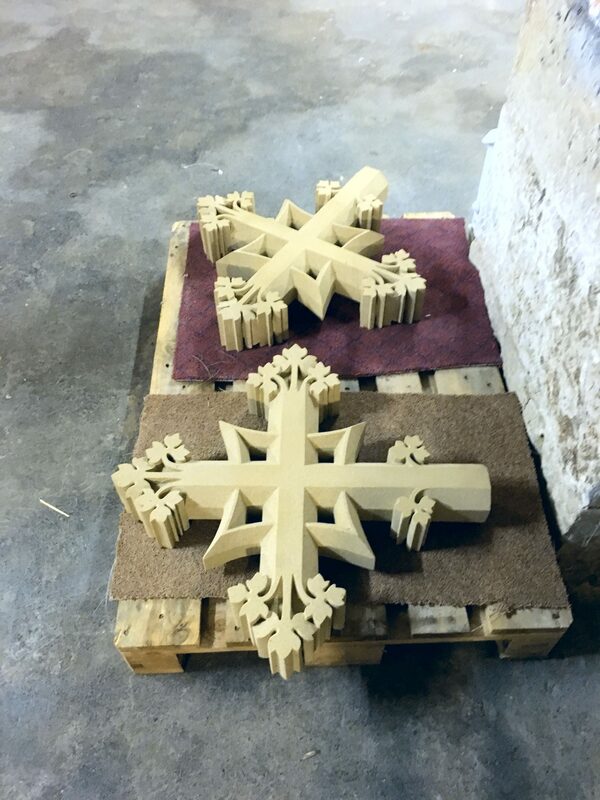 The stone for these new crosses comes from Witton Fell Quarry near Jervaulx Abbey in North Yorkshire. The Quarry historically provided stone for Jervaulx Abbey which was built in 1156, and where Wensleydale cheese originated. It is a medium grained buff coloured carboniferous sandstone. 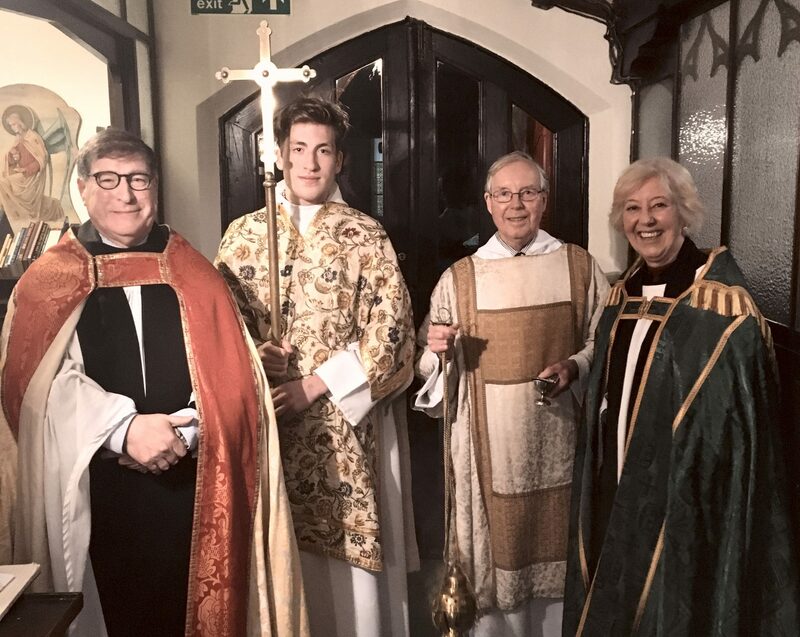 The Rector, Canon Allan Maclean, with Lochie Maclean, Christopher Hartley and the Reverend Linda Harknett following the Carol Service at St Vincent’s on Sunday evening 17th December 2017. 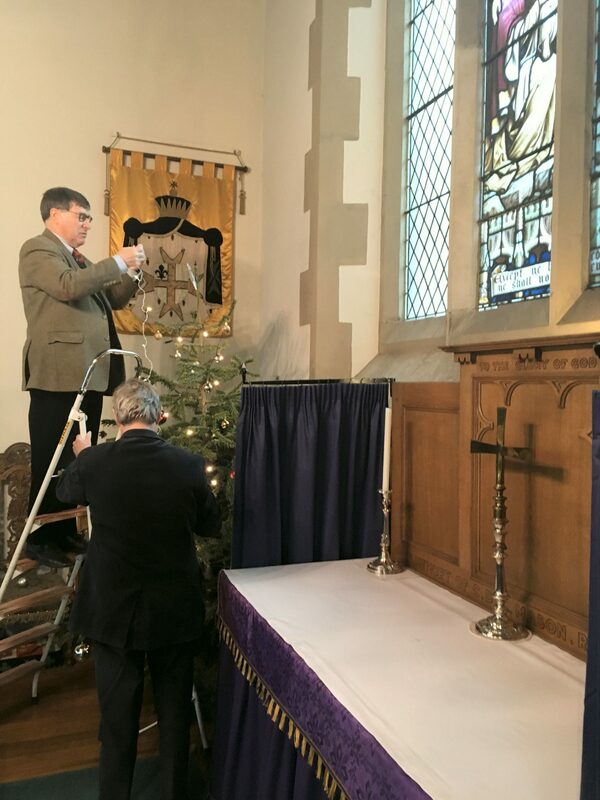 The Rector, Canon Allan Maclean, with the Sacristan, Christopher Hartley, putting the finishing touches to the Christmas tree at St Vincent’s on Sunday 17th December 2017. 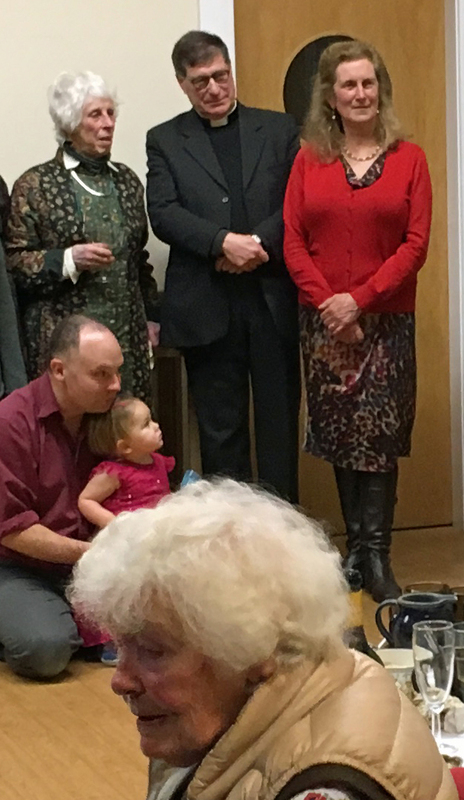 The Sacristan, Christopher Hartley, is seen to be selling off used candles to the Convener of the Music Committee, Ruth Stark, at St Vincent’s on Sunday 17th December 2017. 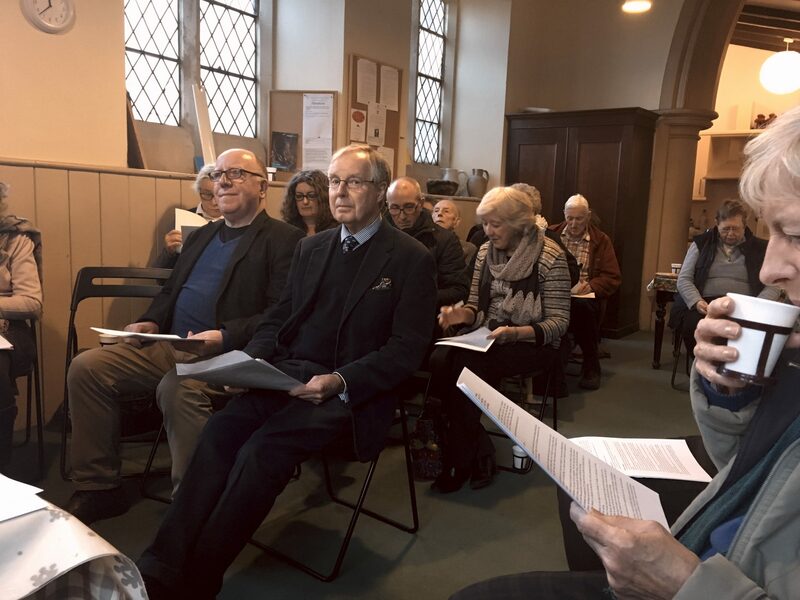 A picture of some of those who were at the Annual General Meeting of the congregation of St Vincent’s on Sunday 26th November 2017. 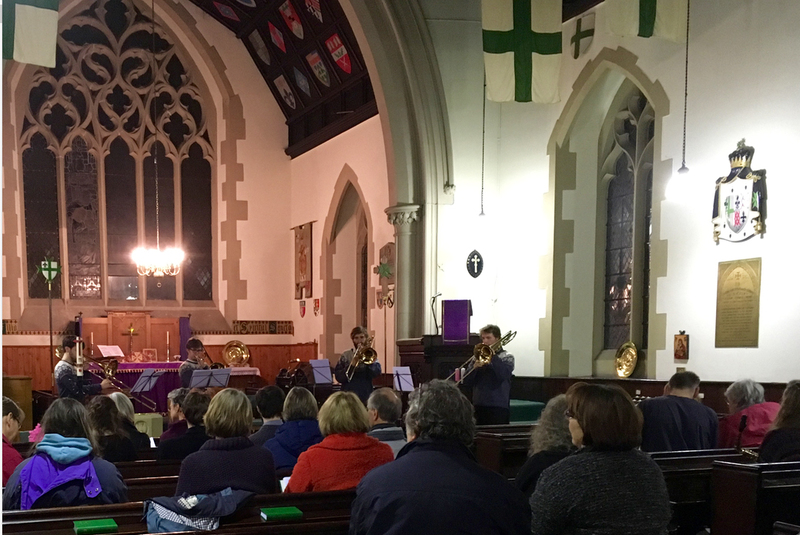 At the Annual General Meeting of the congregation of St Vincent’s on Sunday 26th November 2017. 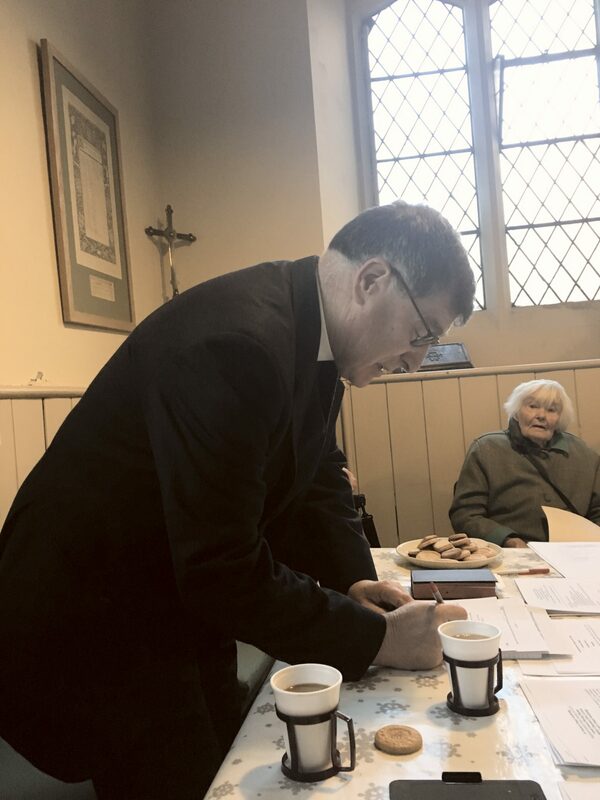 The Rector, Canon Allan Maclean, makes a note regarding elections to the Vestry for the coming year. 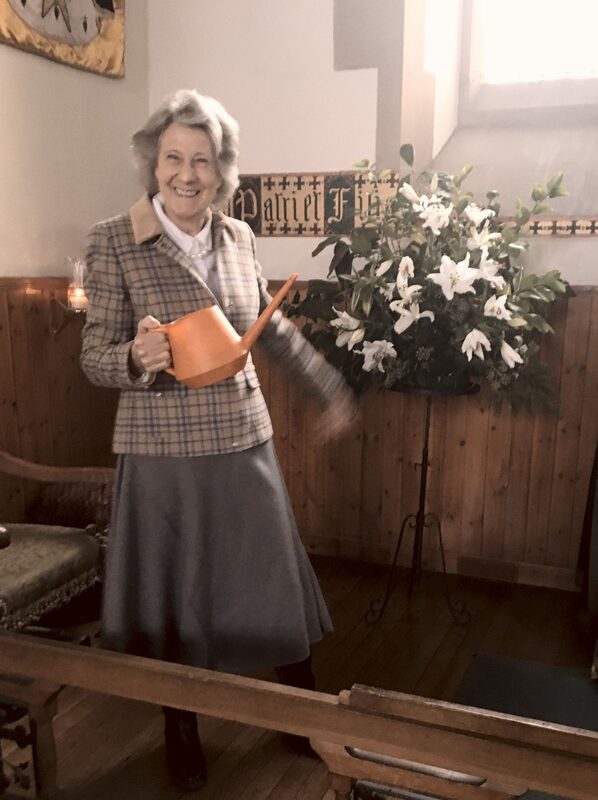 Mrs Anne Clutterbuck, the congregation’s oldest member, is watching. 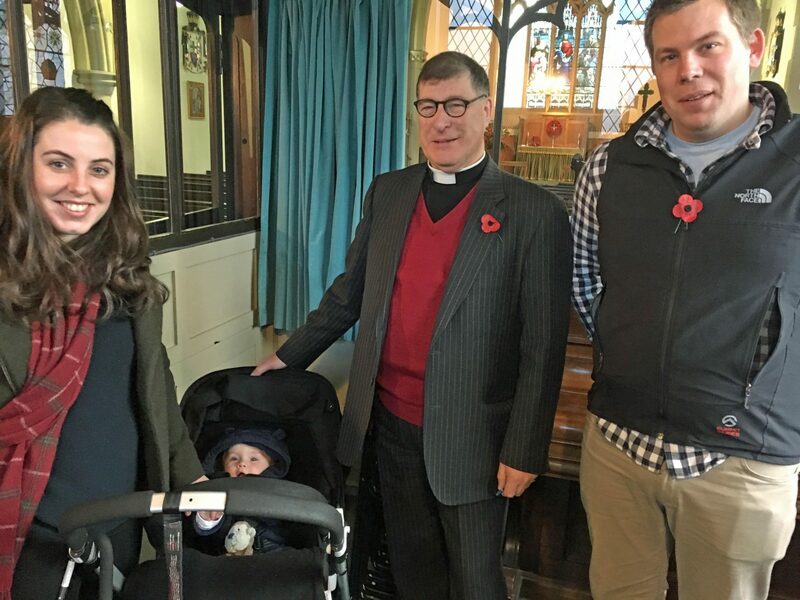 The Rector, Canon Allan Maclean, with Michael and Katie and daughter Sophia after the Sunday morning service on Remembrance Sunday 12th November 2017. 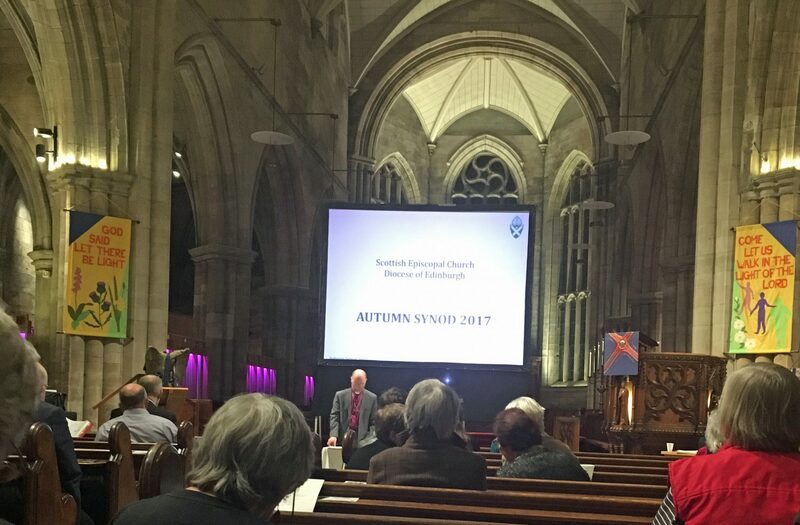 The Bishop of Edinburgh speaking at the Diocesan Synod on 26th October 2017 at St Michael’s Church Linlithgow. 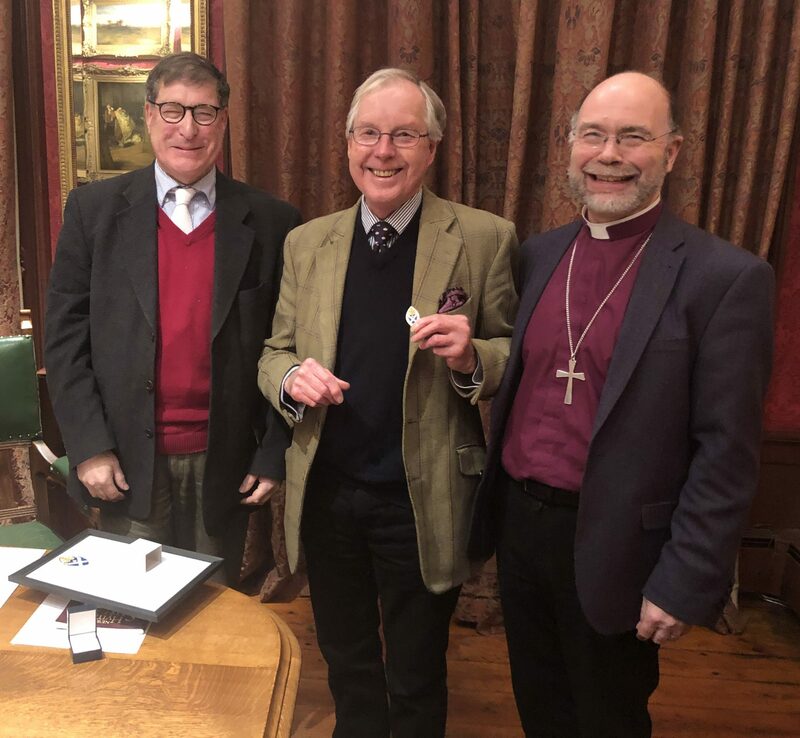 The Rector, our Lay Representative (Andy Milner), and our General Synod member, (the Hon Barnaby Miln) were present. 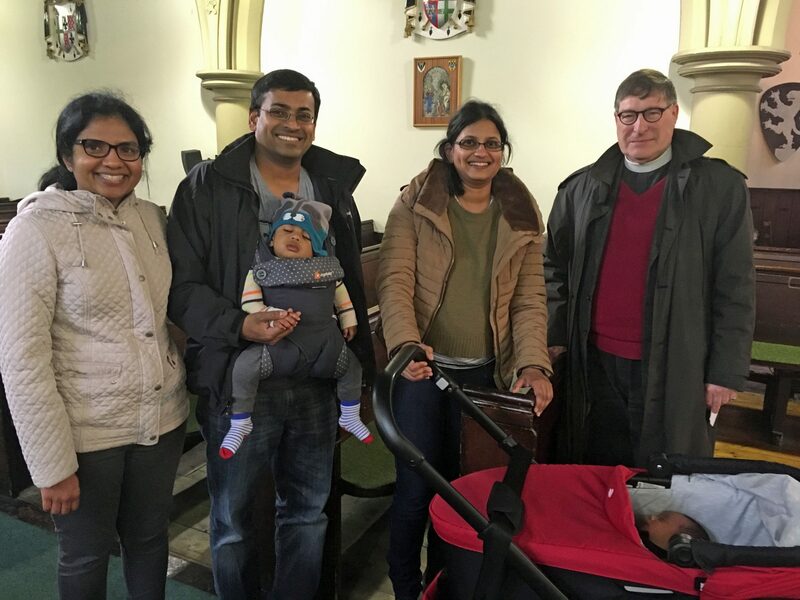 The Rector with Vestry member, Suja Kurien Hartley, husband Jonathan and son Julian who was born on 5th April 2017. The Rector of St Vincent’s, Canon Allan Maclean, upon the altar on 12th October 2017. 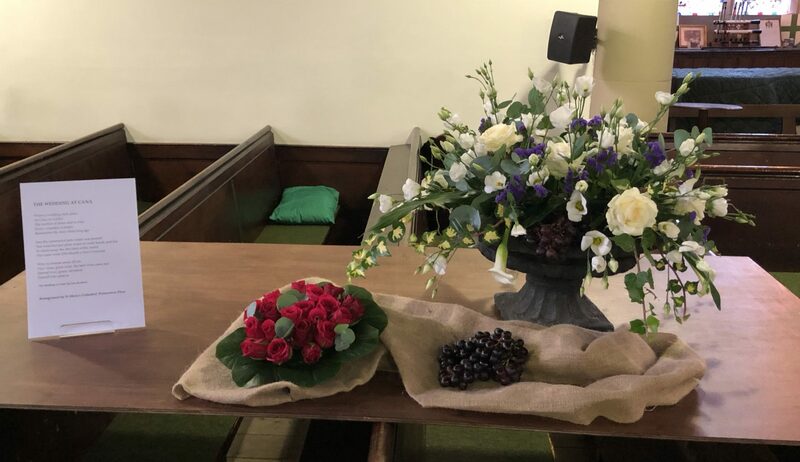 He was arranging flowers in advance of the Harvest Thanksgiving Service. The table awaits the Harvest Lunch on Sunday 8th October 2017. 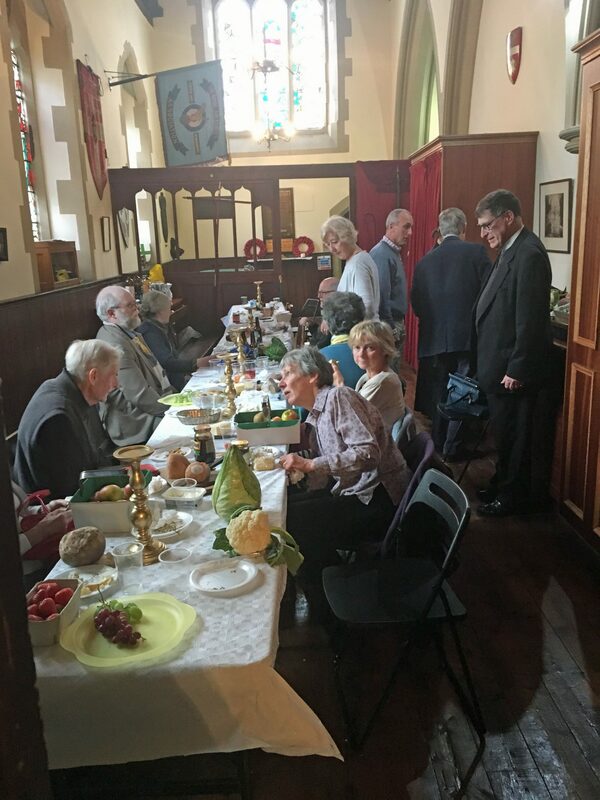 Towards the end of the Harvest Lunch on Sunday 8th October 2017. Evensong organist, William Watt, at the Harvest Lunch on Sunday 8th October 2017. William is preparing for ordination in the Church of Scotland. 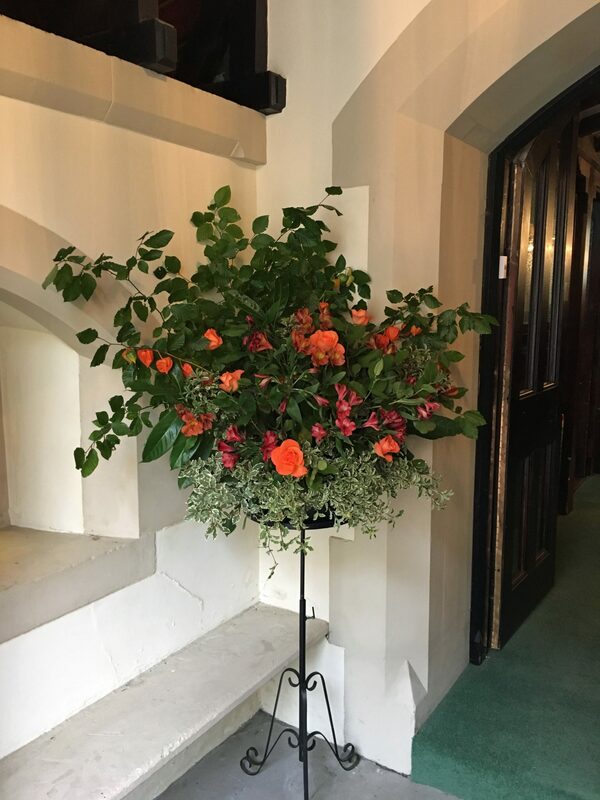 Harvest flowers on Sunday 8th October 2017. 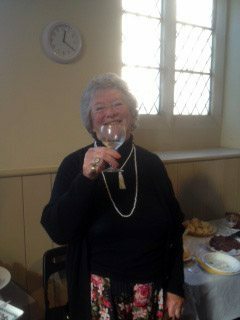 The Reverend Linda Harknett at the Harvest Lunch on Sunday 8th October 2017. 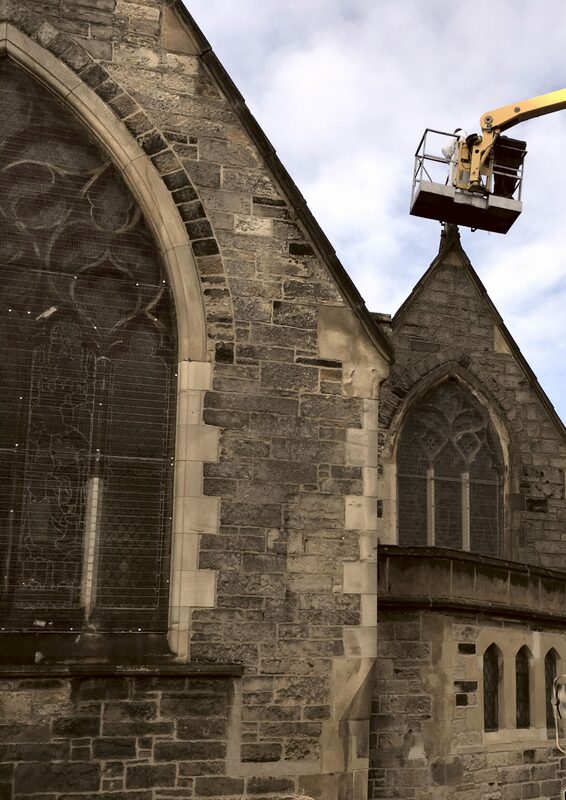 Only one stone cross remains on the roof of St Vincent’s. The first two replacements are ready to be carved at Forth Stone Limited in Bonnyrigg following a visit on 6th September 2017 by the Rector, Sacristan and Property Convenor. 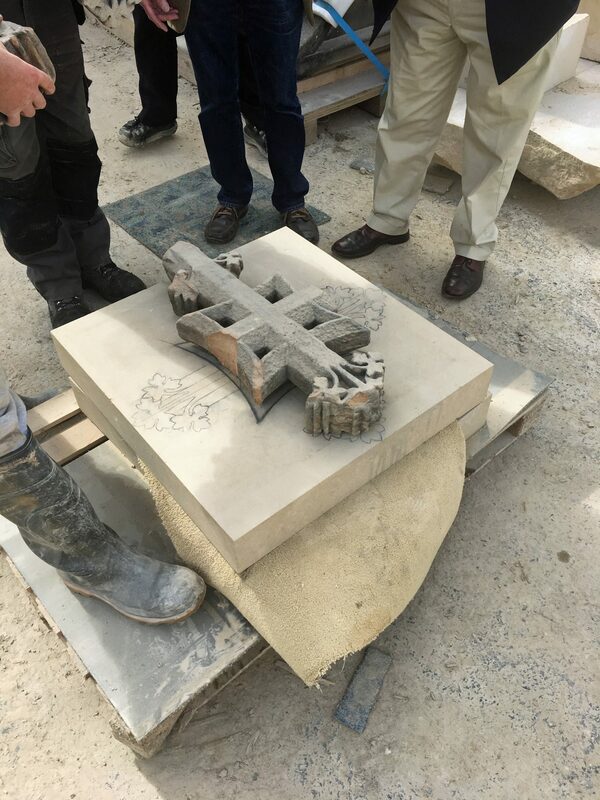 The stone for our new crosses comes from Witton Fell Quarry near Jervaulx Abbey in North Yorkshire. The Quarry historically provided stone for Jervaulx Abbey which was built in 1156, and where Wensleydale cheese originated. It is a medium grained buff coloured carboniferous sandstone. 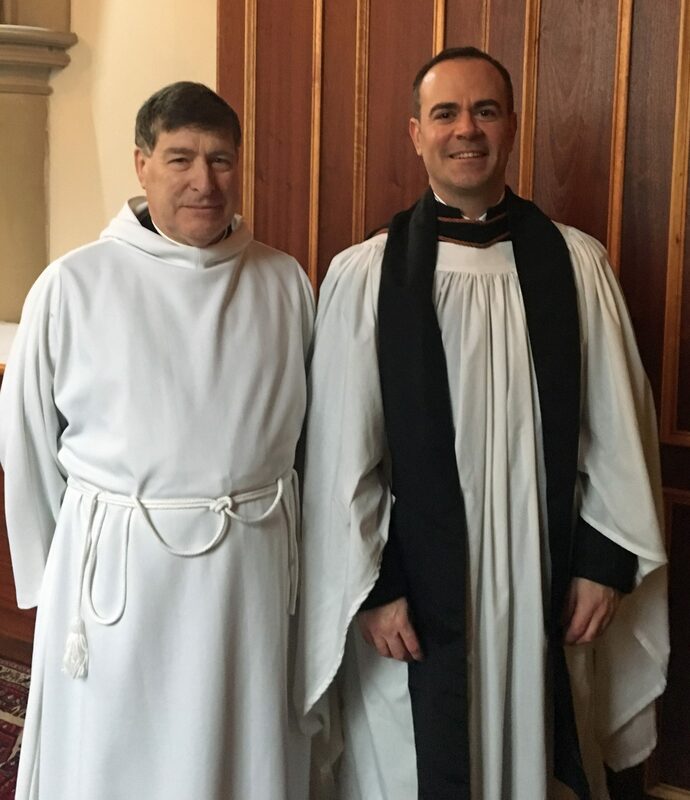 Scottish Episcopal priests and professors, both Dr Gordon Graham (on the left) and Dr Mike Hull are Assistant Priests at St Vincent’s. 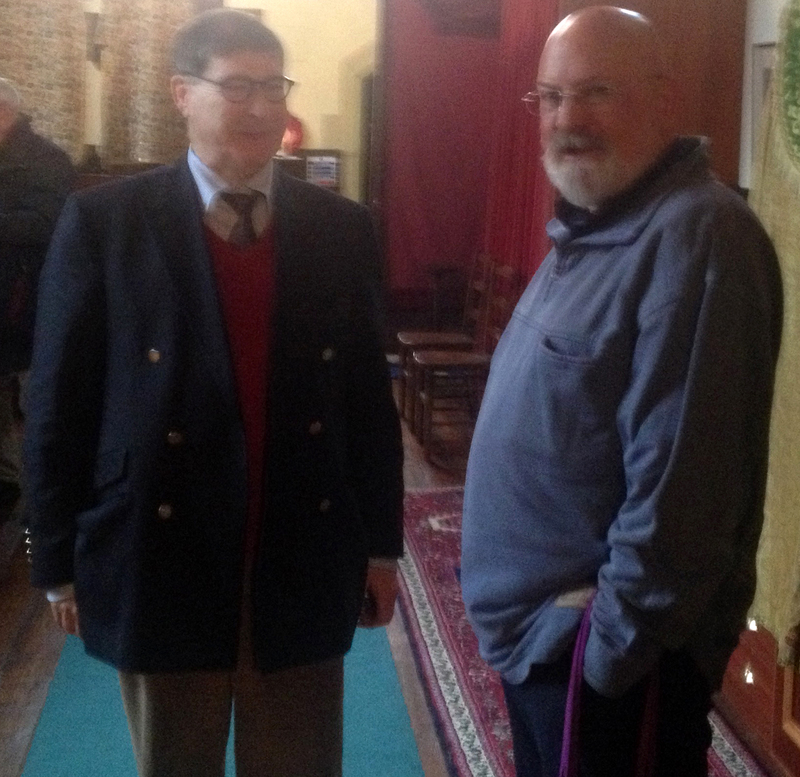 Gordon Graham is Henry Luce III Professor of Philosophy and the Arts at Princeton Theological Seminary, and Mike Hull was, until 2014, Professor of Sacred Scripture at St. Joseph’s Seminary (Dunwoodie) in Yonkers, New York and now Director of Studies of the Scottish Episcopal Institute. The photograph was taken at St Vincent’s on Sunday 2nd July 2017. 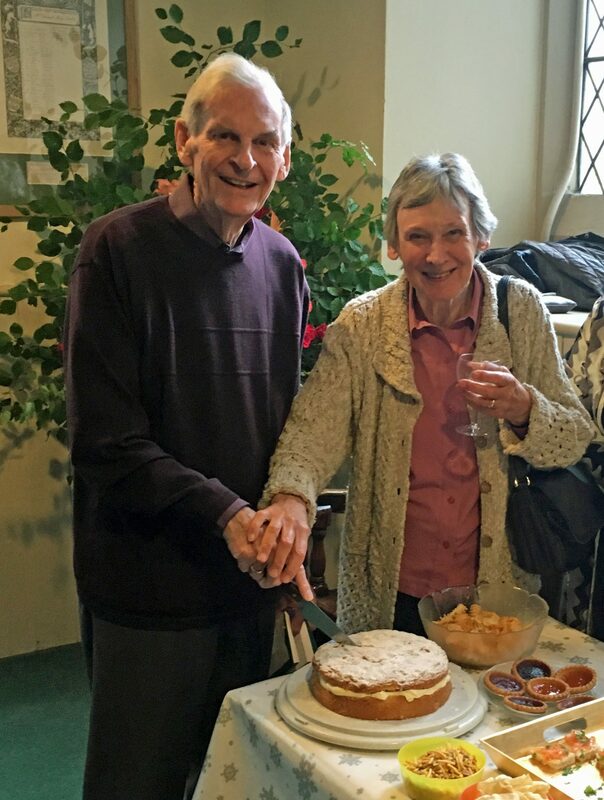 Michael and Christina Paulson-Ellis cut the cake on Sunday 11th June 2017 to mark Michael’s retirement after sixteen years as St Vincent’s Vestry Treasurer. 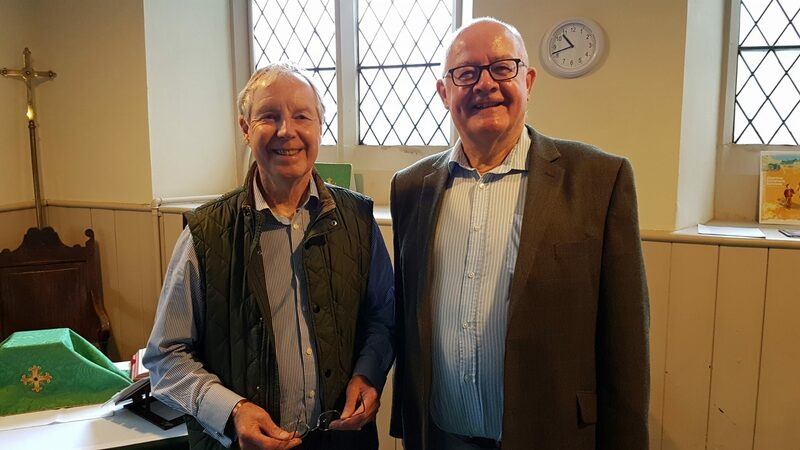 Michael Paulson-Ellis OBE with Canon Allan Maclean at a Reception on Sunday 11th June 2017 to mark Michael’s retirement as Vestry Treasurer of St Vincent’s. 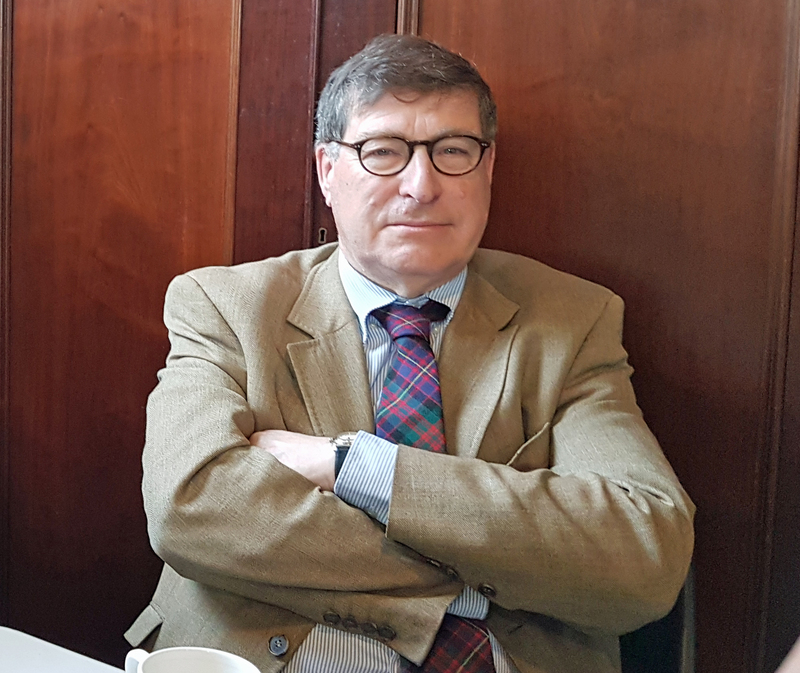 Michael Paulson-Ellis OBE responds when thanked on Sunday 11th June 2017 for his sixteen years as St Vincent’s Vestry Treasurer. 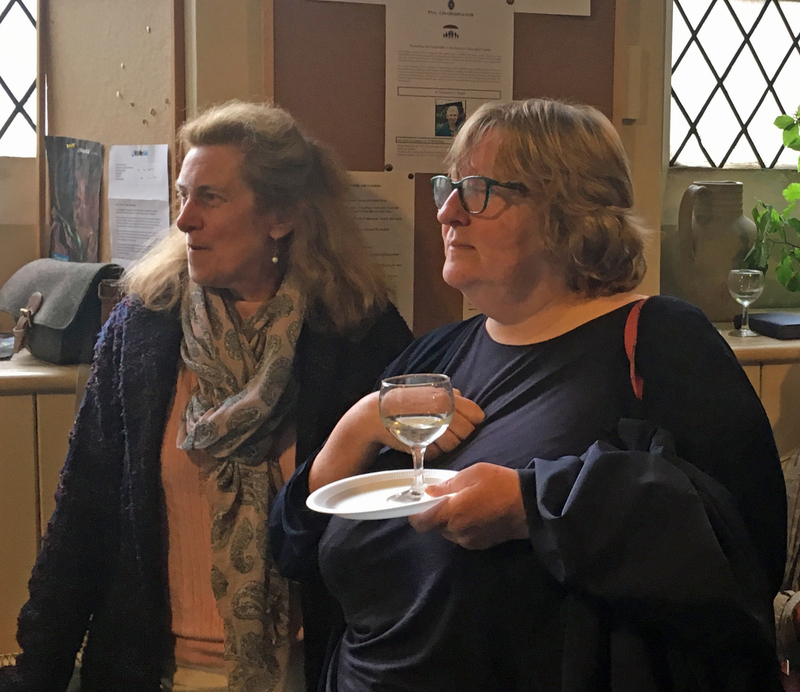 Anne Maclean and Bridget Campbell watch proceedings during Michael Paulson-Ellis’ retirement reception at St Vincent’s on Sunday 11th June 2017. Canon Allan Maclean has been Rector of St Vincent’s since January 2015. 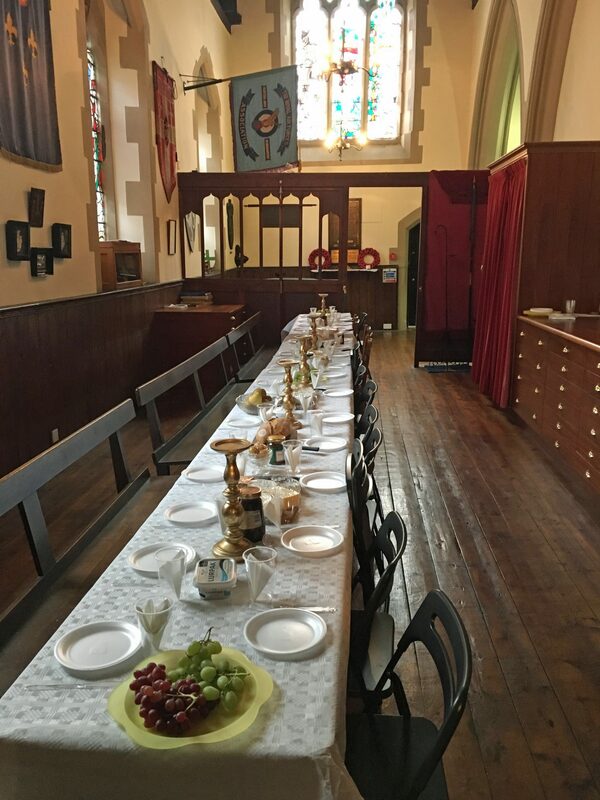 This photograph was taken by George Hay, former organist, on 18th May 2017 in the Refectory of St Vincent’s following the Thursday morning Eucharist. 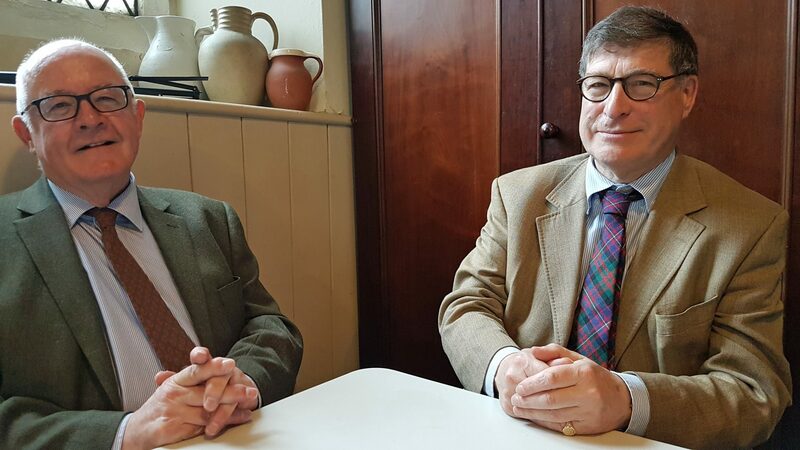 The Hon Barnaby Miln (left) and Canon Allan Maclean are members of the General Synod of the Scottish Episcopal Church which met on 8th to 10th June 2017. Canon Maclean was one of the clergy representatives of the Diocese of Edinburgh. 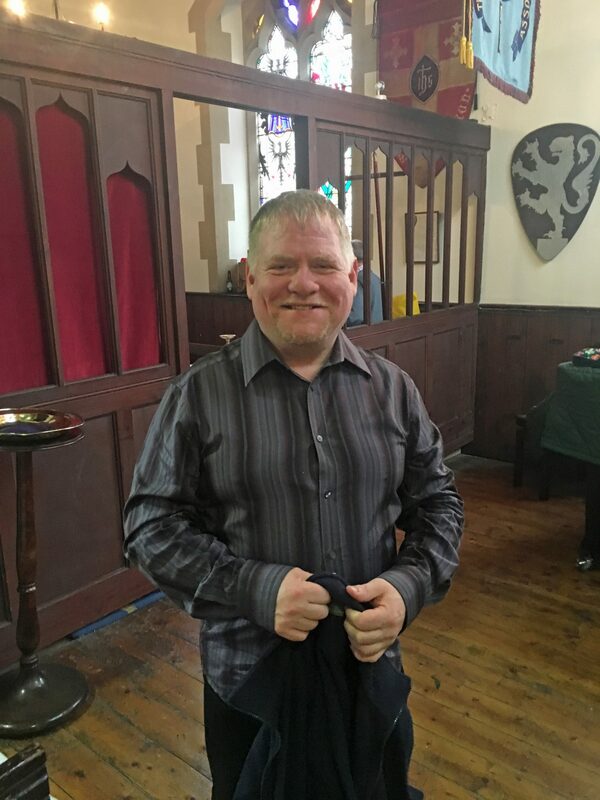 Barnaby Miln is the lay representative of the eight churches of the Edinburgh Forth Area Council. He was previously a member of the General Synod of the Church of England. 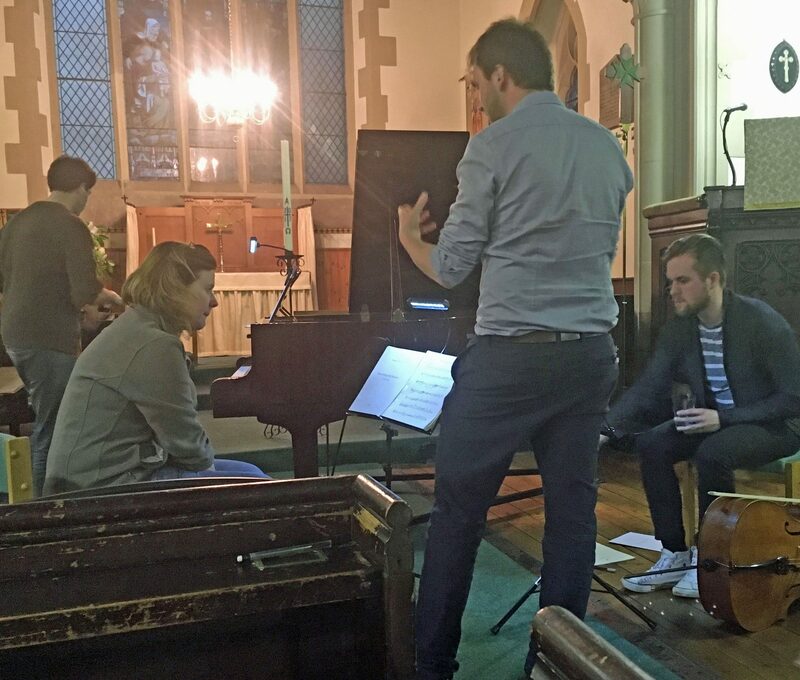 In preparation for the Artisan Trio’s concert at St Vincent’s on Saturday 13th May 2017, St Vincent’s Composer in Residence, Dr Harry Whalley, is seen working with the Trio at their rehearsal in St Vincent’s. This was the first performance of his Pivot and Loop. 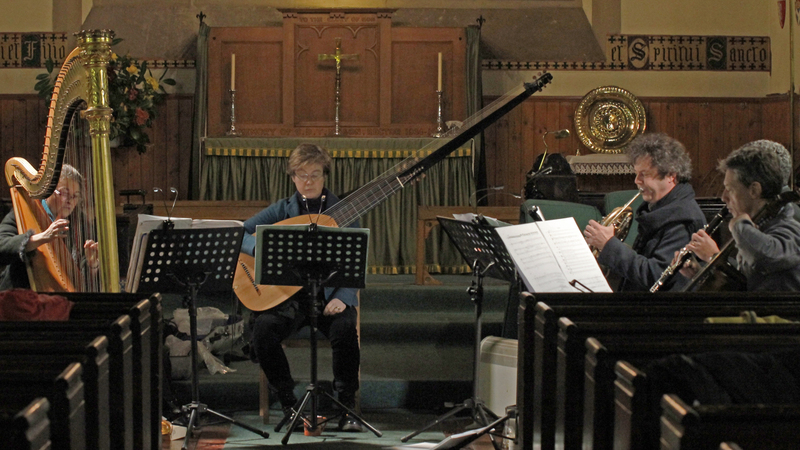 In preparation for the Artisan Trio’s concert at St Vincent’s on Saturday 13th May 2017, composer Dr Suzanne Parry (sitting in the pew) is seen working with the Trio at their rehearsal in St Vincent’s. They played her Haul Away for Heaven. 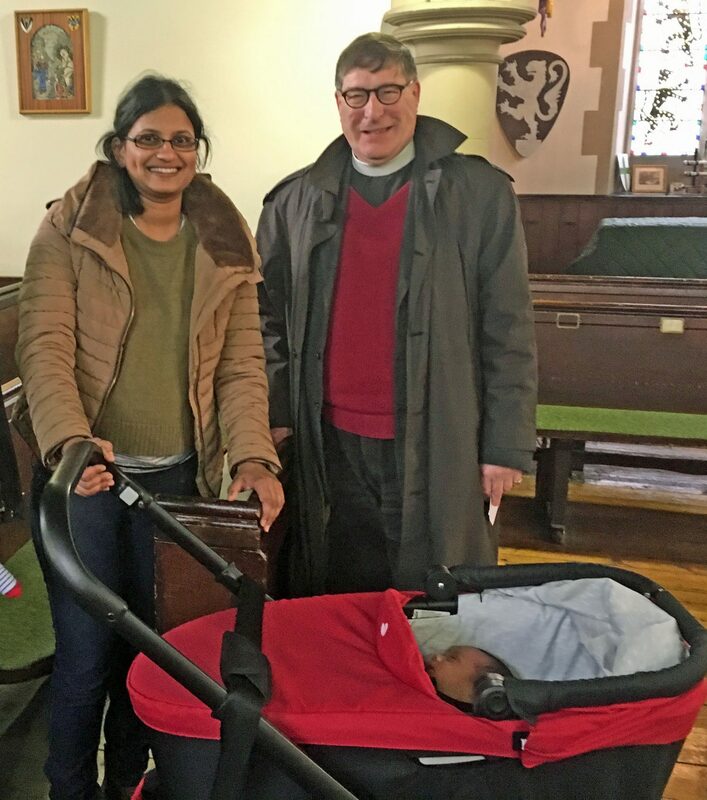 Vestry member Suja Kurien Hartley showing the Rector her son Julian Peter, born on 5th April 2017. 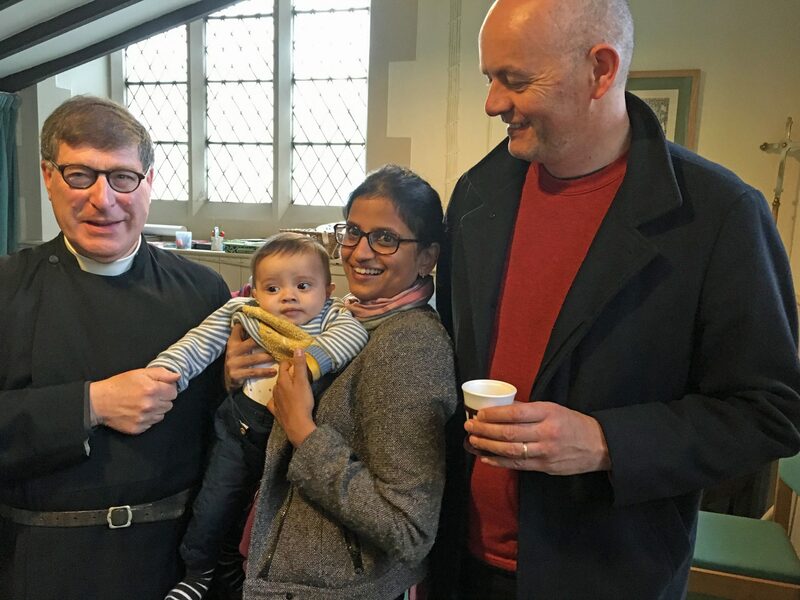 Vestry member Suja Kurien Hartley with her brother (holding eleven month old Zac) and sister-in-law, the Rector and Julian Peter, born on 5th April 2017. 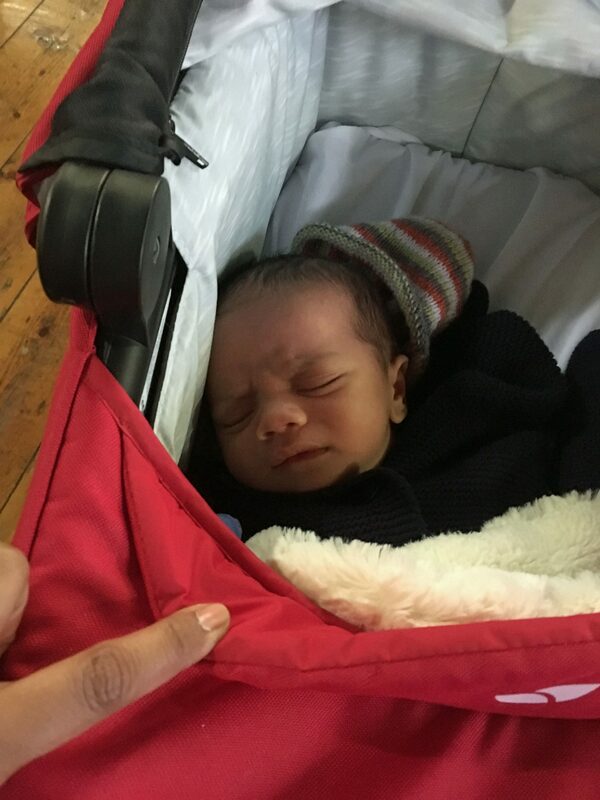 Julian Peter, son of Suja and Jonathan Kurien Hartley, who was born on 5th April 2017. The altar party outside St Vincent’s after the service on Easter Day, Sunday 16th April 2017. 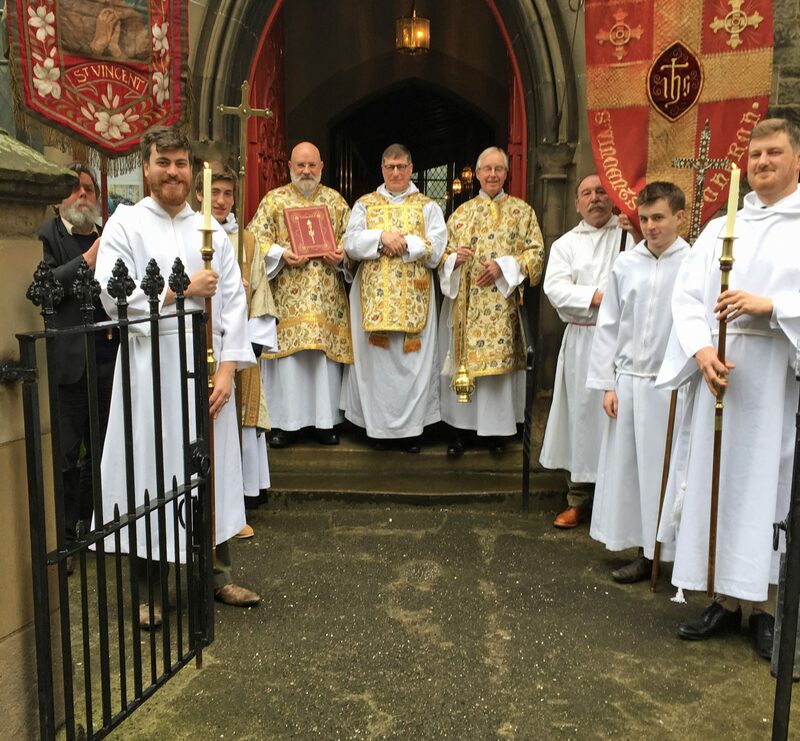 Left to right: Andy Milner, Hector, Lochie, Fr William Mounsey, The Rector, Christopher Hartley (sacristan), Charlie MacLean, Donald-Ian, David. Sara Beevers’ Art Class visited St Vincent’s on 8th March 2017. For over two hours they drew aspects of our architecture. Sara is fifth from the left. 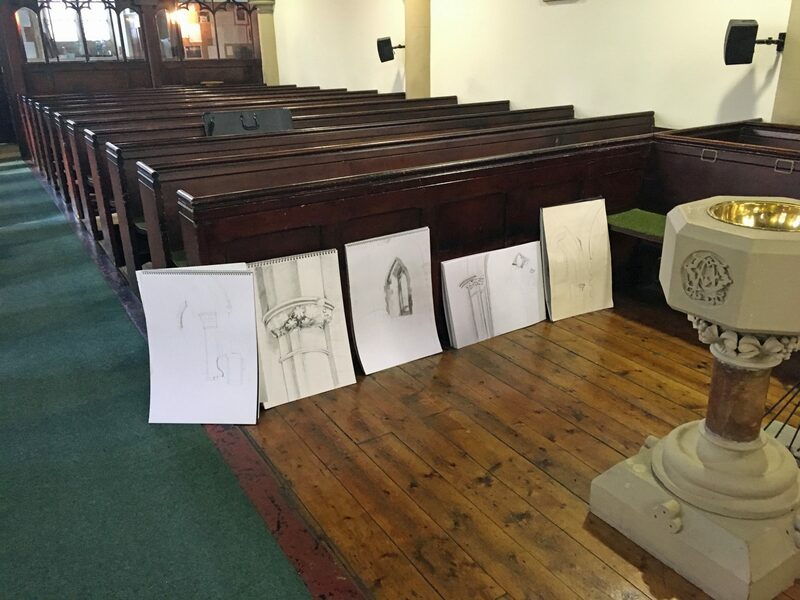 Some of the drawings made on 8th March 2017 when Sara Beevers’ Art Class were at St Vincent’s. 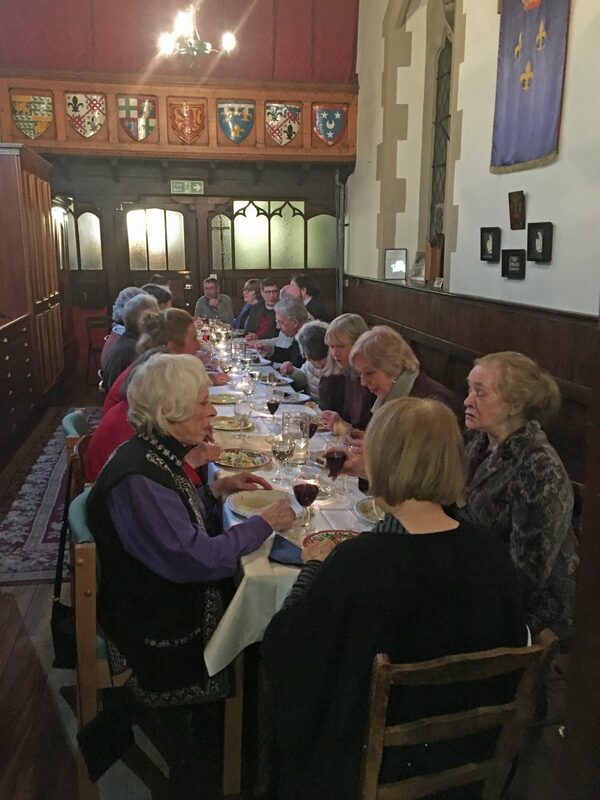 A congregational supper followed Evensong on Saturday 21st January 2017, the Eve of St Vincent’s Day, in the Chapter House within St Vincent’s. 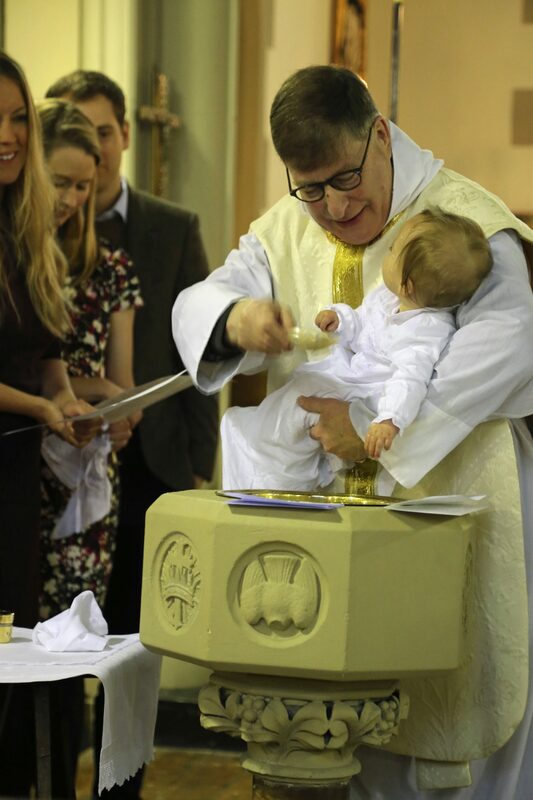 Imogen Rose Strachan is baptised by the Rector, Canon Allan Maclean, at St Vincent’s during the morning service on Sunday 8th January 2017. 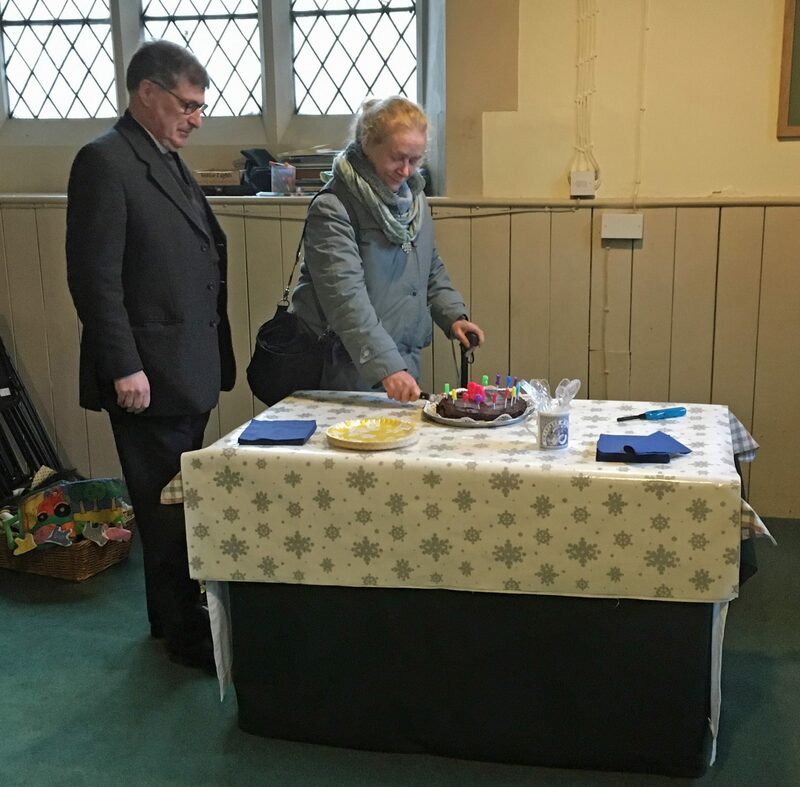 The Rector, Canon Allan Maclean, watches Mrs Jill McClenning cut her special birthday cake following the morning service on Sunday 15th January 2017 at St Vincent’s. 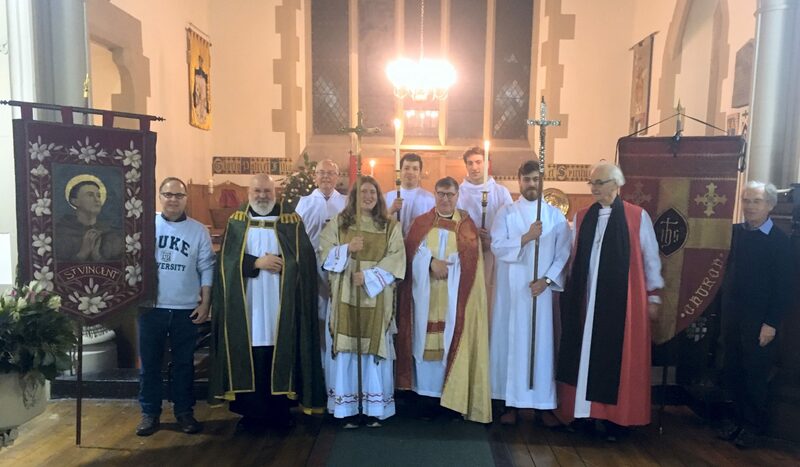 Some of the altar party with the Rector, Canon Allan Maclean, on Christmas morning 2016 outside St Vincent’s. Left to right: Charlie MacLean, Lachlan, Augusta, Canon Allan Maclean, Hector, Christopher Hartley, Lochie. The altar party with the Rector, Canon Allan Maclean, after the service on Christmas morning 2016 outside St Vincent’s. Left to right: Hector, Jamie, Lochie, Christopher Hartley, Canon Allan Maclean, Charlie MacLean, Lachlan, Augusta. 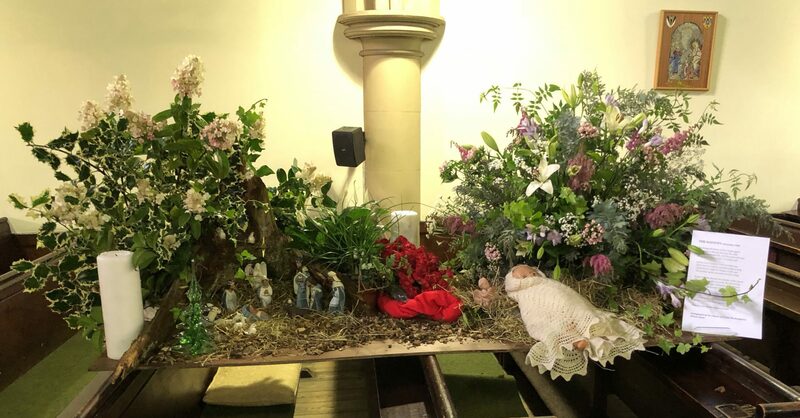 The Reverend Dr Mike Hull is showing children who is in the manger at the Crib Service on Saturday 24th December 2016 at St Vincent’s. 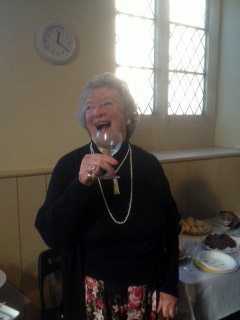 Mrs Jill McClenning celebrated a special birthday at a party on Friday 16th December 2016. 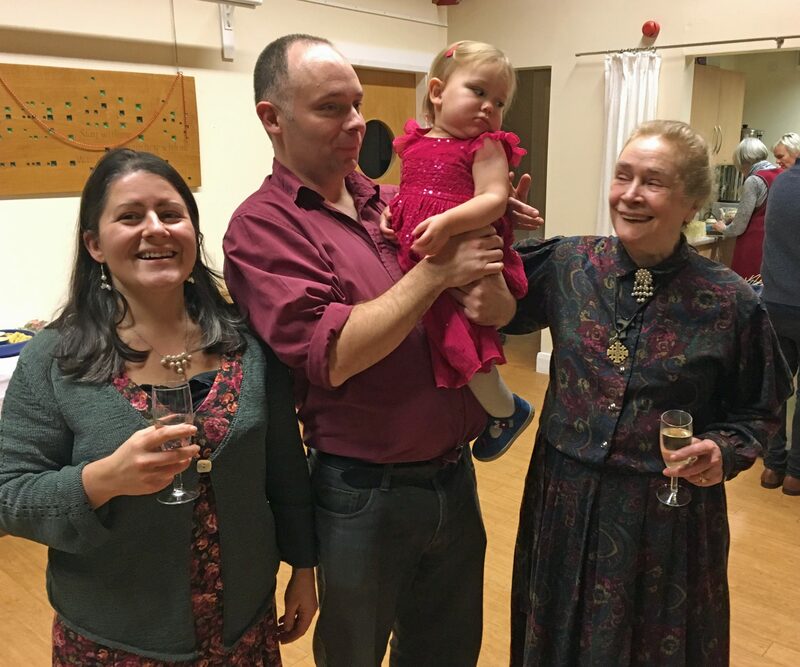 Mrs Jill McClenning with her daughter and husband and granddaughter celebrating a special birthday at a party on Friday 16th December 2016. Some of the guests who joined Mrs Jill McClenning to celebrate a special birthday at a party on Friday 16th December 2016. 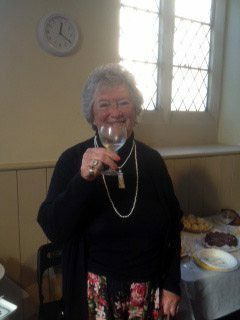 Mrs Jill McClenning celebrated a special birthday at a party on Friday 16th December 2016. The party’s hosts were Mrs Cleodie Mackinnon and Helen Reid-Thomas. In this picture Mrs Mackinnon is with guests the Rector and Mrs Maclean and Mrs Anne Clutterbuck. Watching the adults was Mrs McClenning’s granddaughter, with her father. 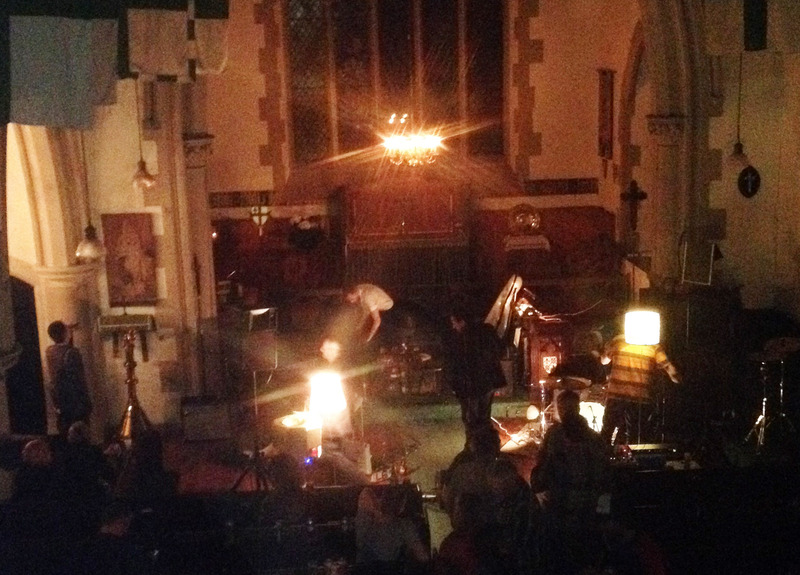 Lizabett Russo launching her new album, The Burning Mountain, at St Vincent’s on Saturday 10th December 2016. 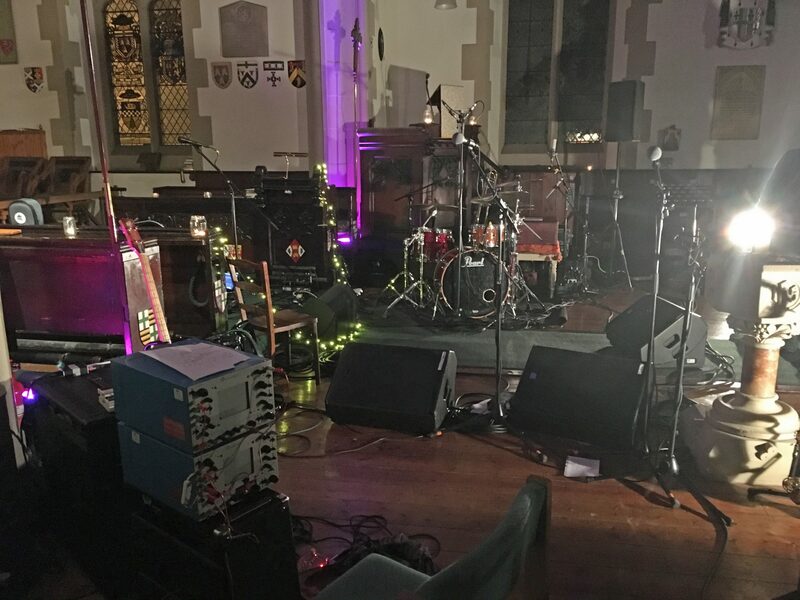 The equipment is set up for a Sink Music concert to launch Lizabett Russo’s new album at St Vincent’s on Saturday 10th December 2016. 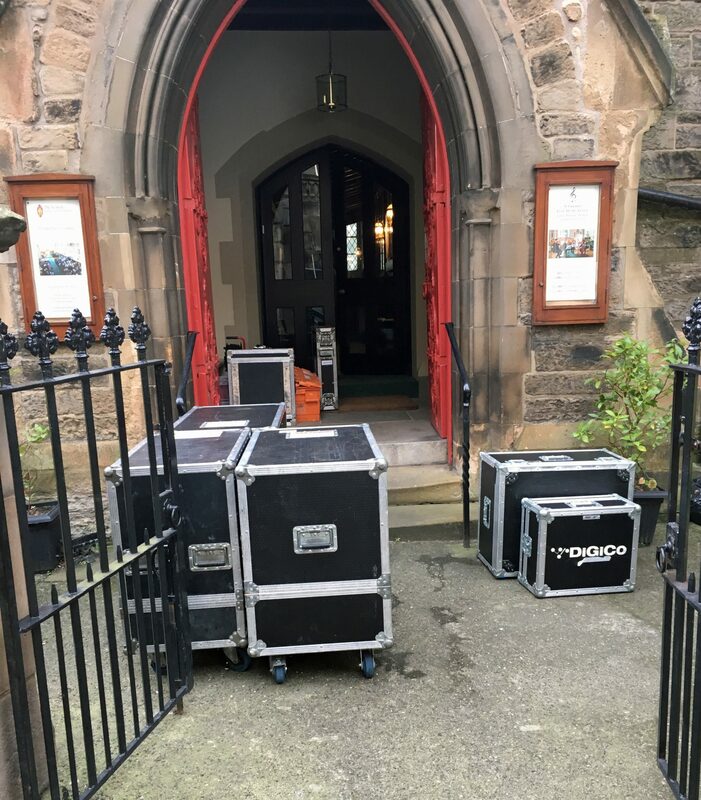 The sound engineer’s equipment arrives for a Sink Music concert to launch Lizabett Russo’s new album at St Vincent’s on Saturday 10th December 2016. The Right Reverend Brian Smith married Diana Stevenson and Ian Paton at St Vincent’s on 6th December 2016. A coach heading for the reception, following the marriage between Diana Stevenson and Ian Paton at St Vincent’s on 6th December 2016 conducted by the Right Reverend Brian Smith. 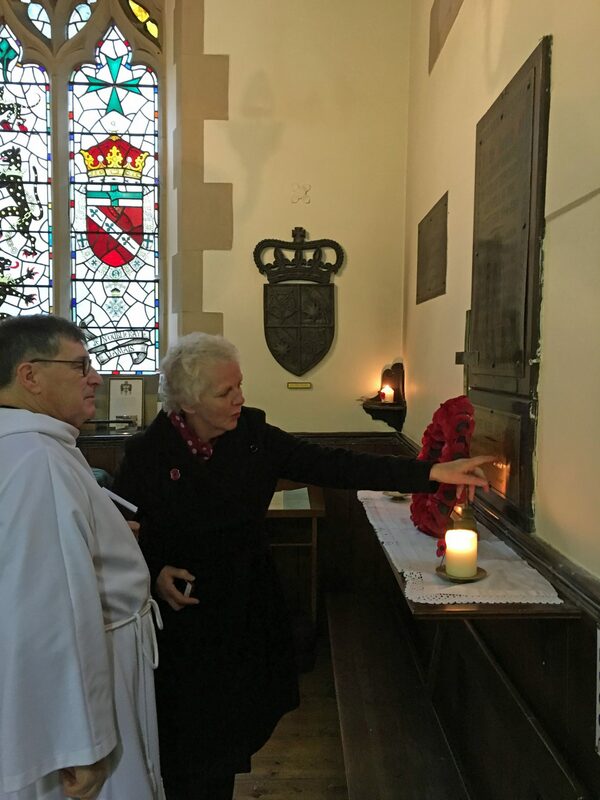 On Remembrance Sunday 2016, Judy Gregg had travelled from Crieff to remember three of her relatives whose names appear on the War Memorial at St Vincent’s. In this photograph Judy is showing the Rector the names of those relatives. 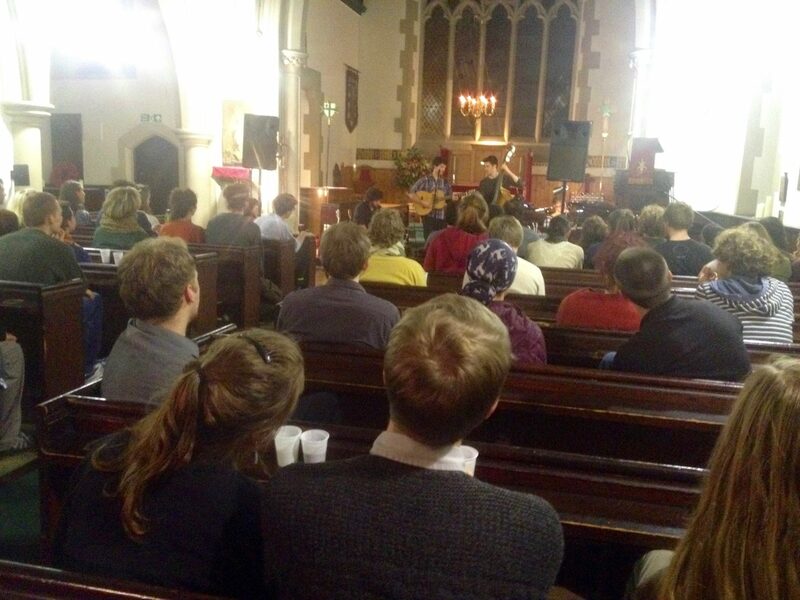 Darragh Quinn brought friends Berlinn Jiang from the Isle of Man for a much appreciated folk concert at St Vincent’s on Halloween, 31st October 2106. Their background lighting was particularly appropriate for the evening. 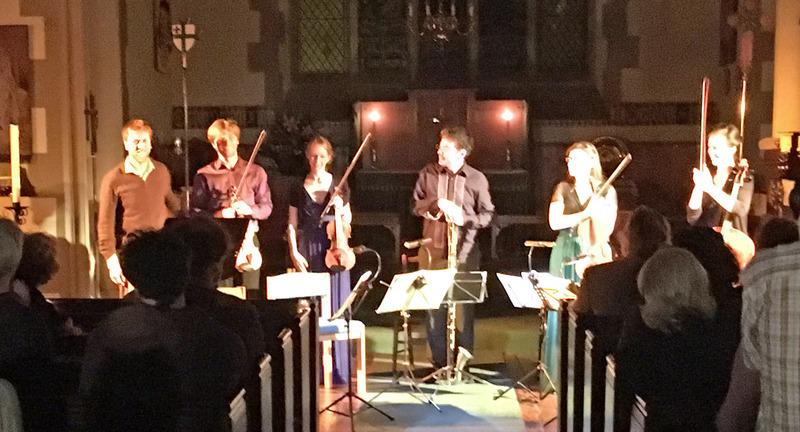 Our Composer in Residence, Dr Harry Whalley (on the left), receiving the rapturous applause not just of the audience but of the Gildas Quartet at a concert at St Vincent’s on Saturday 22nd October 2016. The final work played, A Report to History, had been composed very recently by Harry Whalley to fill the specific acoustics of St Vincent’s. Dr Whalley said ‘The work ‘fits’ inside St Vincent’s, not only taking advantage of the acoustics, but also reflects the contemplative nature of the space’. 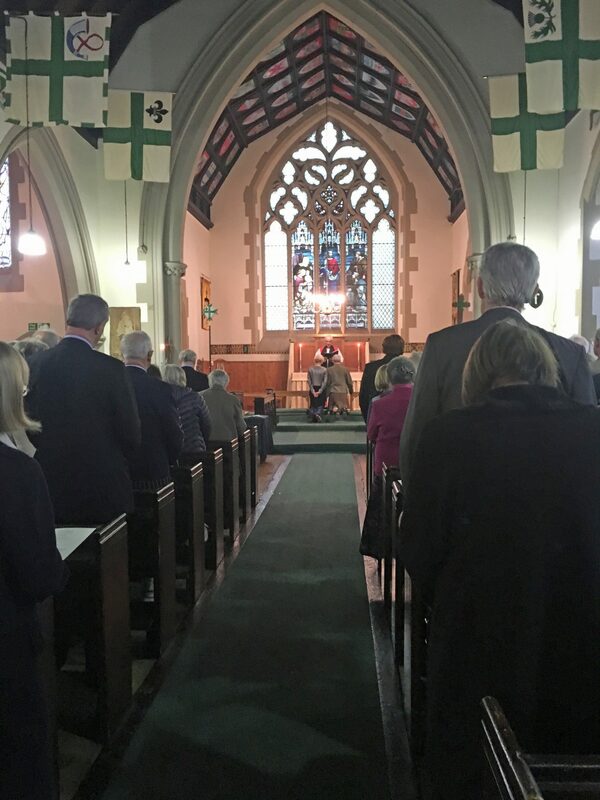 Parents and Godparents watch as Canon Allan Maclean prepares to baptise Findlay Walsh at St Vincent’s on Sunday 2nd October 2016 as part of the Harvest Festival Sung Eucharist. Hector Maclean is watching his Father. 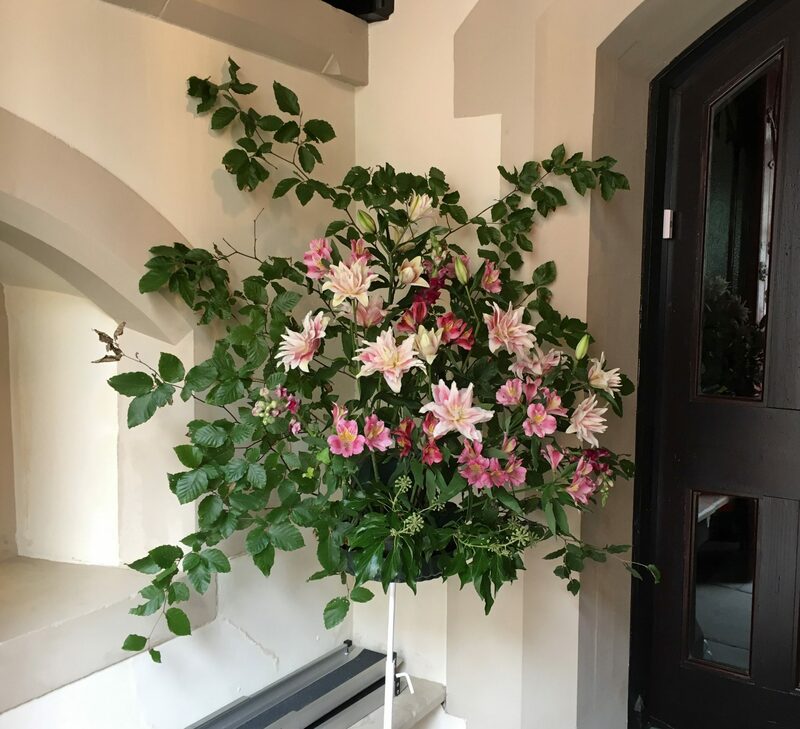 Front entrance flowers for Doors Open Day on 24th and 25th September 2016 when over 500 people visited St Vincent’s. 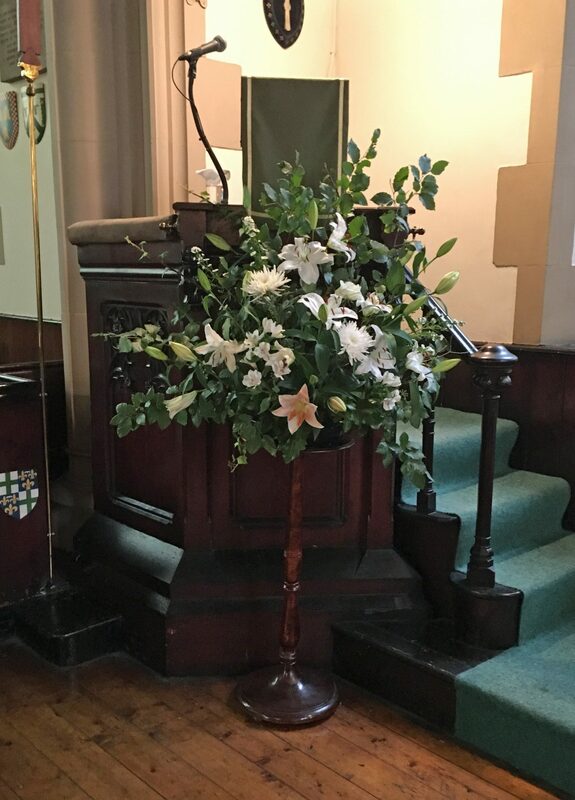 Pulpit flowers for Doors Open Day on 24th and 25th September 2016 when over 500 people visited St Vincent’s. 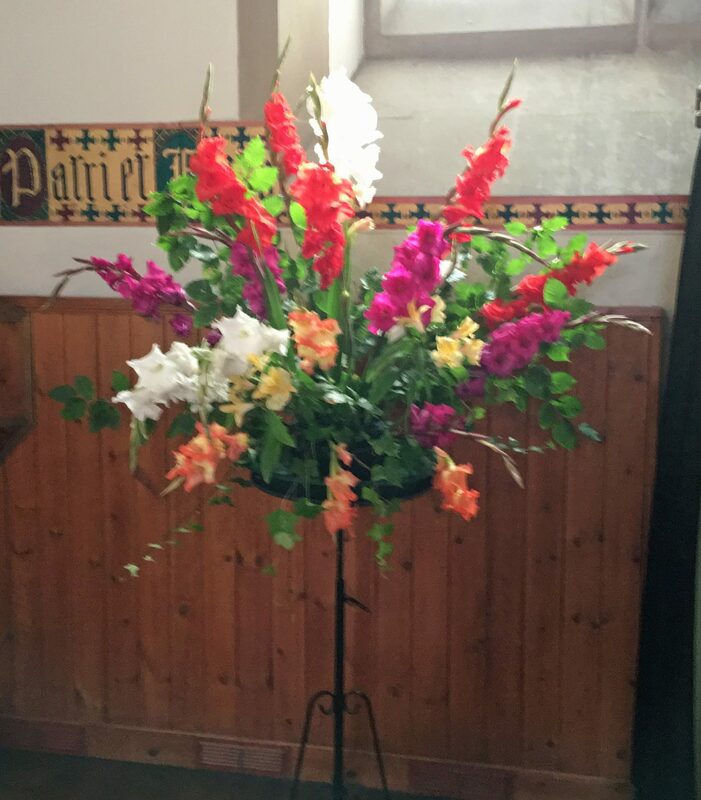 Altar flowers for Doors Open Day on 24th and 25th September 2016 when over 500 people visited St Vincent’s. 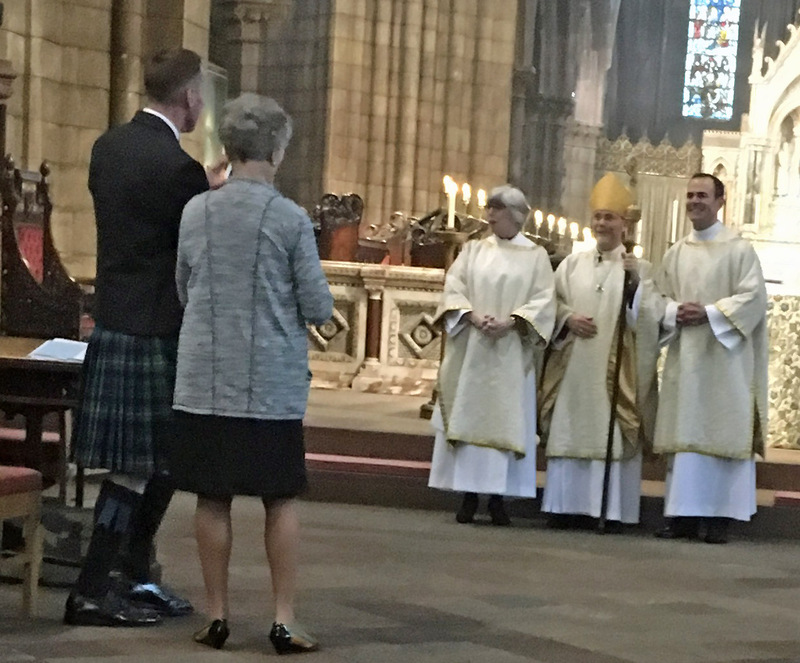 Oliver Brewer-Lennon’s partner Joe and Mother, from the USA, watching Oliver who is on the right of the Bishop of Edinburgh following his ordination as a deacon in the Scottish Episcopal Church on 25th September 2016. Oliver was on a research placement at St Vincent’s in the Spring of 2016. 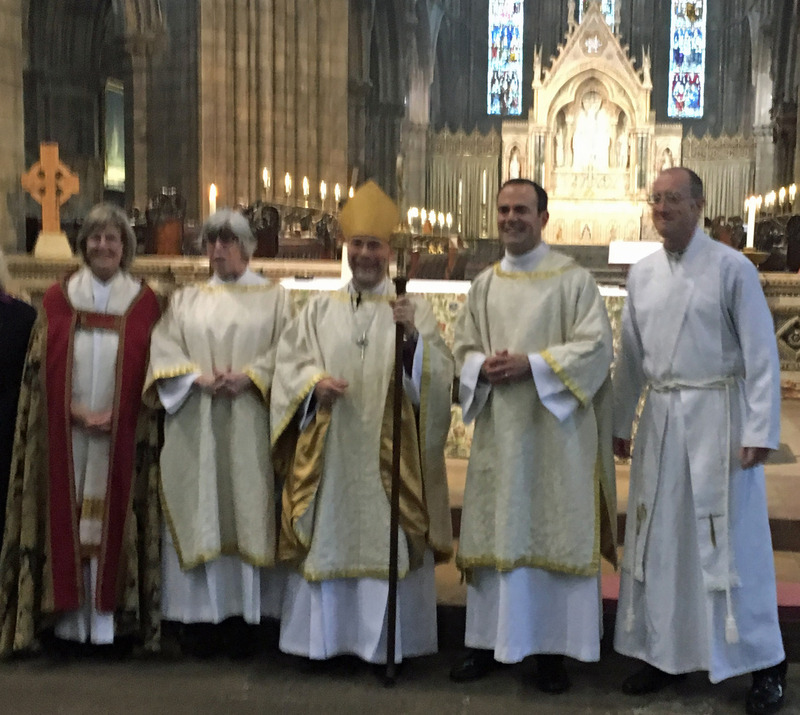 The Reverend Oliver Brewer-Lennon, to the right of the Bishop of Edinburgh, following his ordination as a deacon in the Scottish Episcopal Church on 25th September 2016. 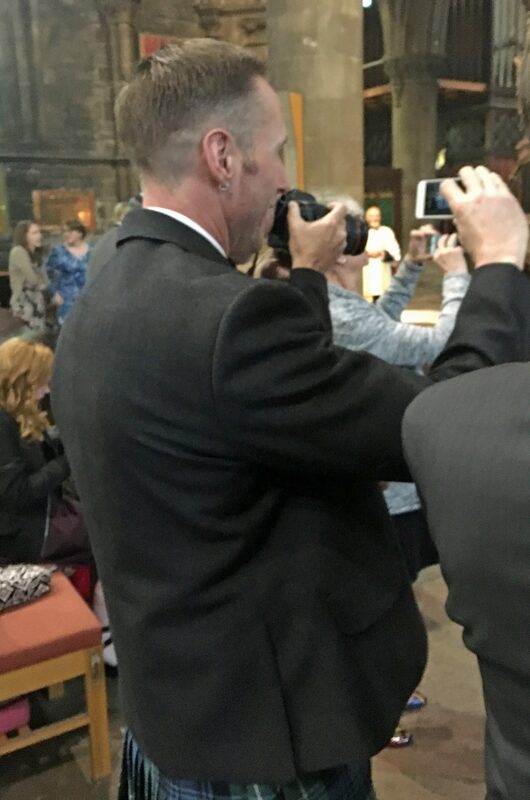 Oliver’s partner, Joe Brewer-Lennon, taking photographs in the Cathedral following Oliver’s deaconing by the Bishop of Edinburgh on 25th September 2016. 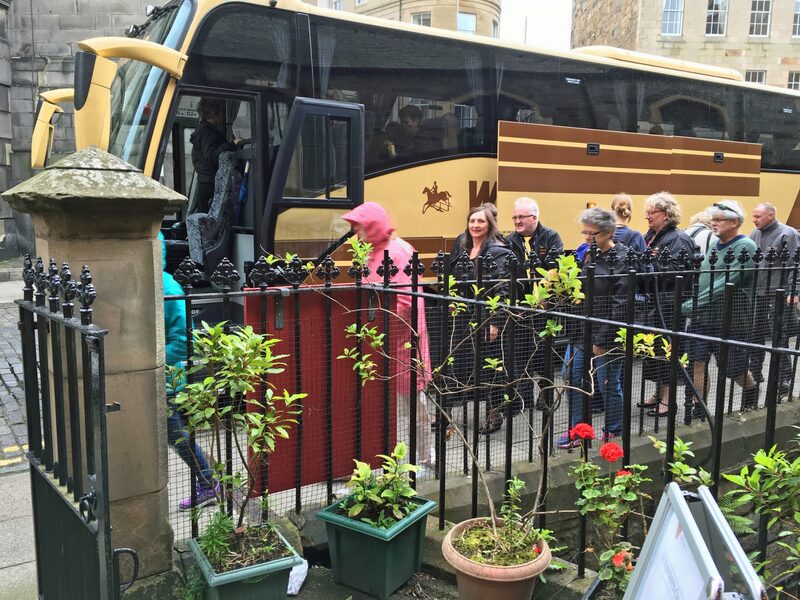 Sundown Swing performers arriving by coach for their August 2016 Fringe show at St Vincent’s. They hail from Yorkshire and had a particularly appreciative audience for their afternoon show. 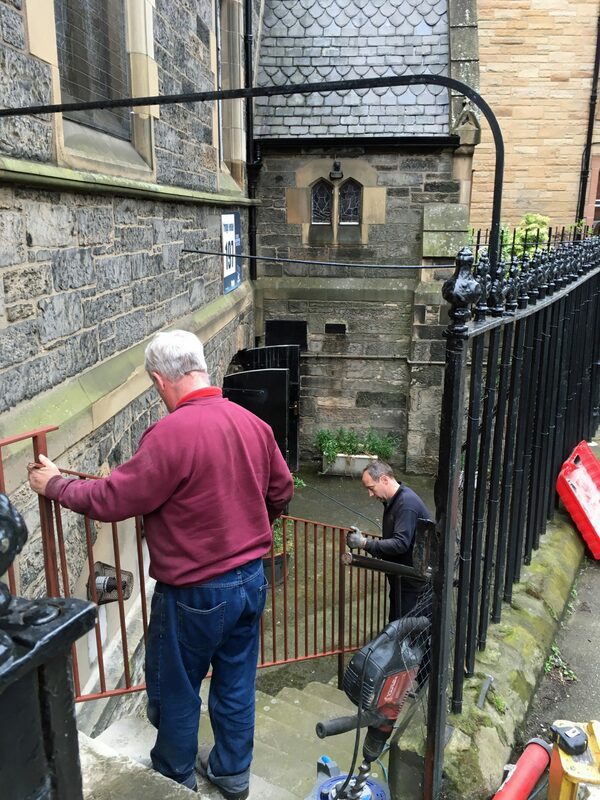 A new railing is fitted to the steps to the undercroft at St Vincent’s by father and son Graeme Brodie, blacksmiths. There had been no railing previously. 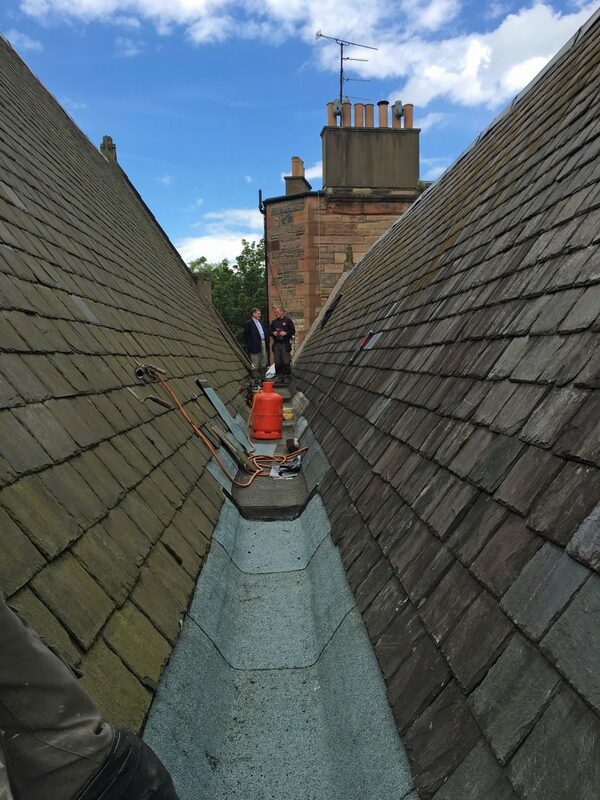 Decorators repairing storm damage following roof repairs in July 2016. 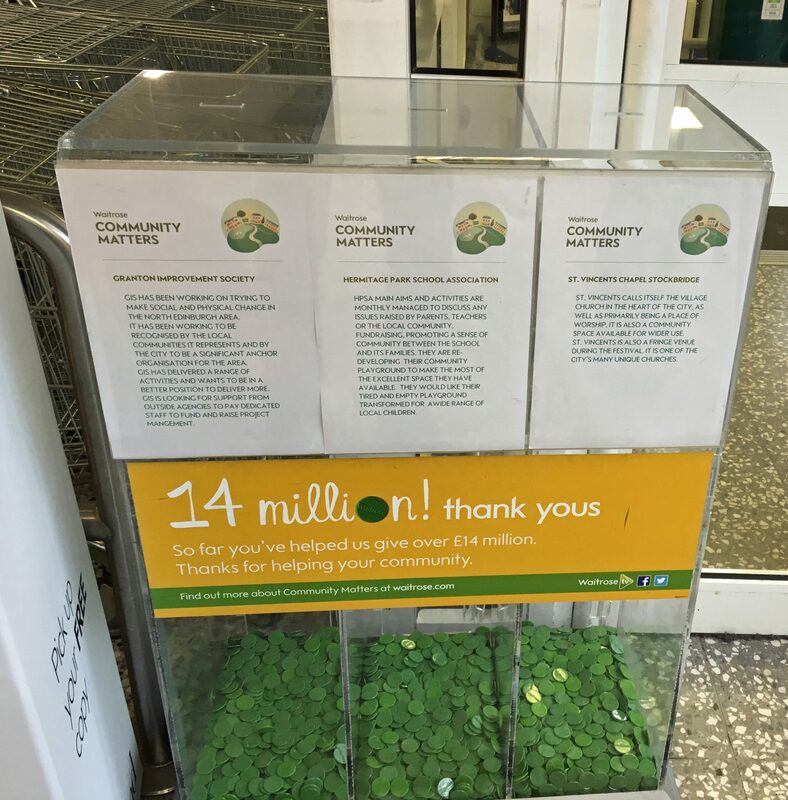 During July 2016 customers of Waitrose, Comely Bank, had the opportunity to support St Vincent’s with the token they are given at the till. 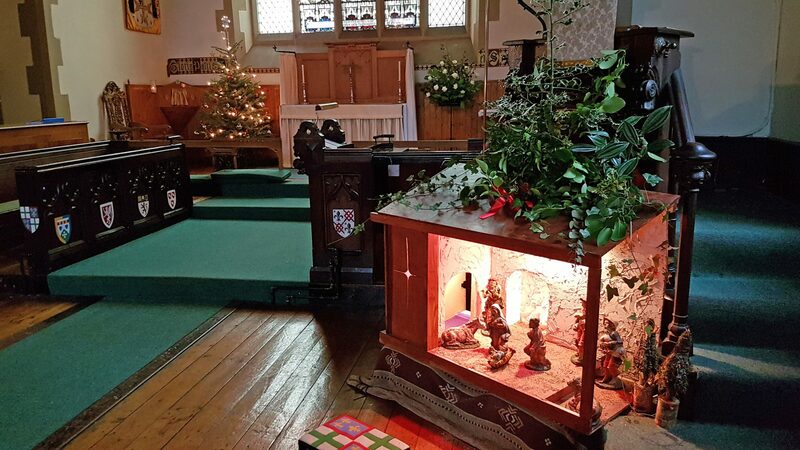 The member of our congregation who arranged this is to be warmly thanked. Waitrose have presented St Vincent’s with a cheque for £335.00. 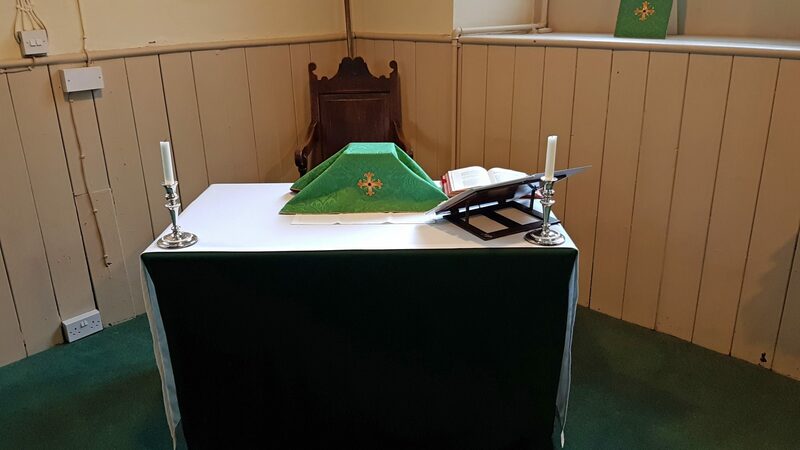 The Refectory altar at St Vincent’s prior to a Thursday morning Eucharist in June 2016. 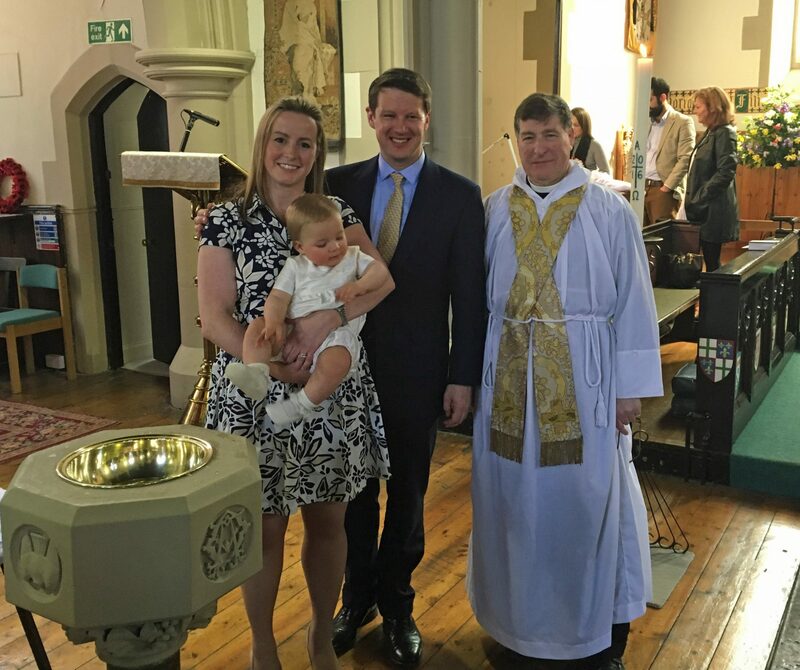 William Charles Edward Webb’s baptism on Sunday 24th April 2016 by the Rector of St Vincent’s, Canon Allan Maclean, standing with parents Edward and Elizabeth. 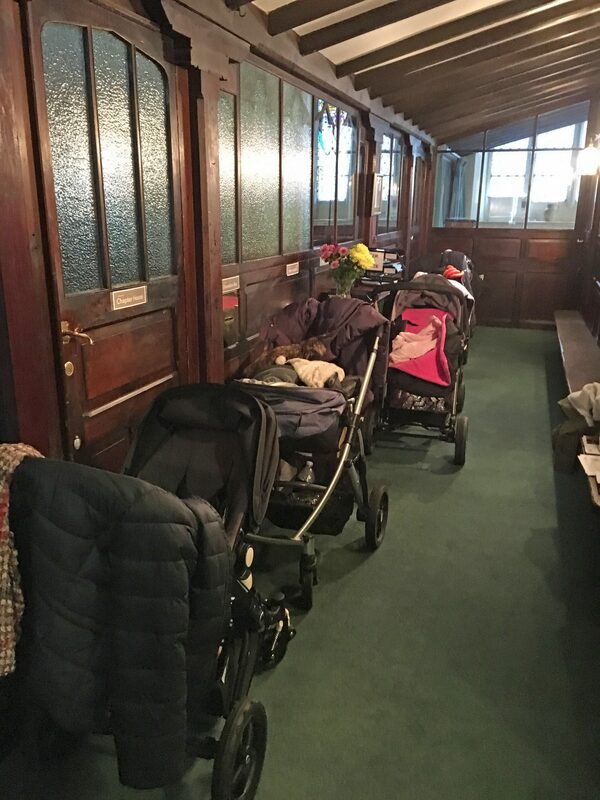 The prams are lined up in the vestibule at St Vincent’s for the regular Tuesday morning MooMusic sessions. 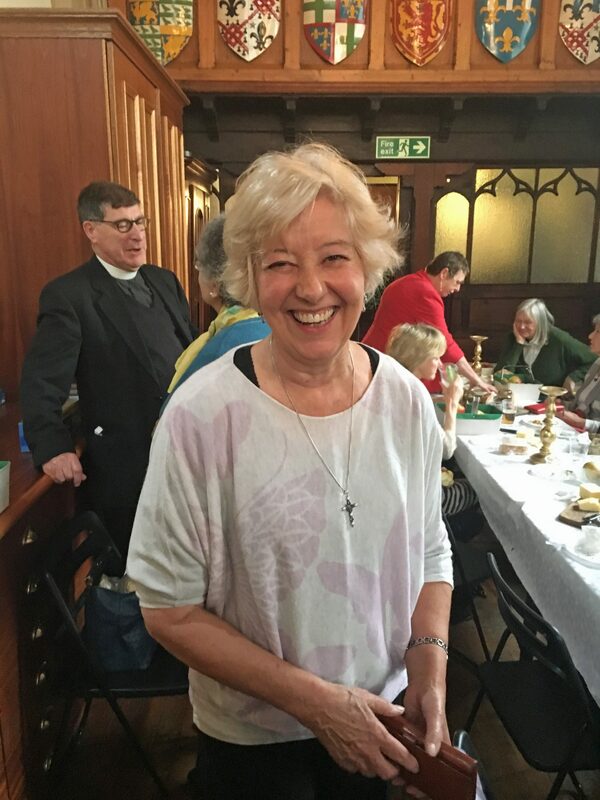 On Christmas Morning 2015 at St Vincent’s, with a congregation double the size of a year ago, there were nine in the Sanctuary Party. Here they are – front row: Ewan MacLean on left and Lachlan MacLean on right. David Lindsay, Augusta Maclean and Hector Maclean in the centre. 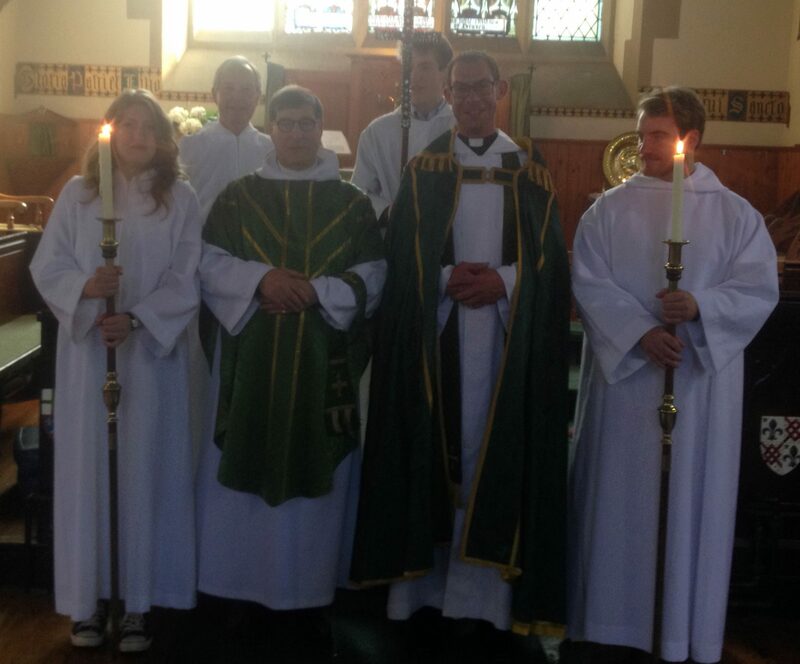 In the centre: Christopher Hartley the Sacristan, The Rector who celebrated, Rev Dr Mike Hull the preacher. 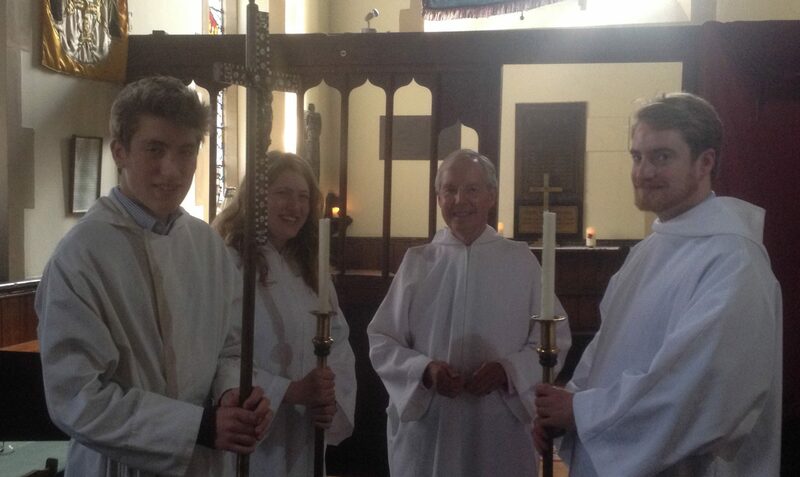 Lochie Maclean, crucifer is at the back. 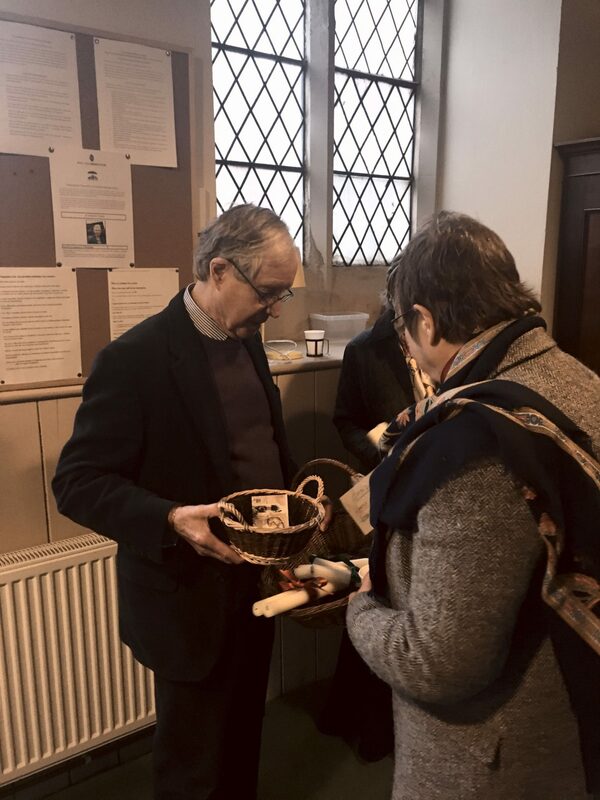 Within Augusta’s large porringer is the sprig of heather from the battle site of Sheriffmuir of 1715 – which the Rector used to asperge the congregation. Sometime Secretary General of the Anglican Communion, Canon Sam Van Culin, preached at St Vincent’s on Sunday 13th September 2015. Now retired he is attached to Washington National Cathedral. 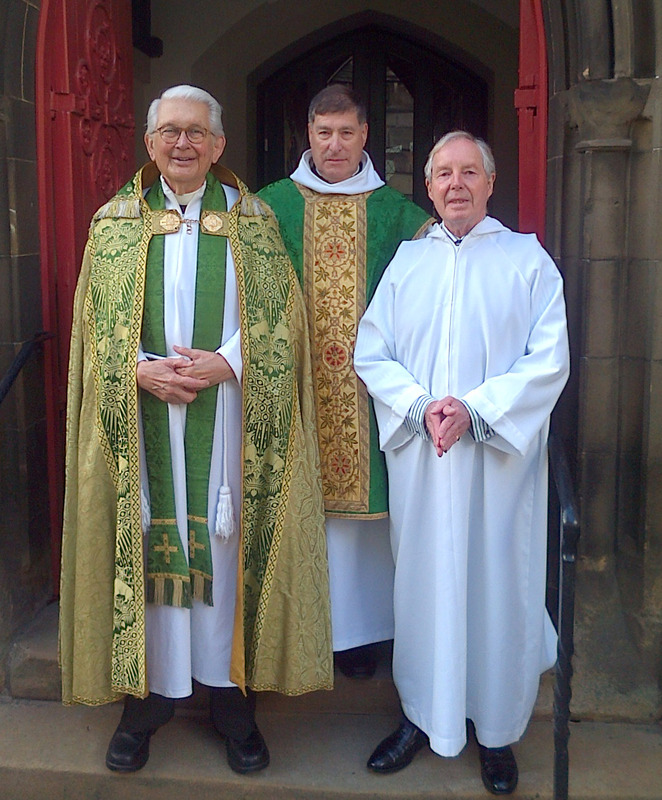 With him are the Rector, Canon Allan Maclean and Sacristan, Christopher Hartley. 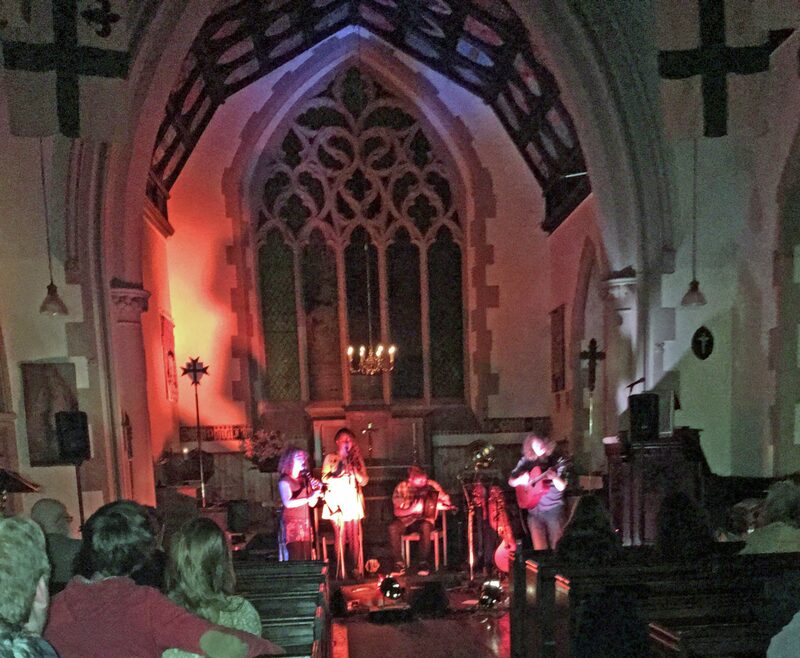 Darragh Quinn and friends at the launch of his EP concert on 10th November 2015 at St Vincent’s. 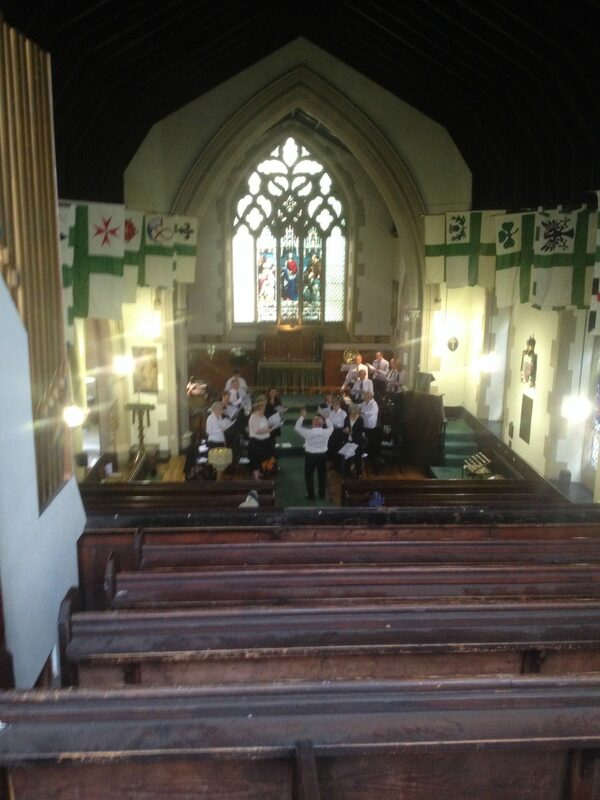 The recording had been made in St Vincent’s in June 2015. 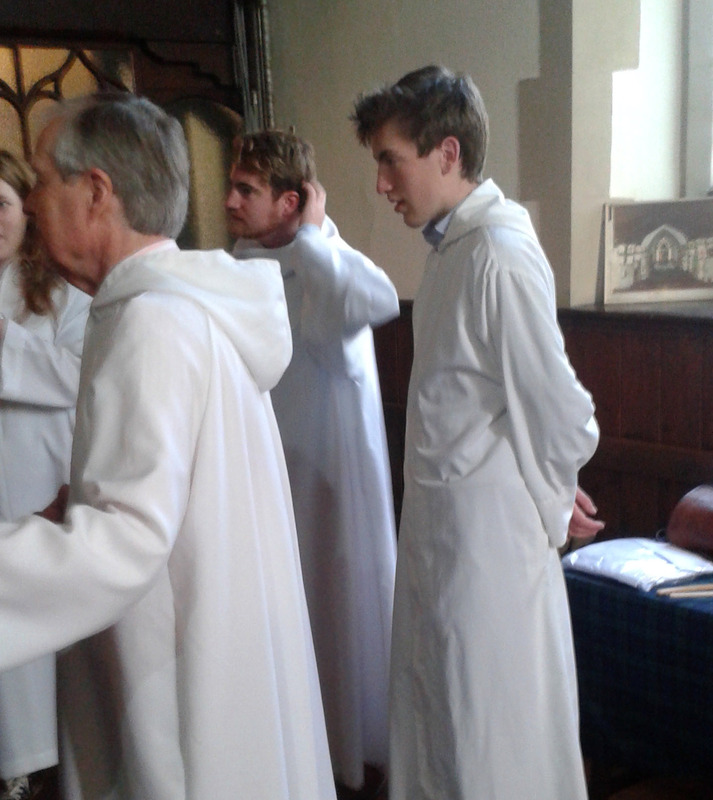 Our Sacristan, Christopher Hartley, at the vestment wardrobe with Augusta, Matthew and Lochie prior to Sunday Eucharist on 23rd August 2015. 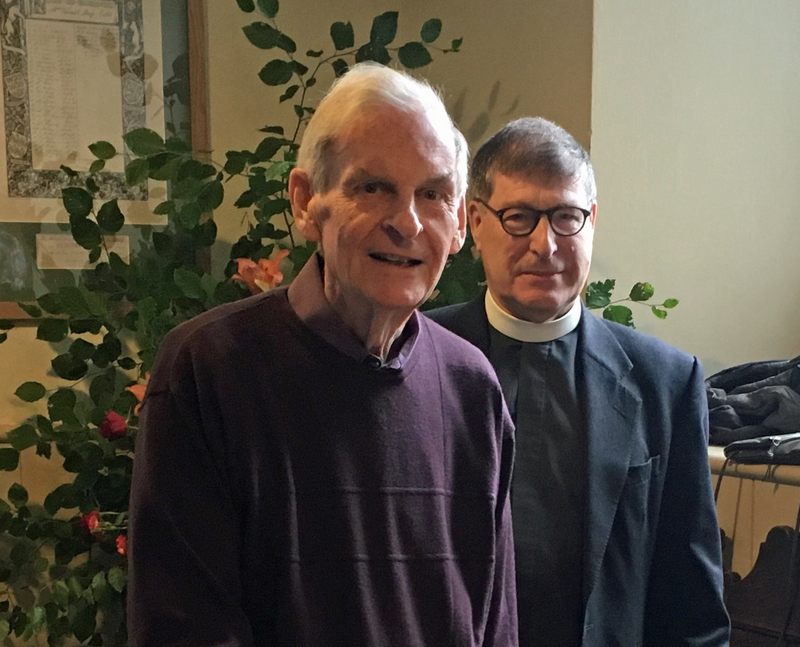 Canon Allan Maclean and the Reverend William Mounsey (Rector and Assistant Priest) on Doors Open Day, 26th September 2015. 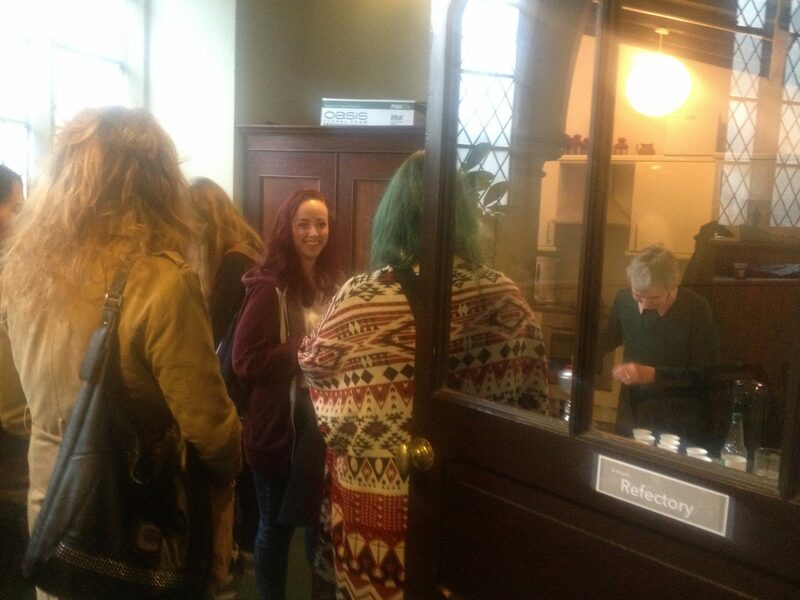 Christina Paulson-Ellis, our magazine editor, serving refreshments to visitors in the refectory on Doors Open Sunday afternoon 27th September 2015. 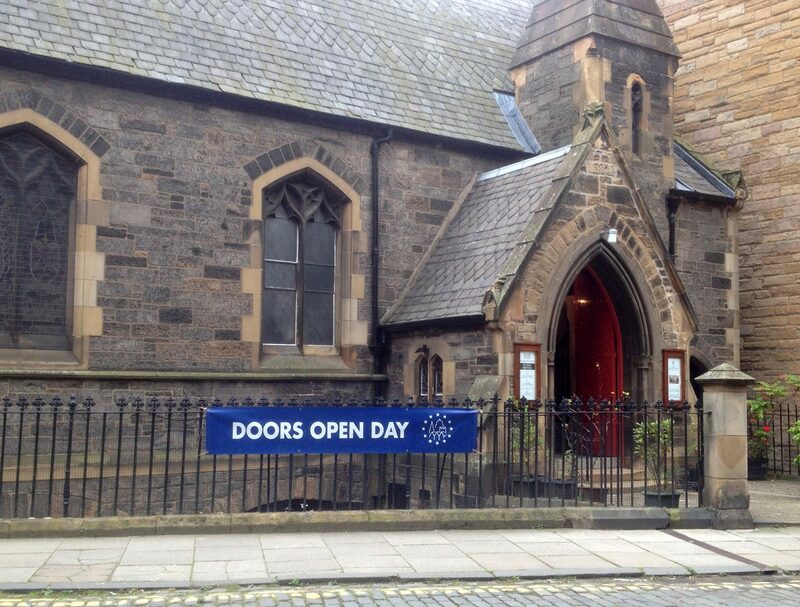 We welcomed 820 visitors to St Vincent’s during Doors Open weekend, 26th and 27th September 2015. Stewards answered questions and refreshments were served. 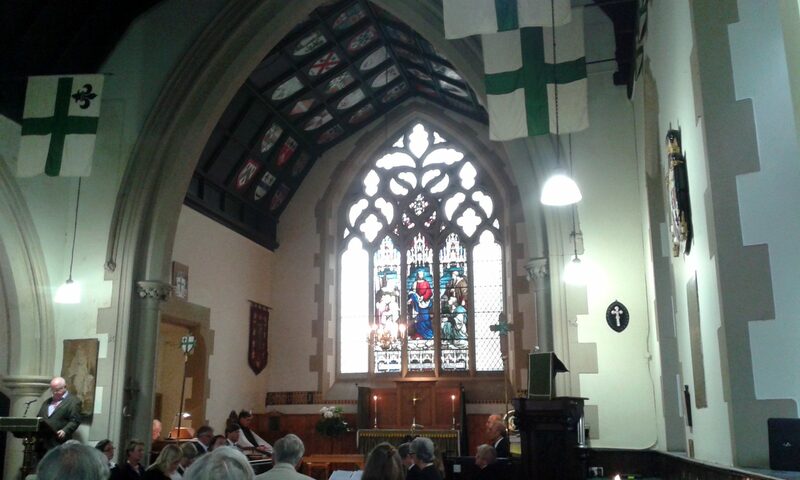 Music – singing, piano and organ – on Saturday. 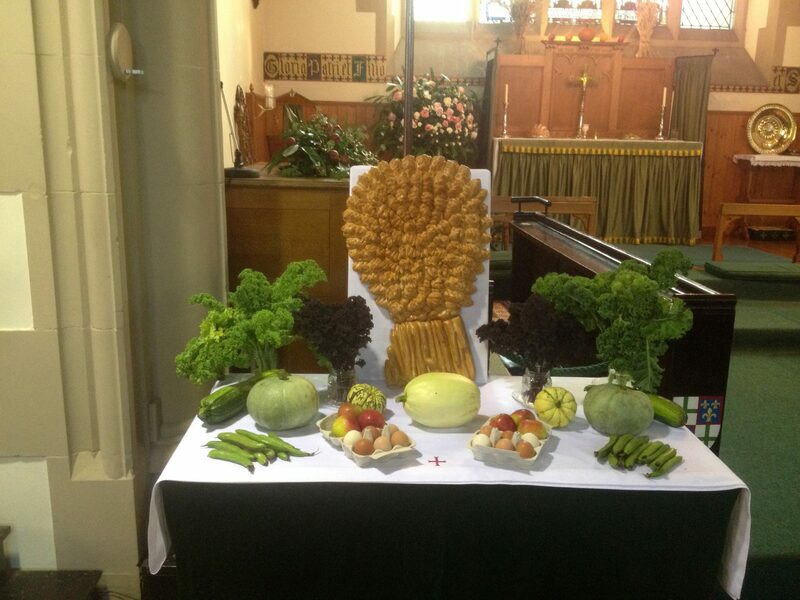 The Rector, Canon Allan Maclean, conducted the Harvest Services on Sunday 27th September 2015 at St Vincent’s. 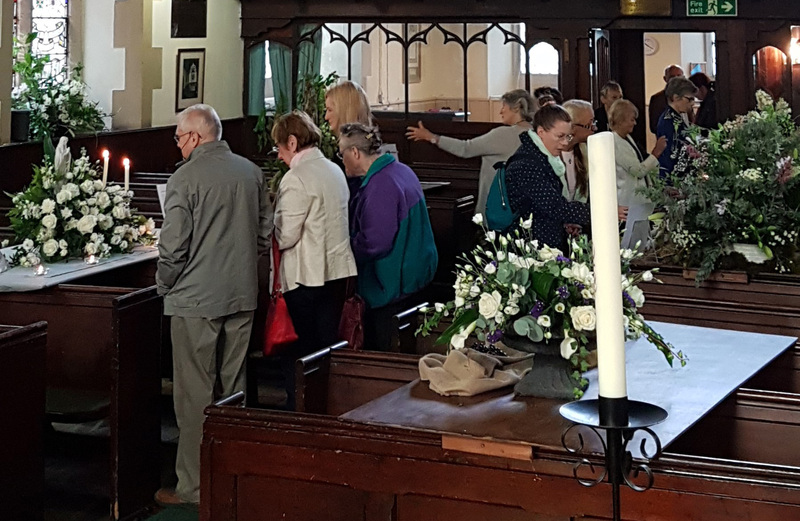 As this was during Doors Open weekend, the church was beautifully decorated with flowers, fruit and vegetables – and much admired by visitors. 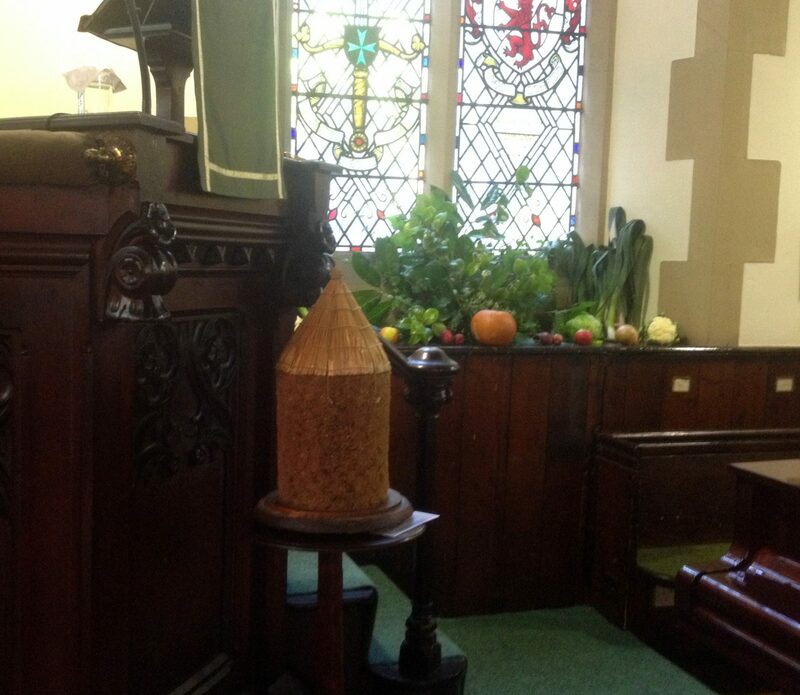 The Hay Stook and harvest decorations for Sunday 27th September 2015. 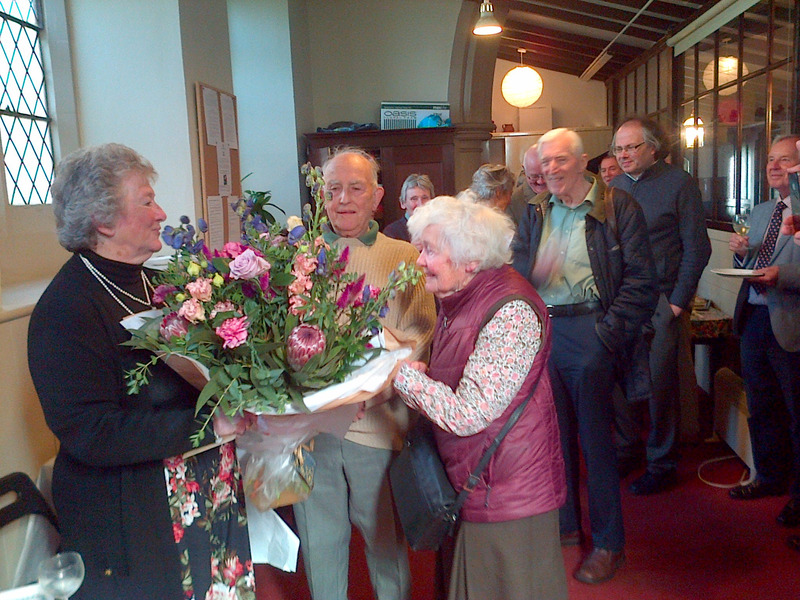 Anne Jarman (left) is presented with flowers by Anne Clutterbuck during the party to thank her for all the wonderful years of organising parties for the congregation of St Vincent’s. Anne’s husband Alan looks on. 6th September 2015. Photo: Allan Maclean. 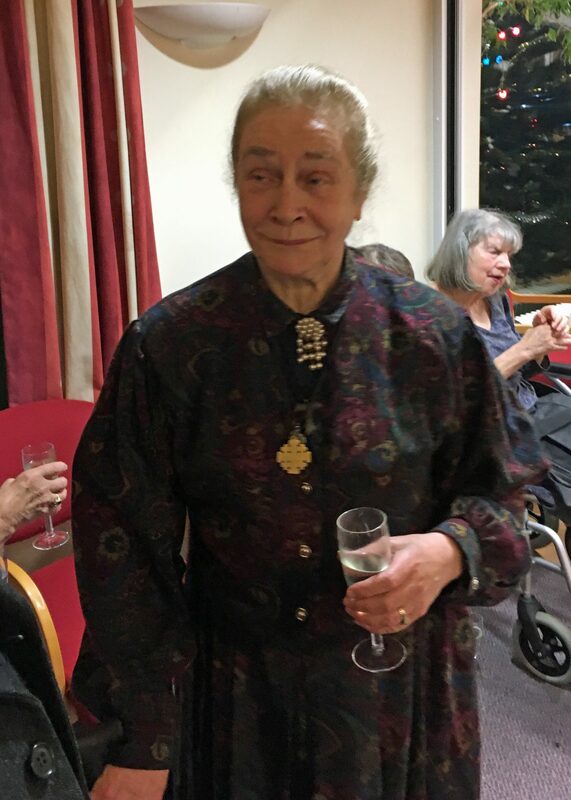 Anne Jarman at her retirement and thank you party at St Vincent’s on 6th September 2015 – many, many years of responsibility for the best of congregational parties. Photo James Holloway. 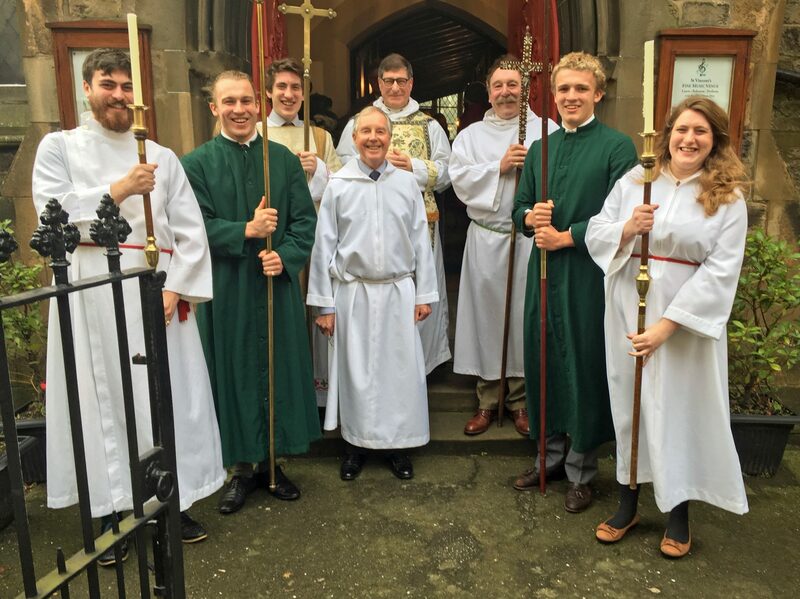 The Rector, Canon Allan Maclean, with guest preacher, the Reverend Fr David Charles, Vicar of Christ Church, Eastbourne, with Sacristan, Christopher Hartley, and servers, Augusta and Lochie Maclean and Matthew Beattie at the Sunday Eucharist on 23rd August 2015. 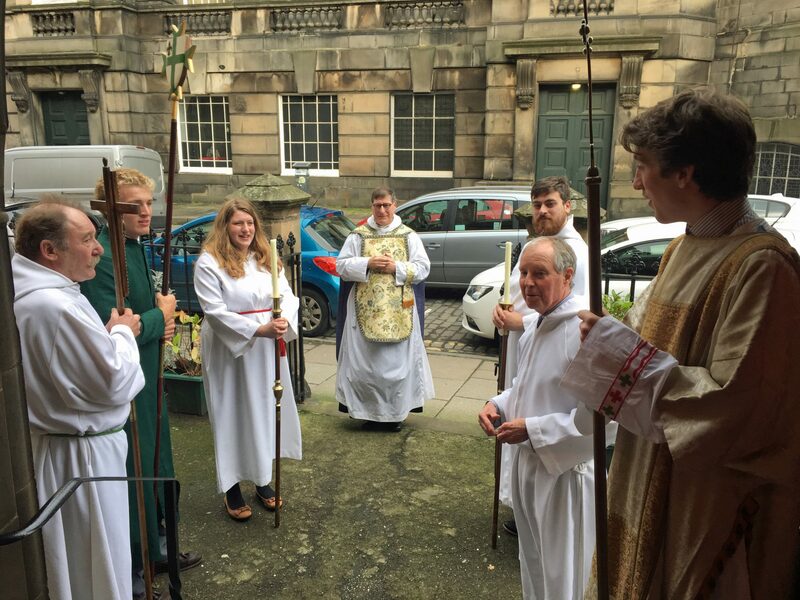 Choral Evensong at St Vincent’s on Saturday 22nd August 2015 as part of the Edinburgh Festival Fringe – Barnaby Miln reading the lesson. 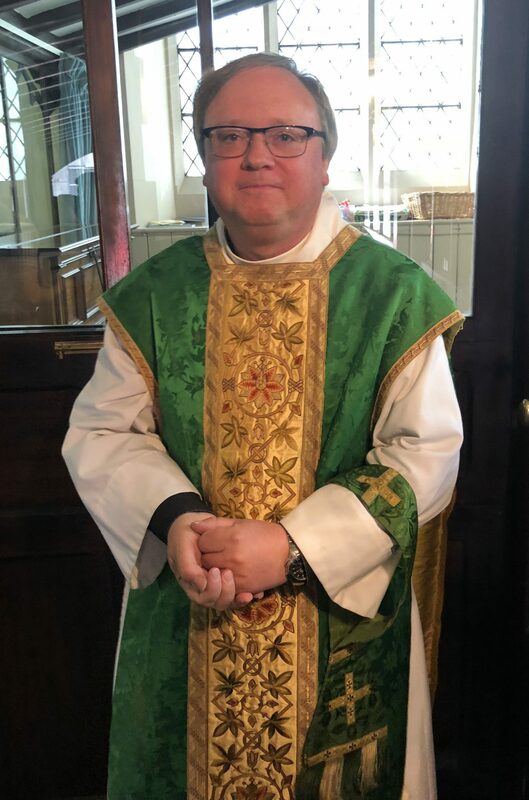 Fr William Mounsey, Assistant Priest, the officiant for this the third of the three Choral Evensongs listed in the official Fringe programme. Choral Evensong at St Vincent’s on Saturday 22nd August 2015 as part of the Edinburgh Festival Fringe. The Chapter House Singers director, Les Shankland, is seen conducting wearing his academic gown. 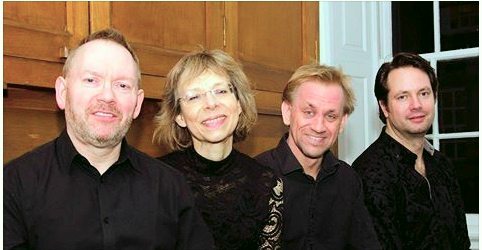 Les Shankland is Director of Music at St Vincent’s. 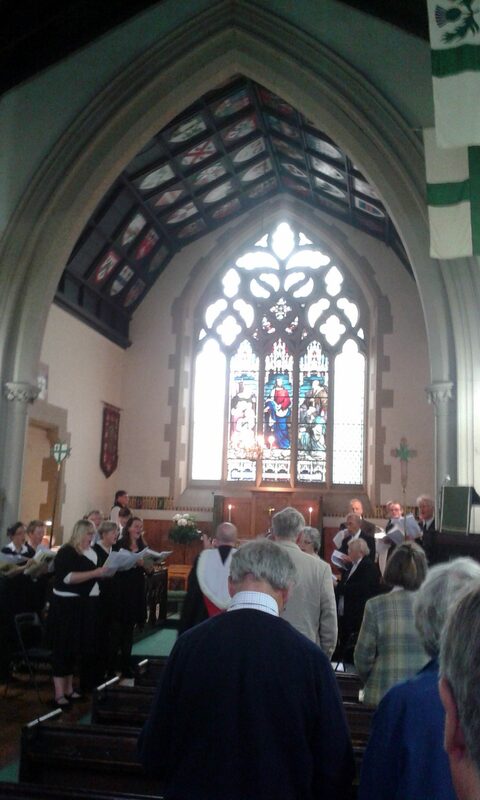 Morley Whitehead was organist at this service, his first encounter with St Vincent’s. The gig at St Vincent’s on Friday 21st August 2015. 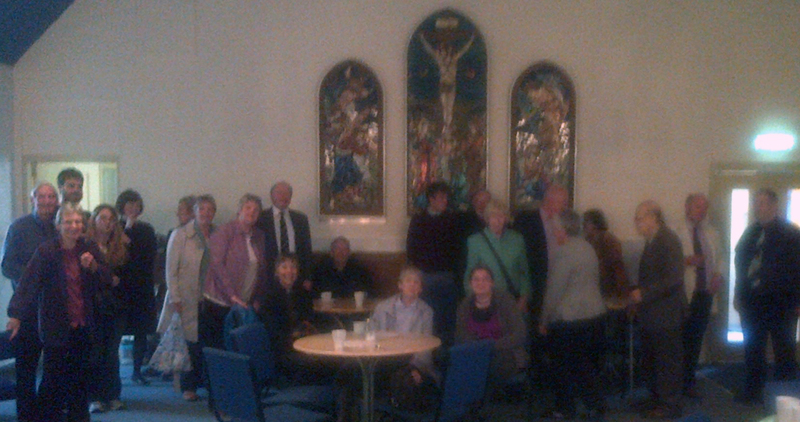 Ninety people attended, average age 40. 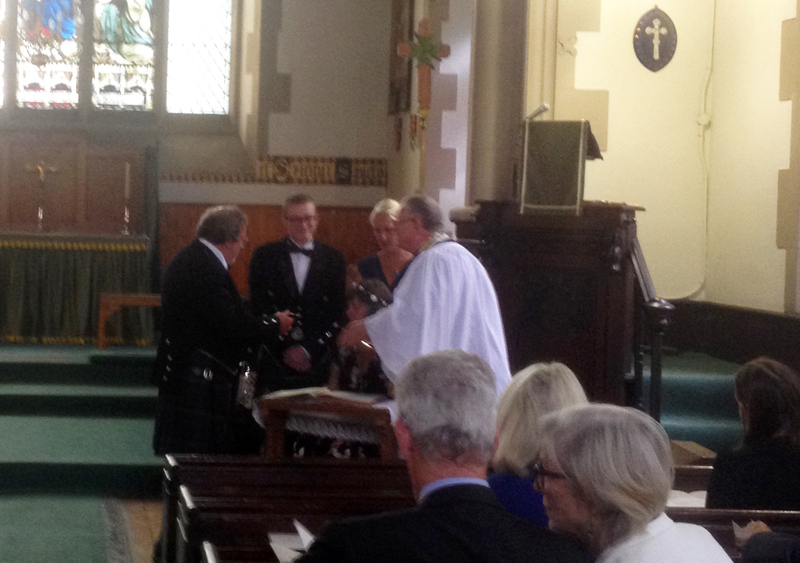 The wedding of Bruce and Carolyn at St Vincent’s on 12th August 2015 – officiant the Reverend Canon Dr Joe Morrow, Lord Lyon King of Arms.